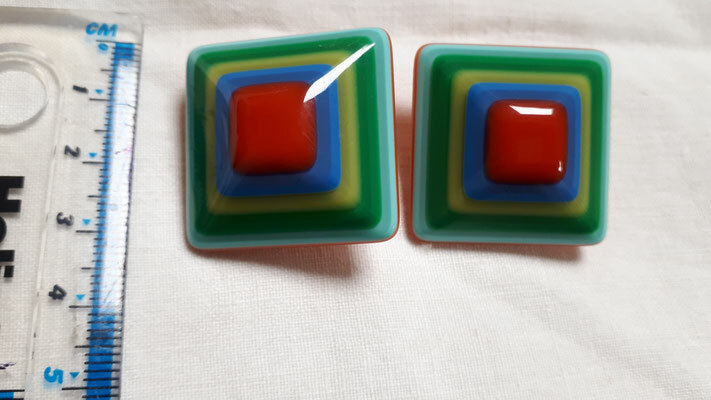 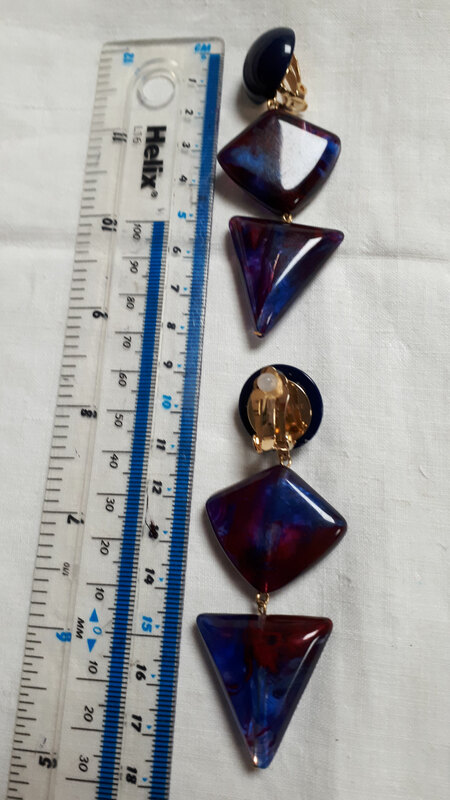 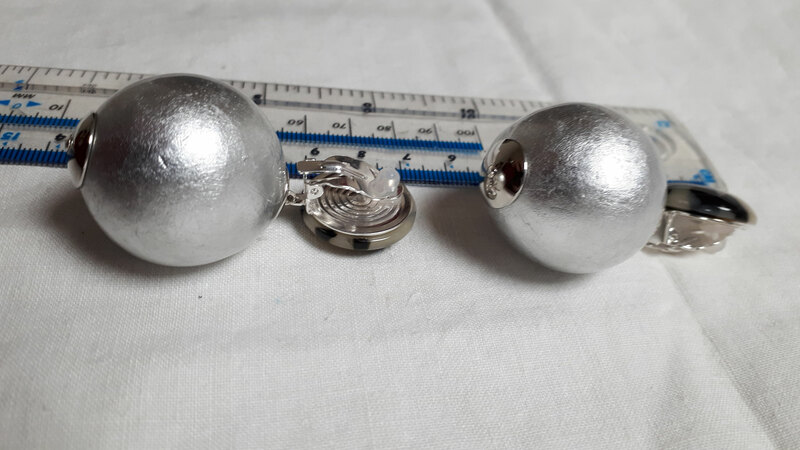 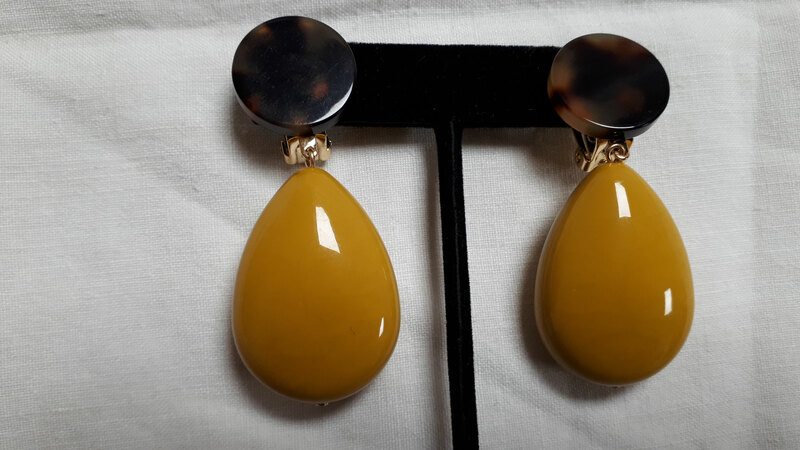 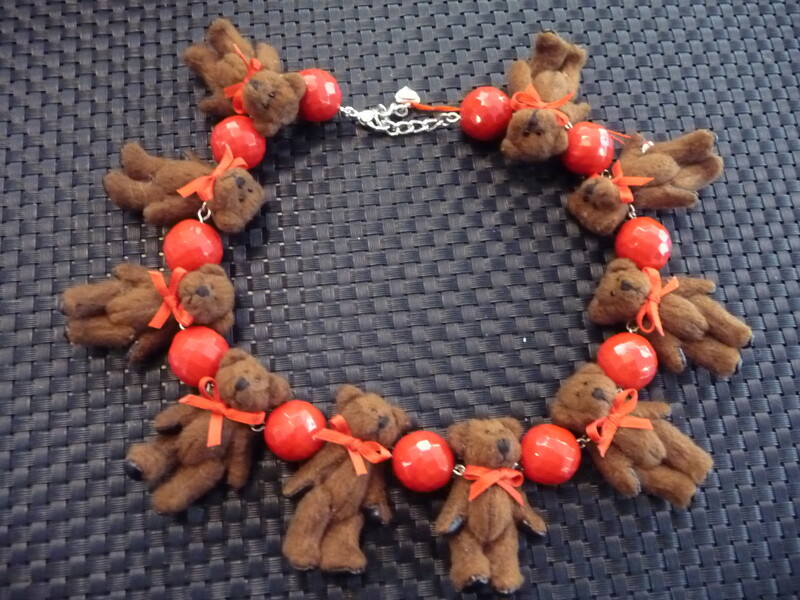 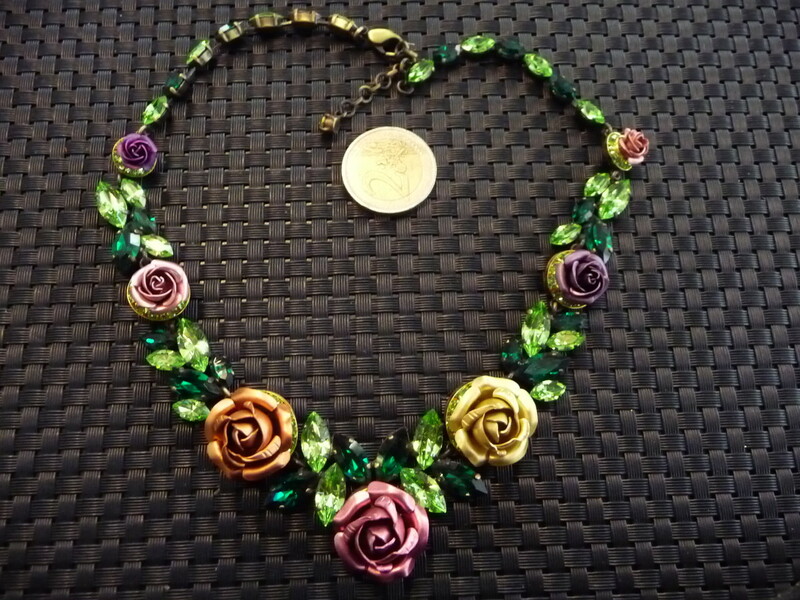 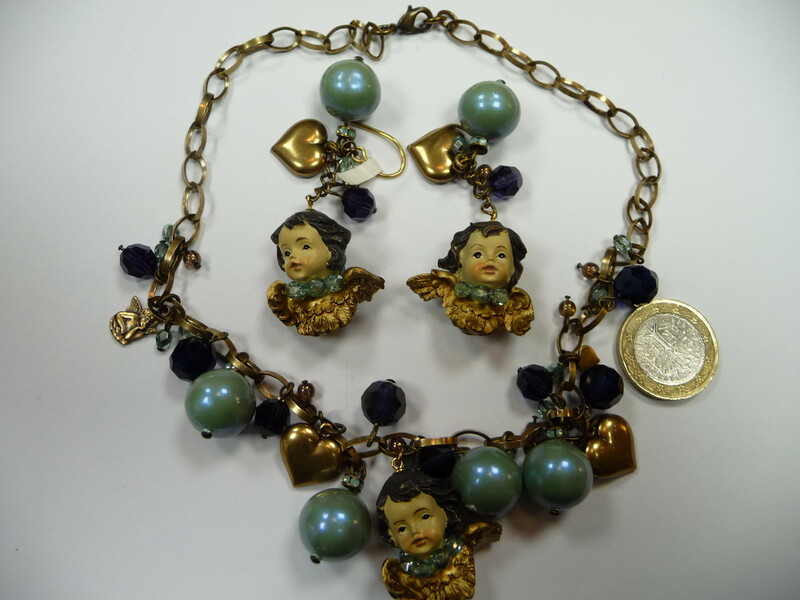 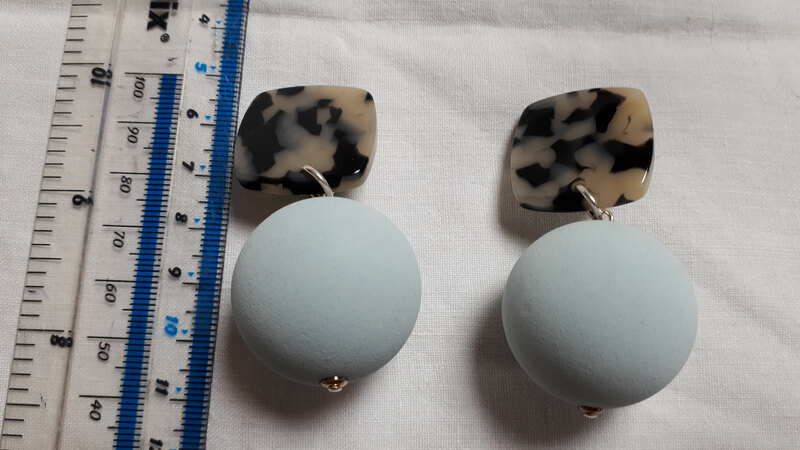 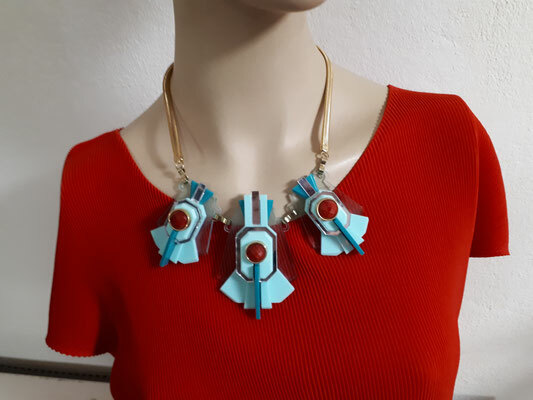 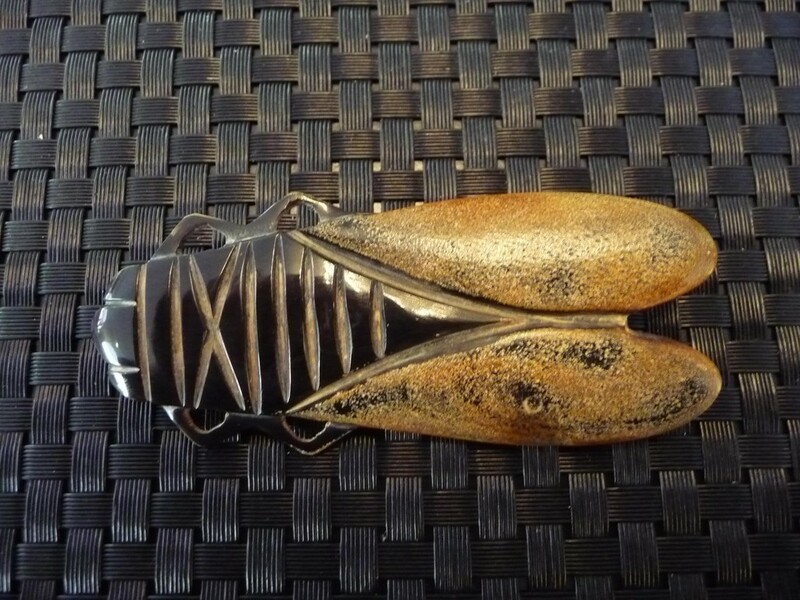 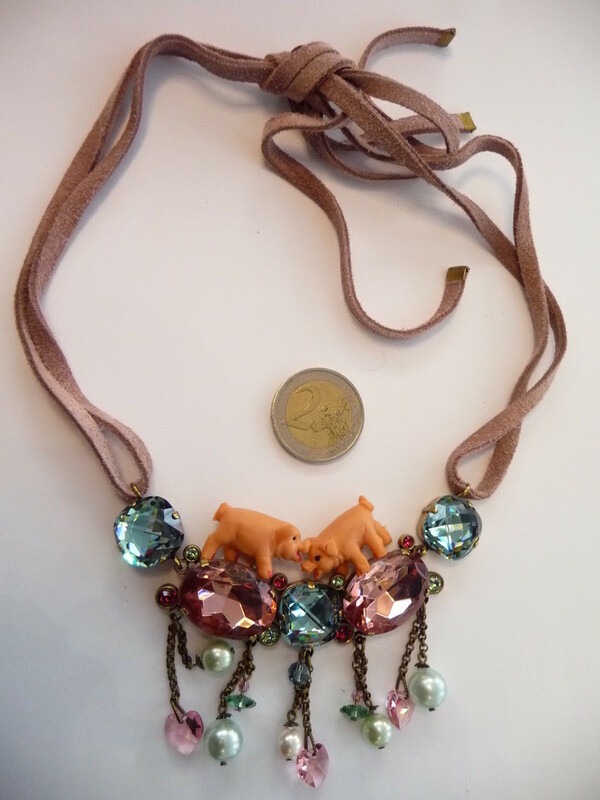 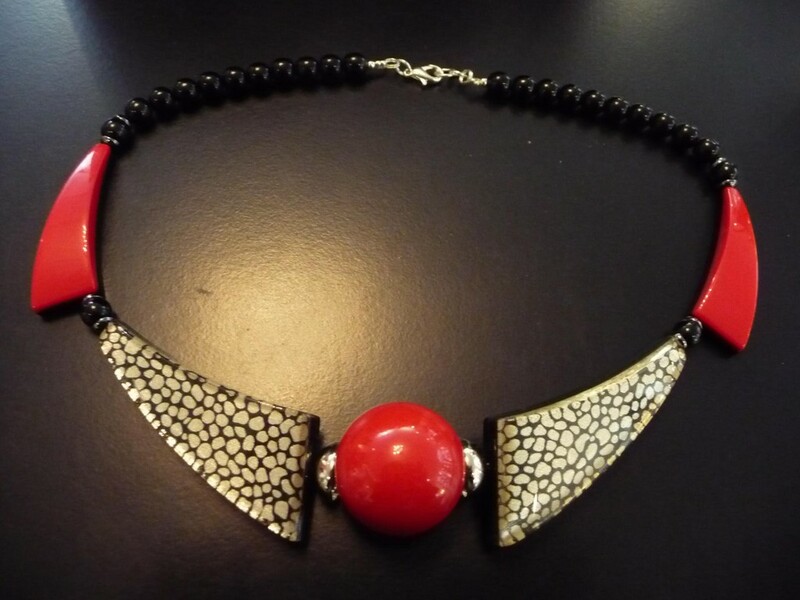 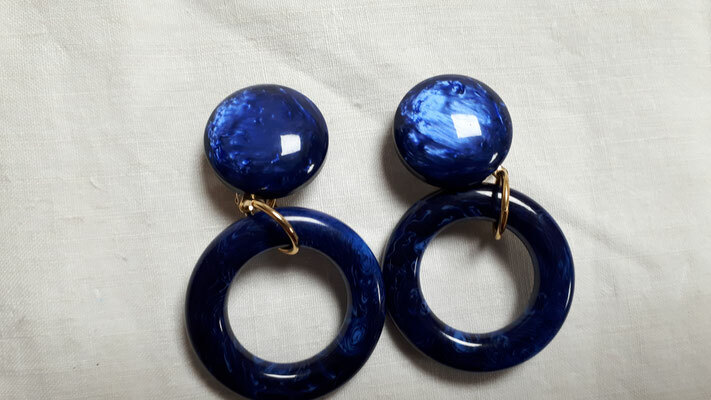 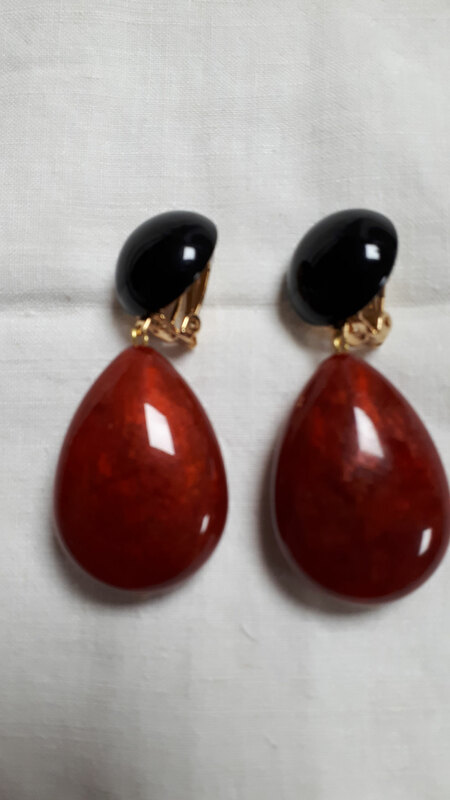 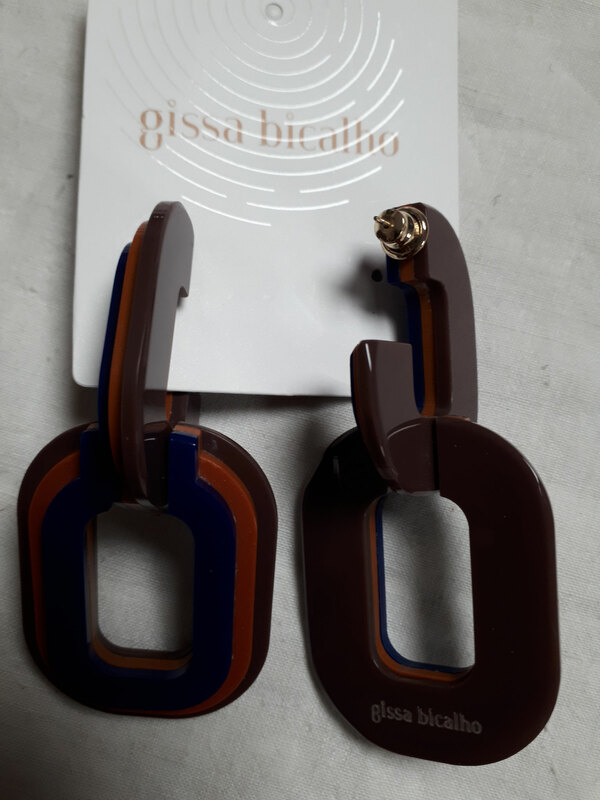 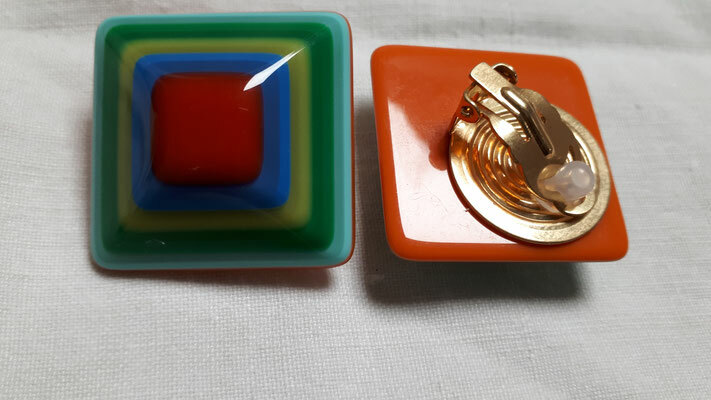 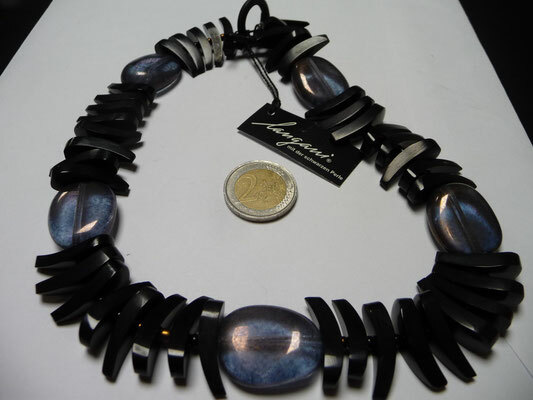 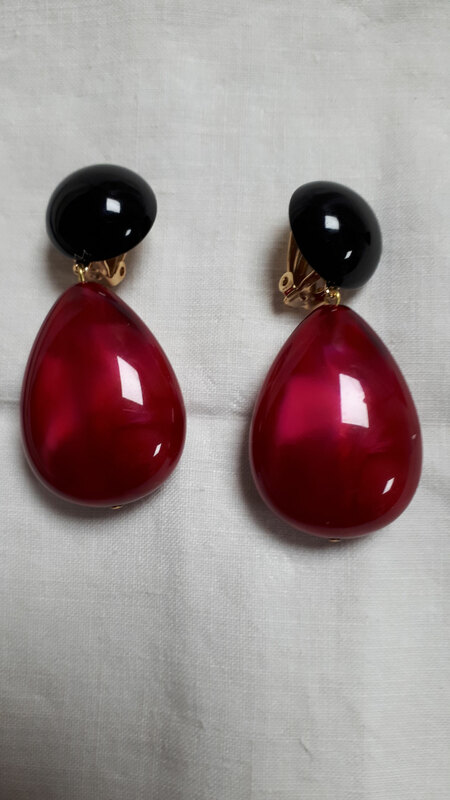 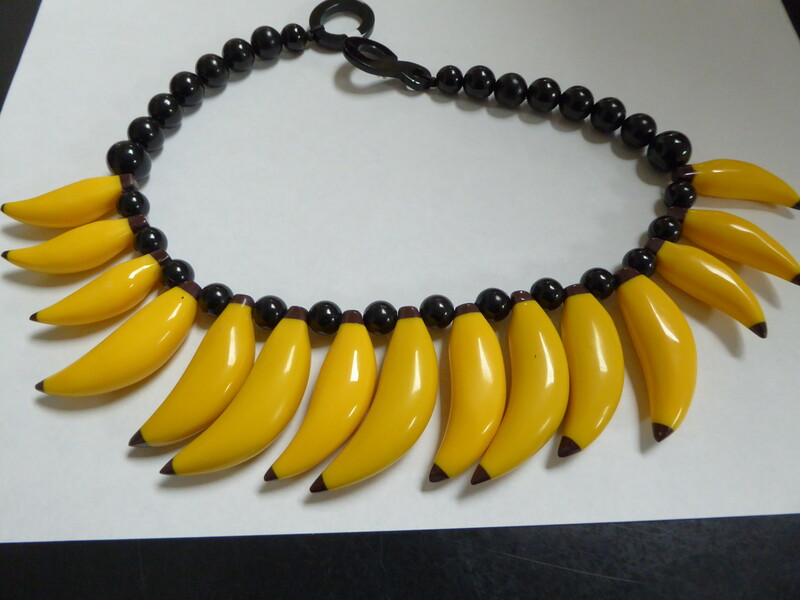 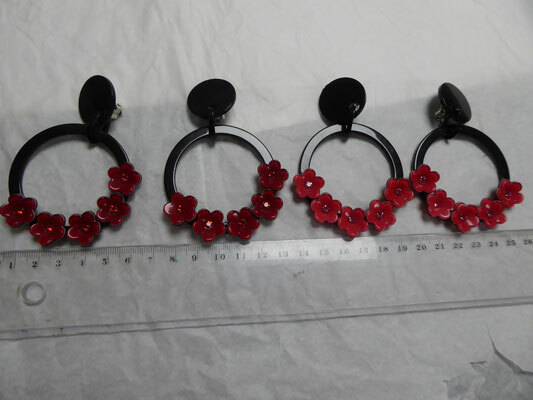 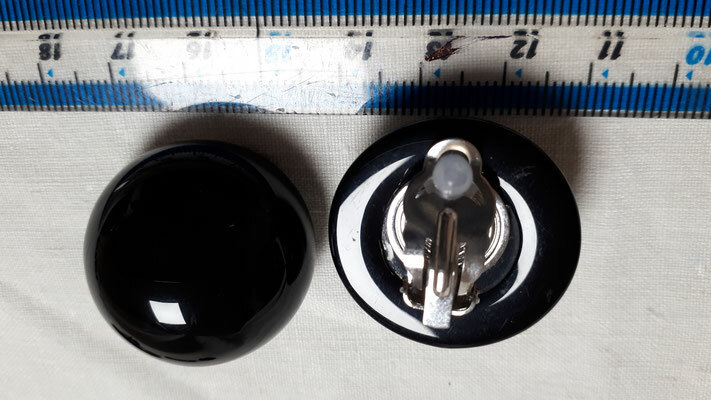 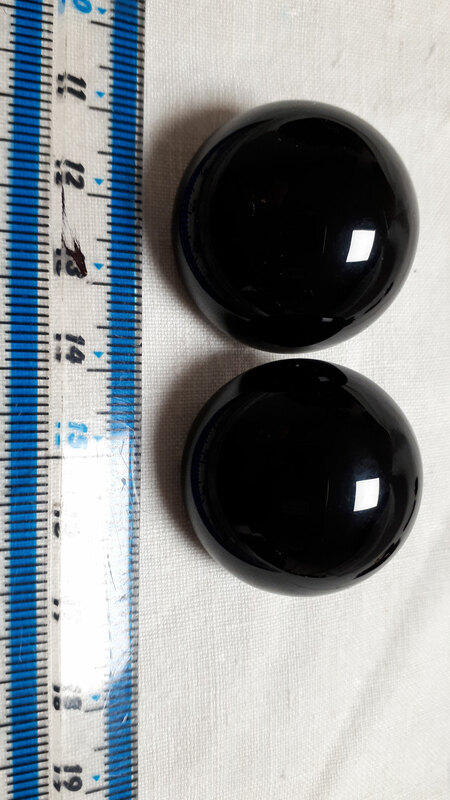 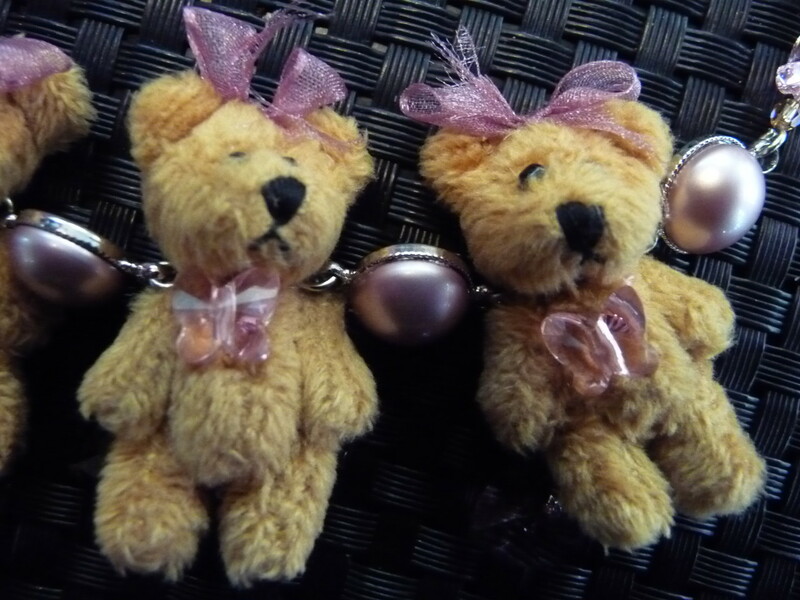 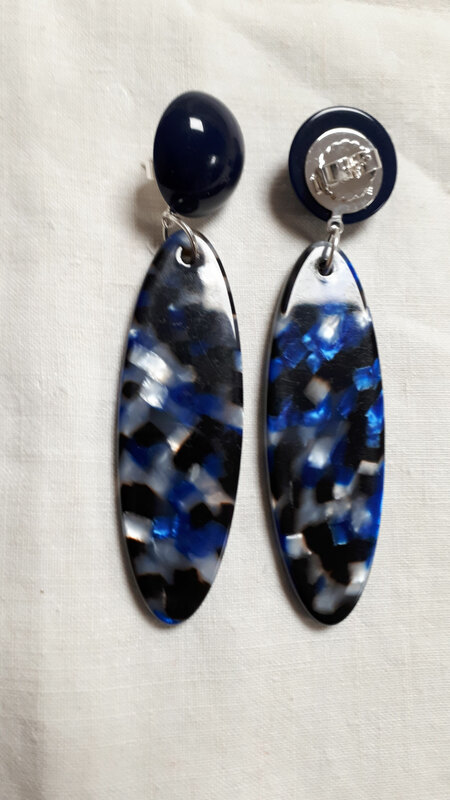 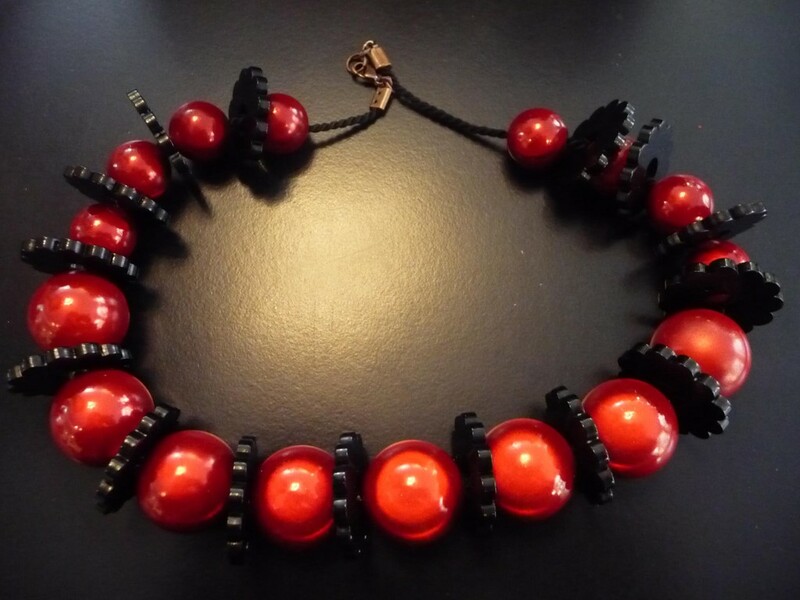 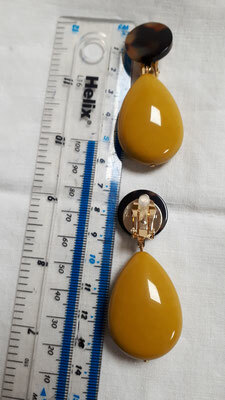 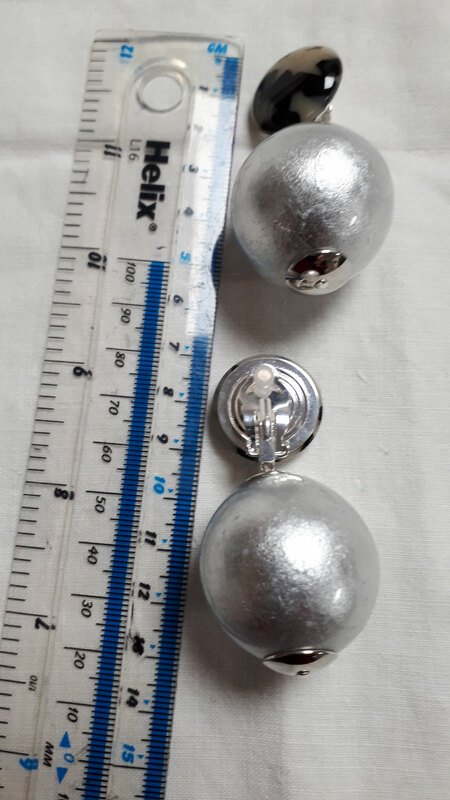 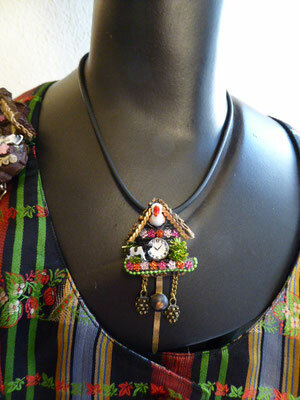 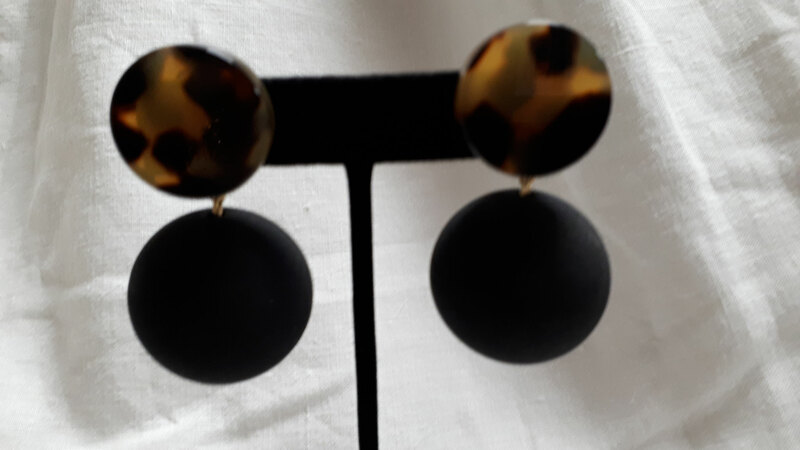 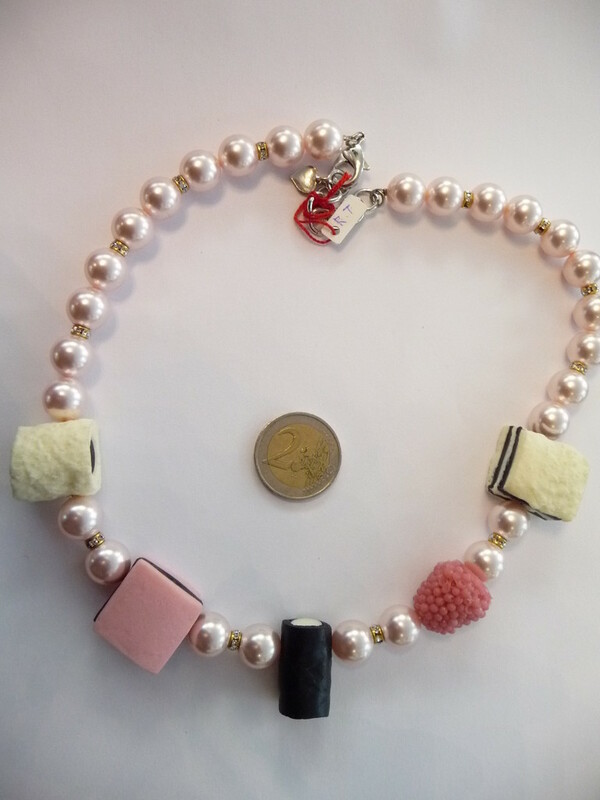 Hier sehen Sie eine kleine Auswahl aus unserem großen Angebot an Contemporary Schmuck. 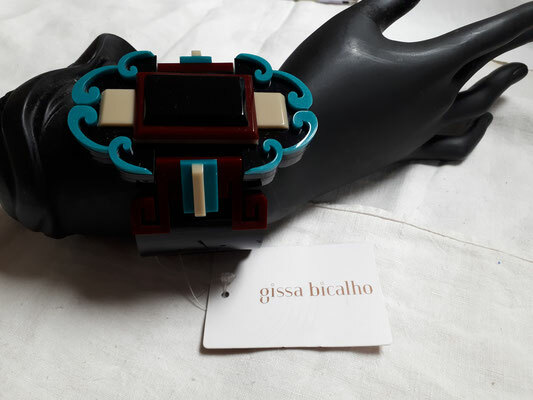 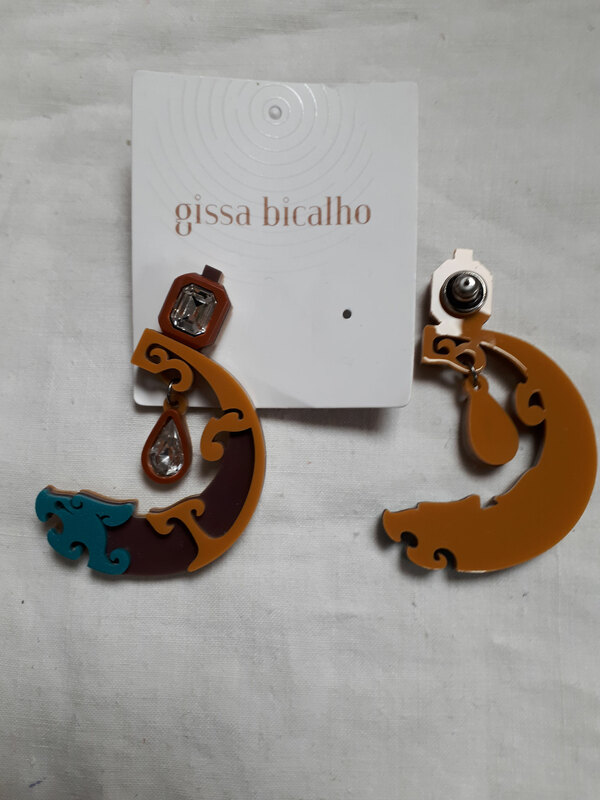 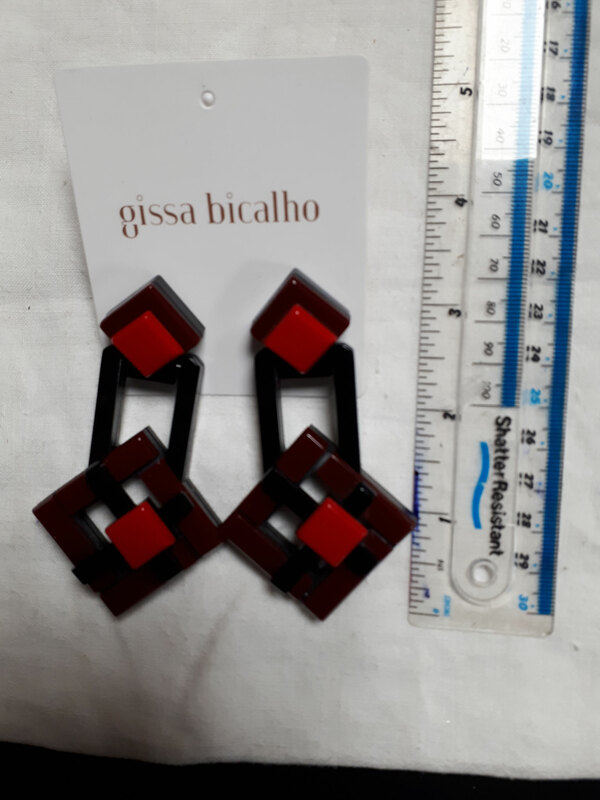 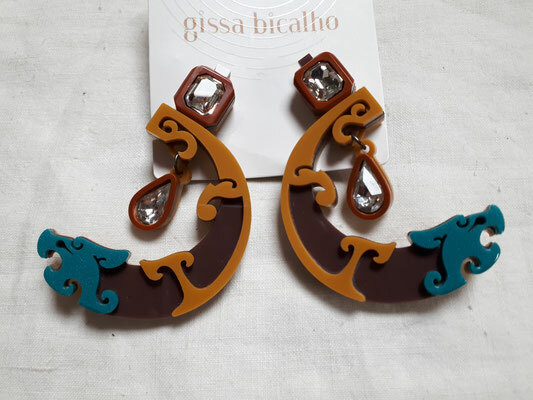 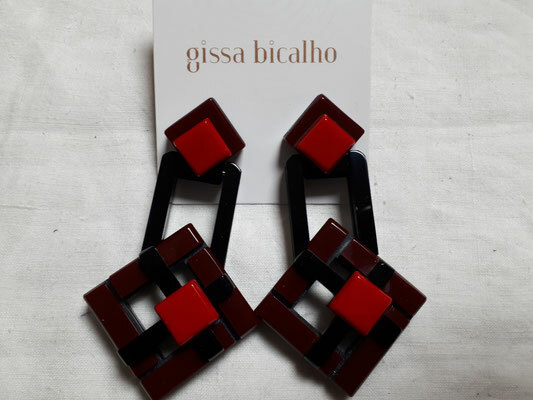 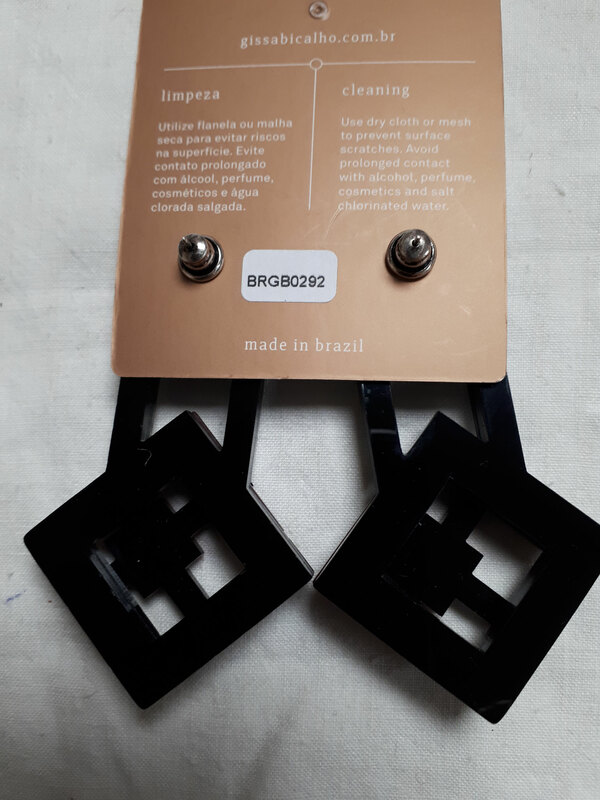 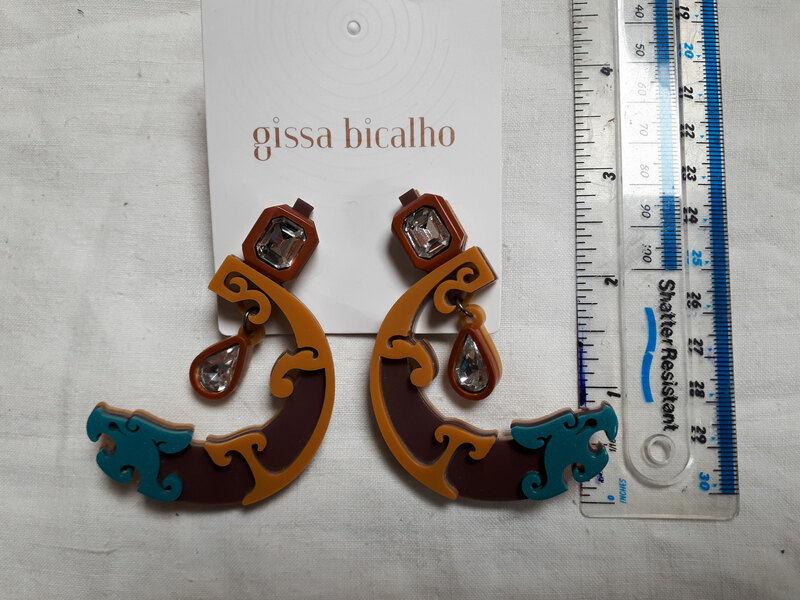 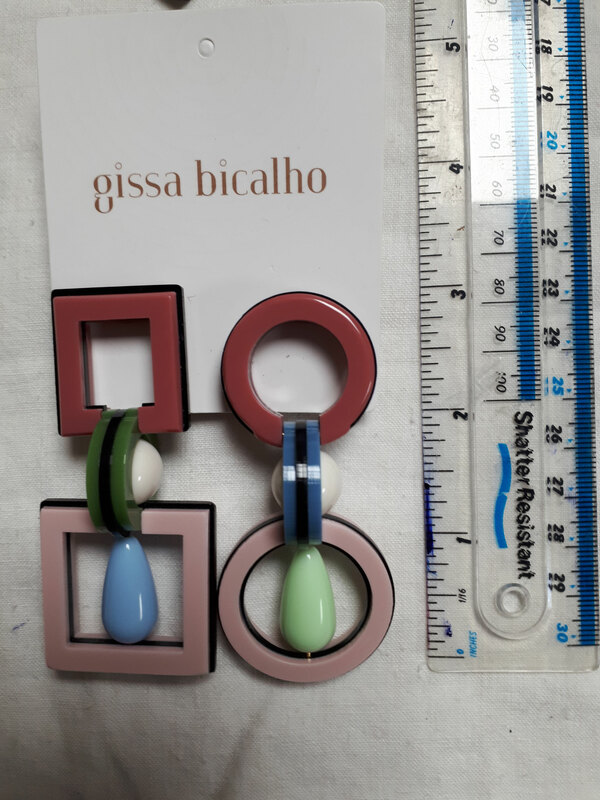 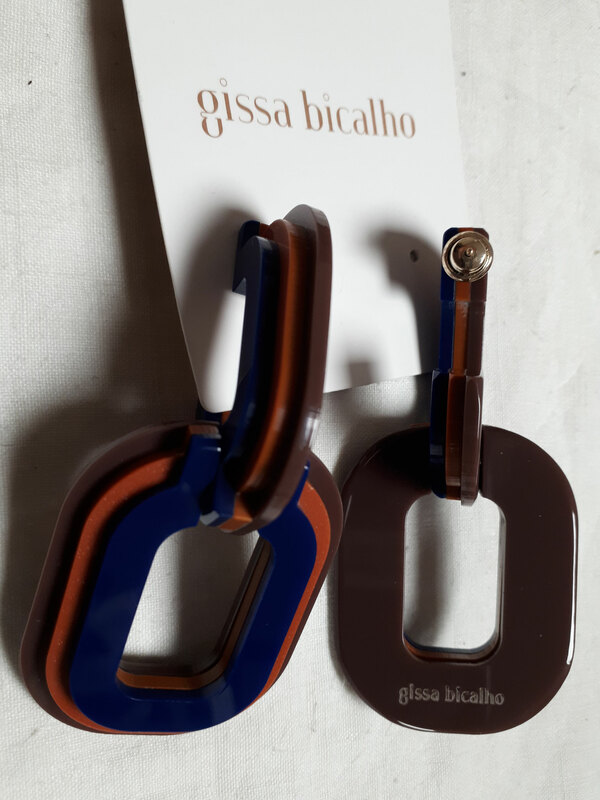 GISSA BICALHO, Brazil. 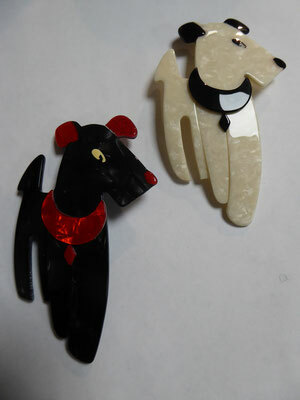 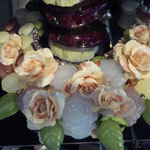 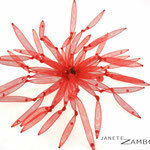 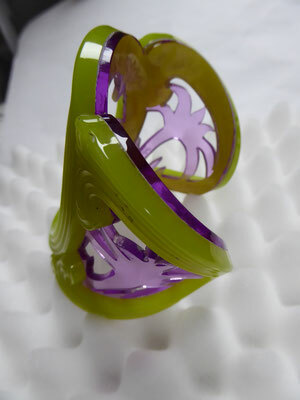 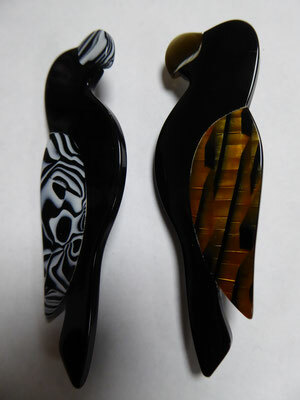 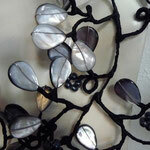 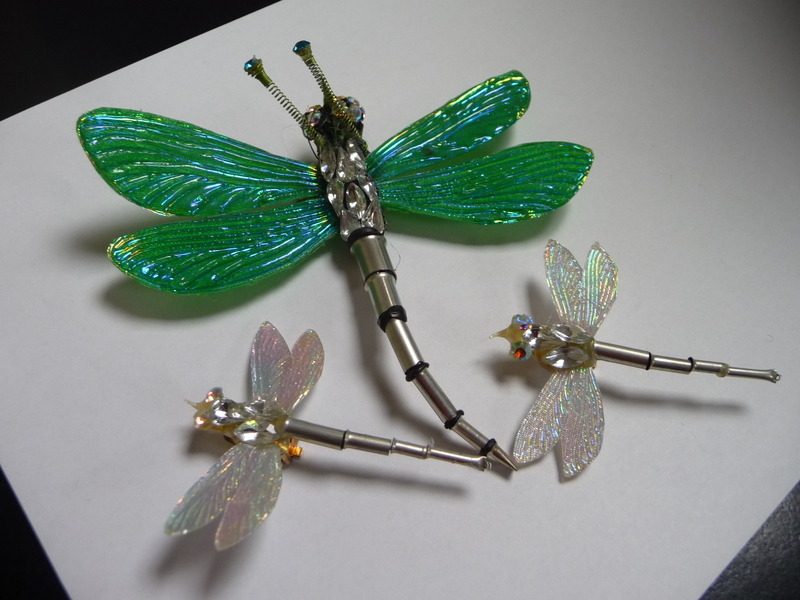 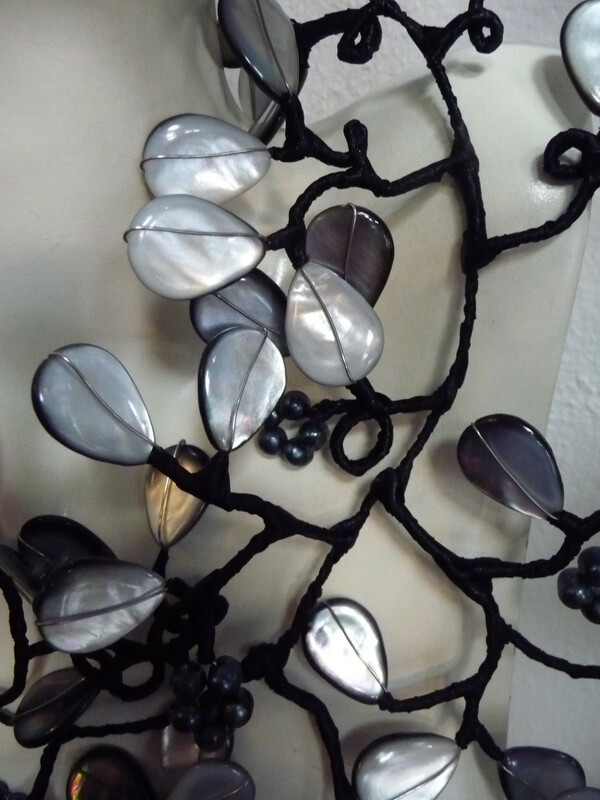 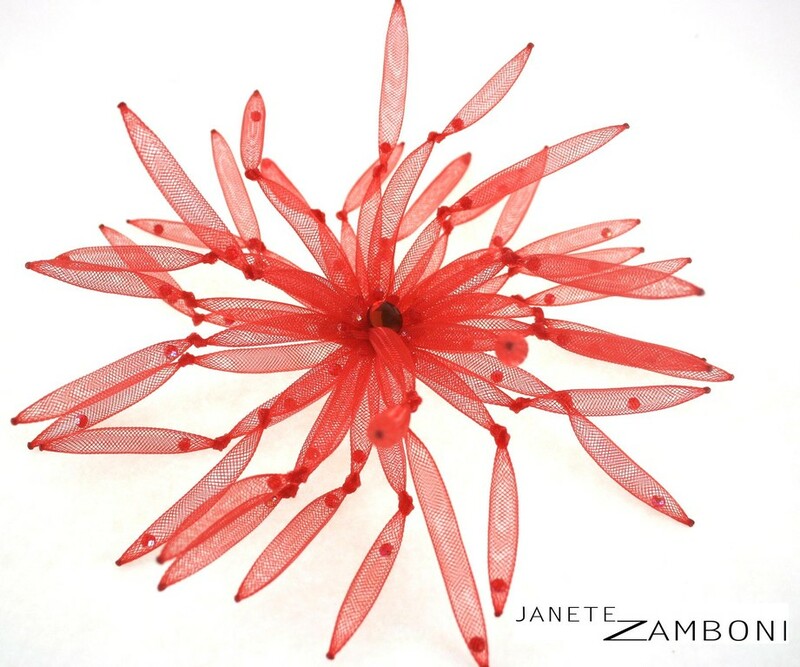 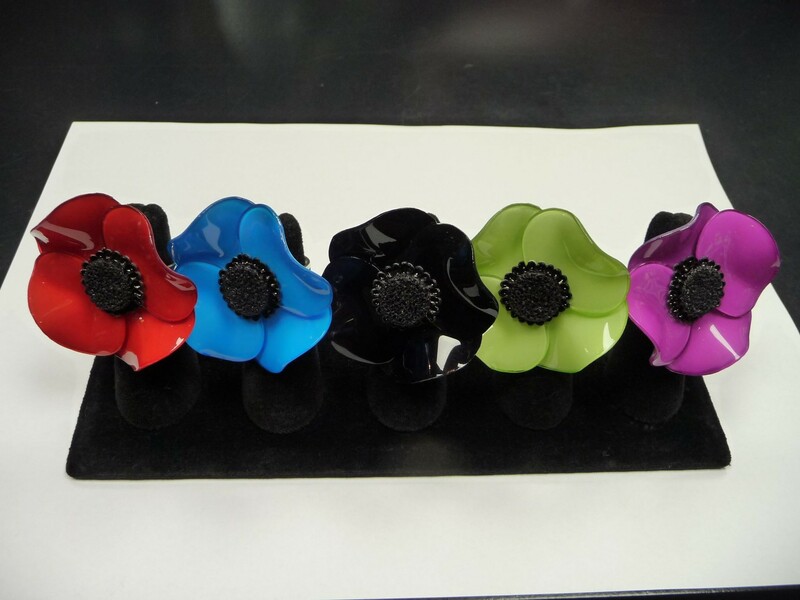 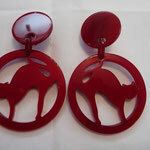 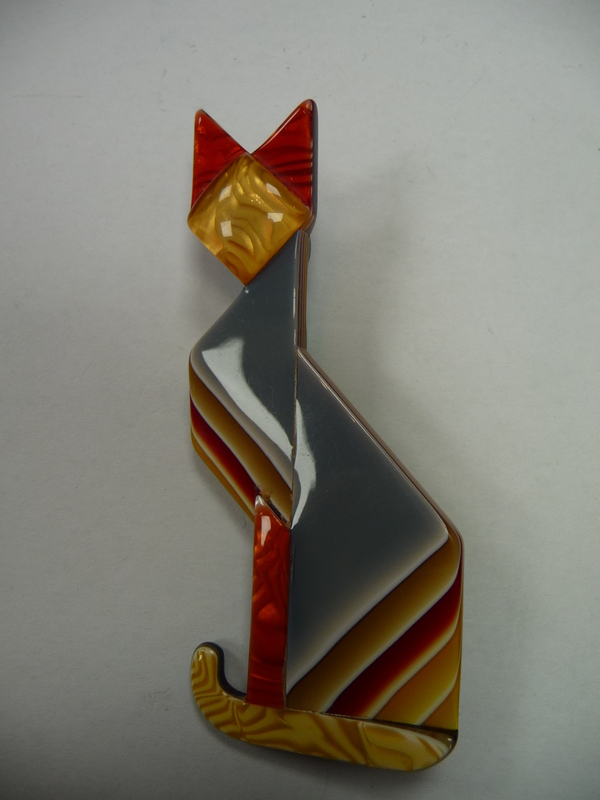 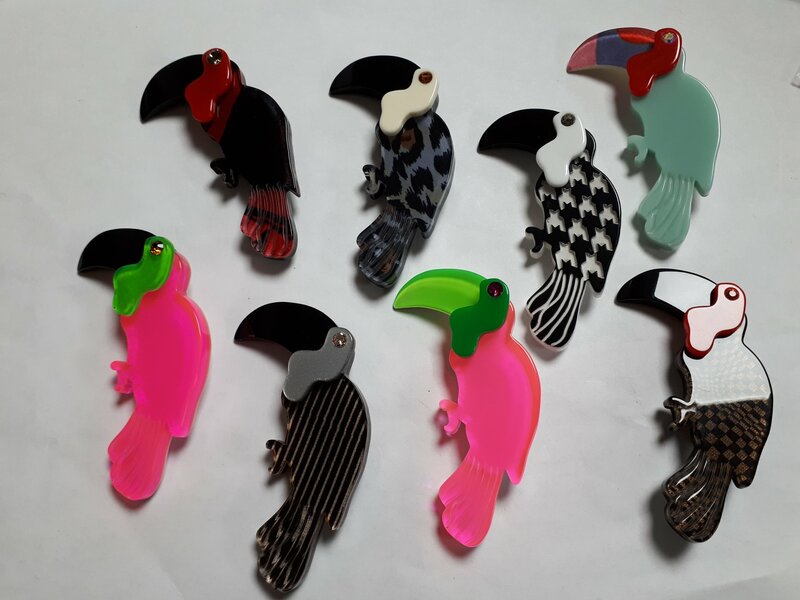 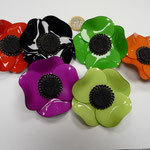 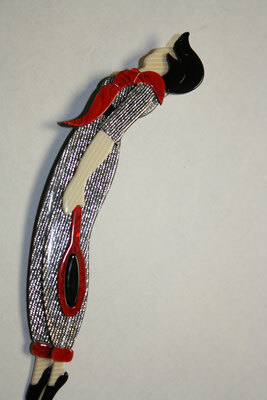 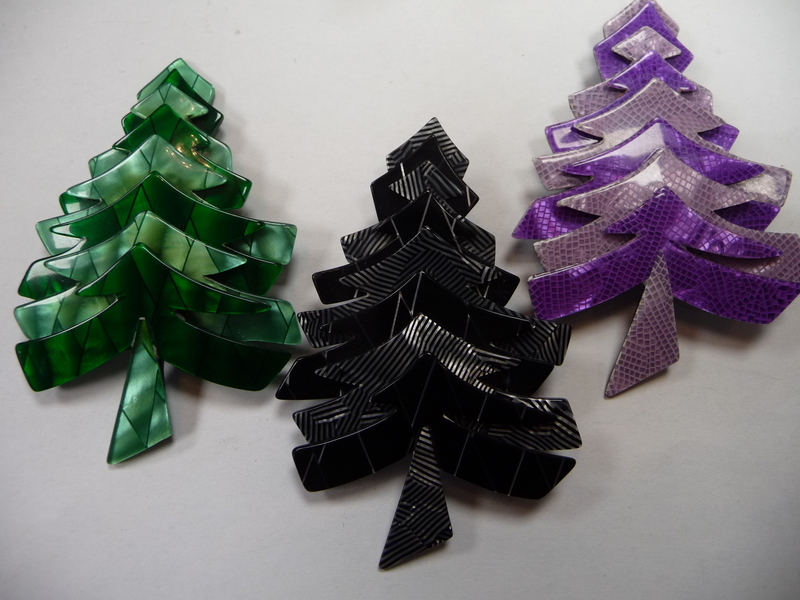 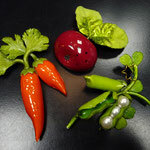 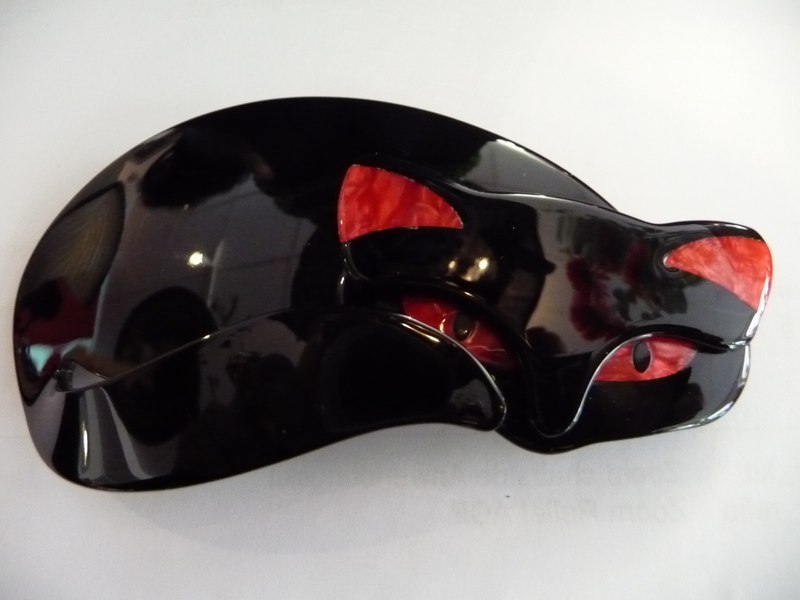 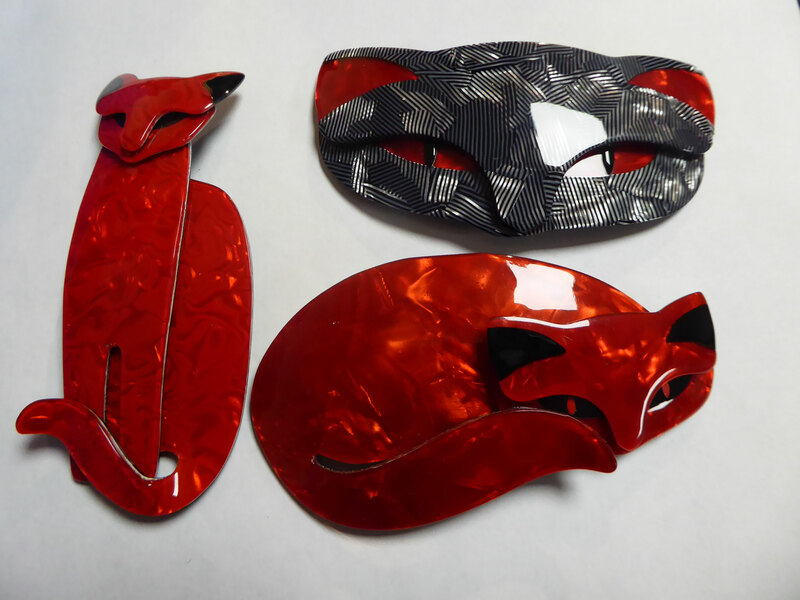 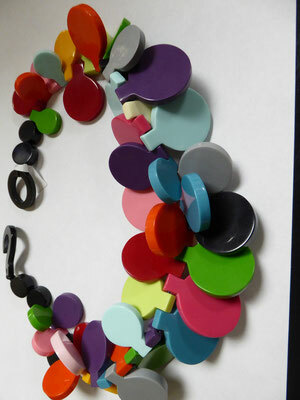 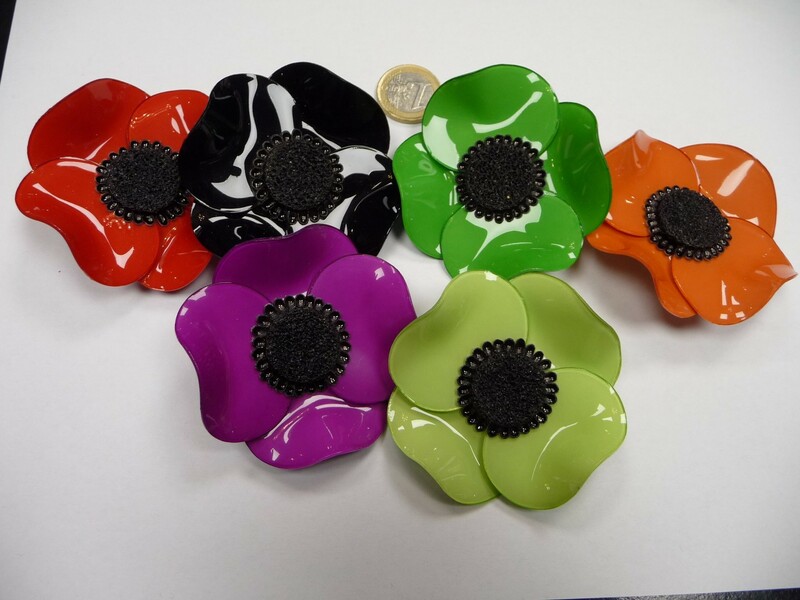 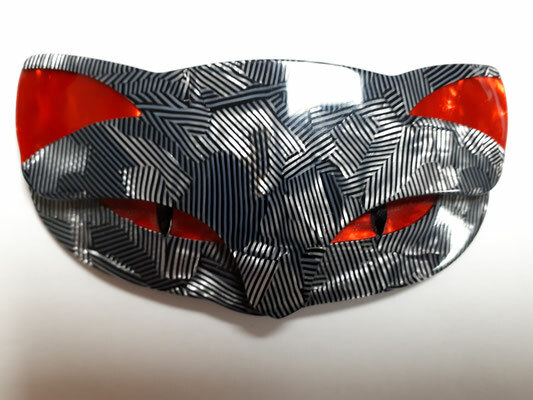 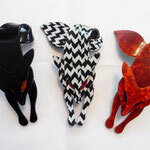 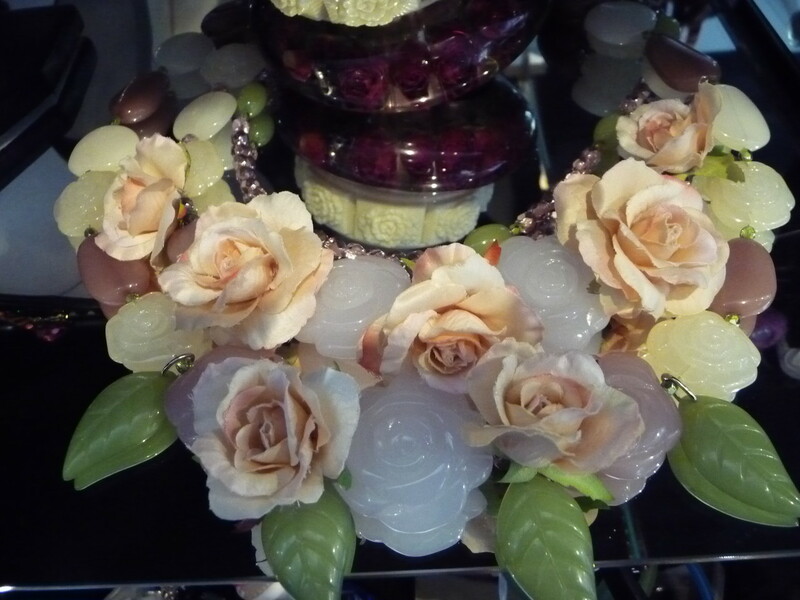 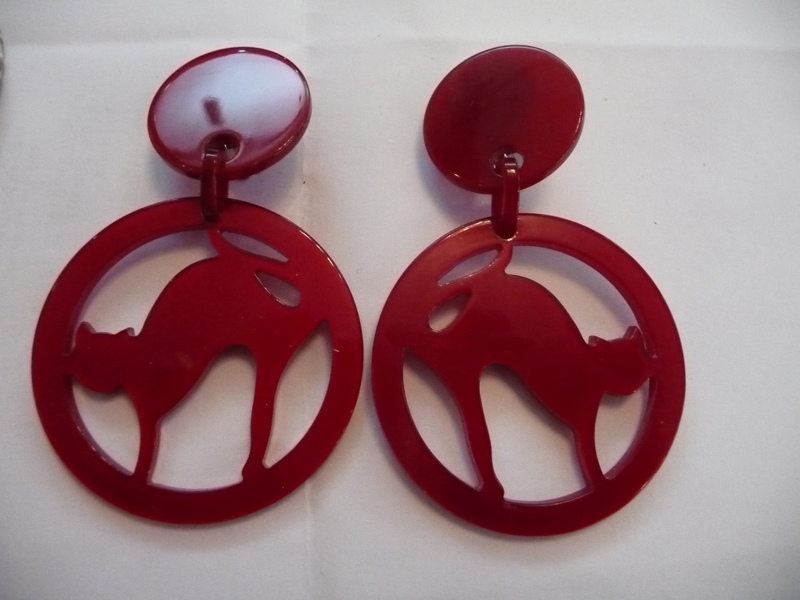 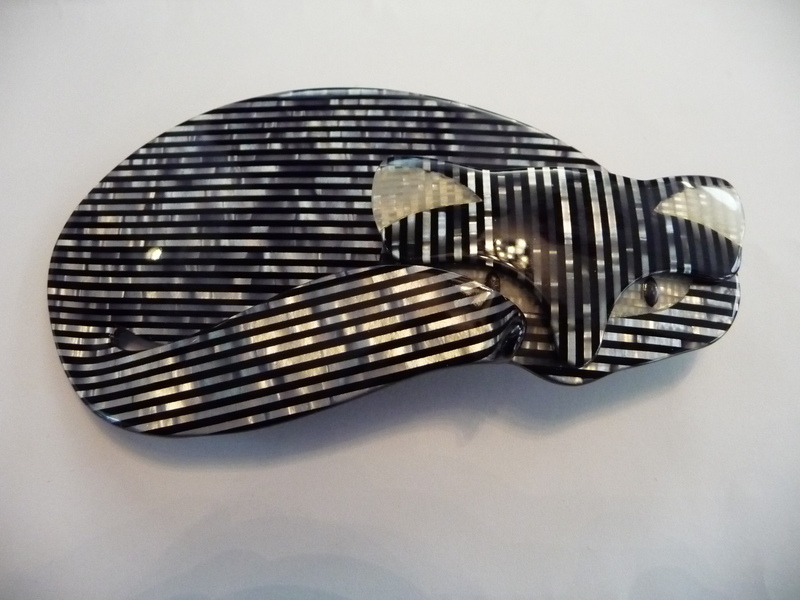 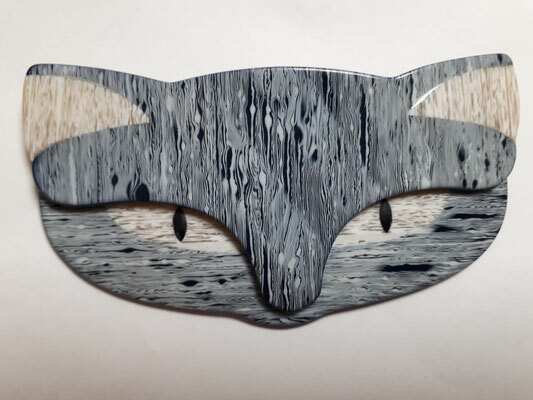 Contemporary designer - all hand carved acrylic.... beautifully polished and finished.... She is a real genius. 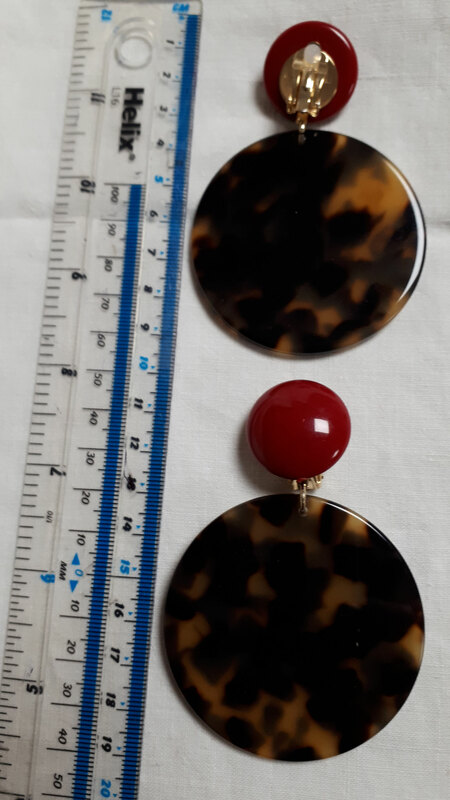 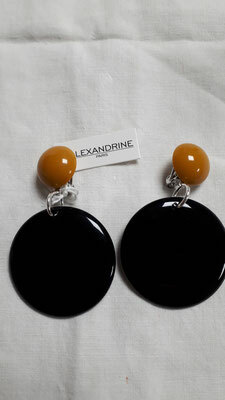 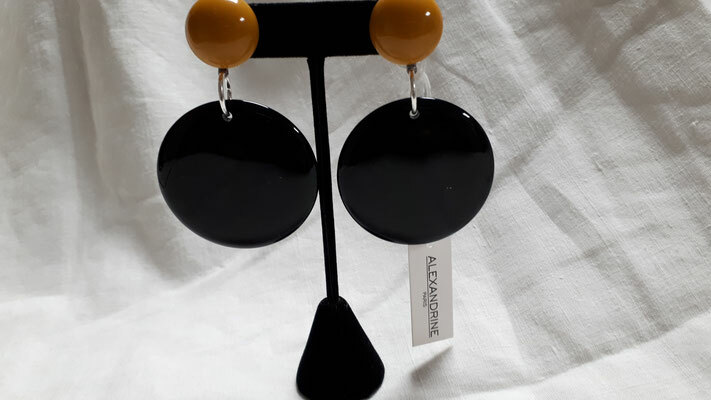 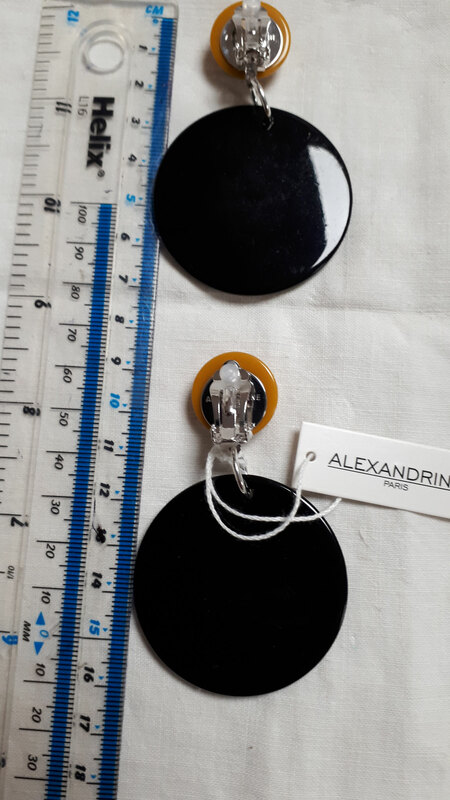 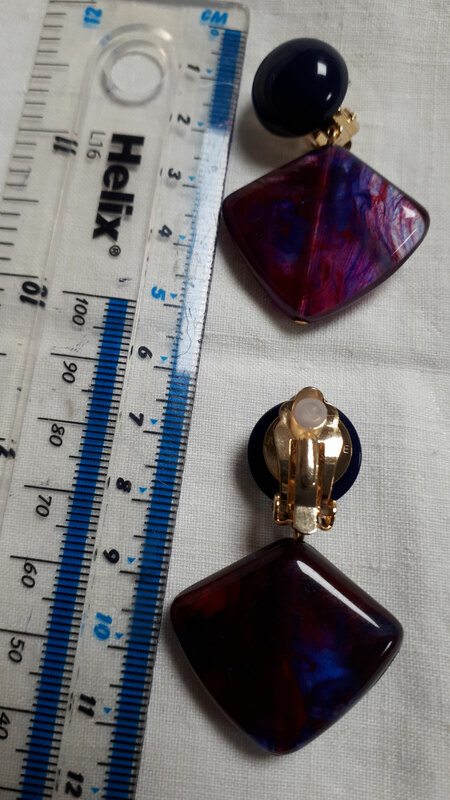 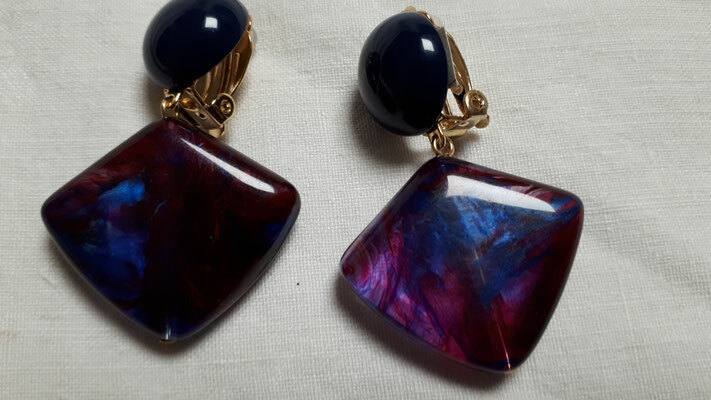 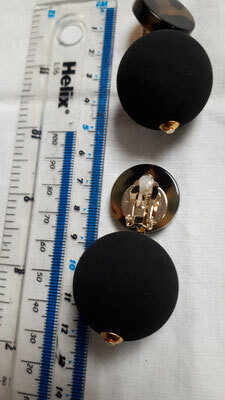 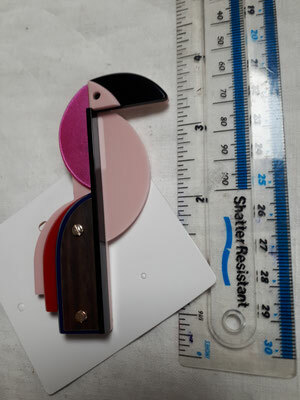 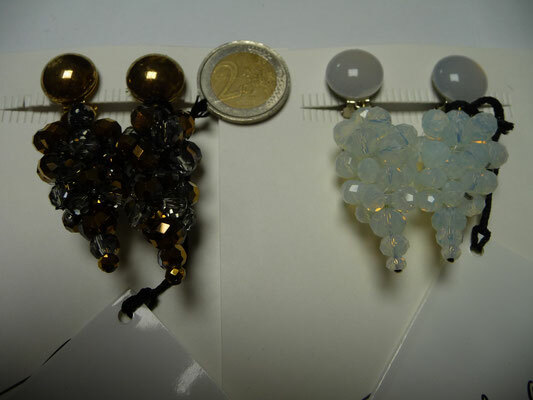 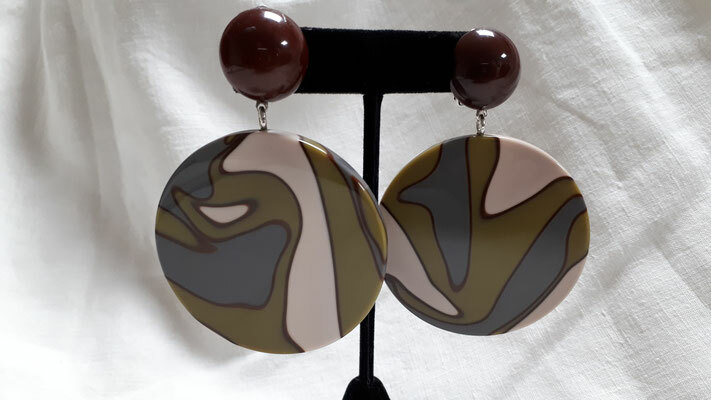 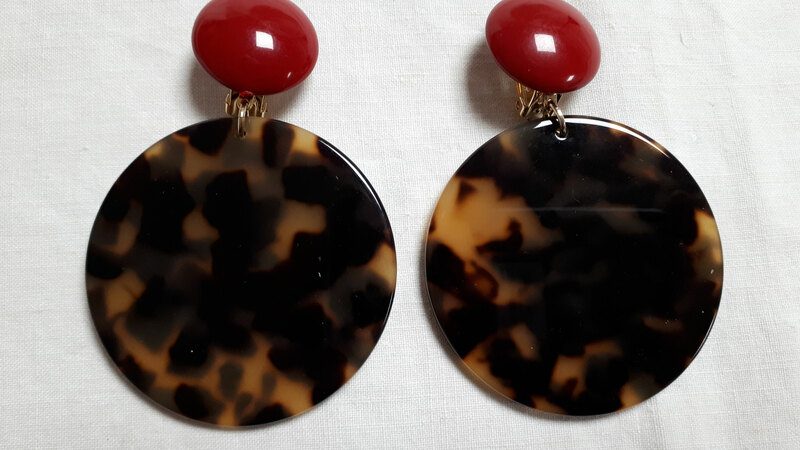 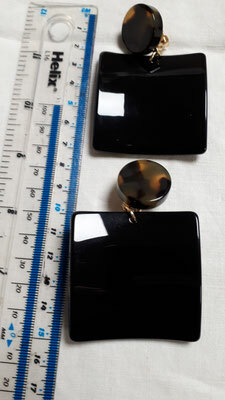 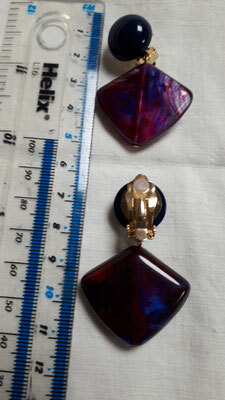 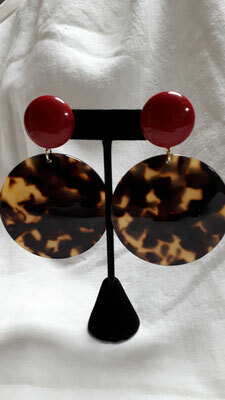 ALEXANDRINE, Paris - clip earrings in resin and cellulose acetate....latest collection. 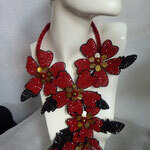 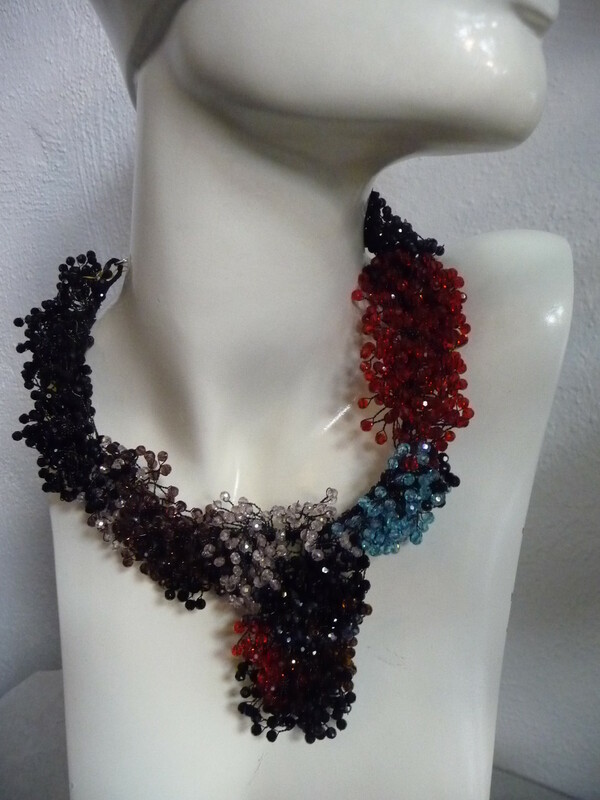 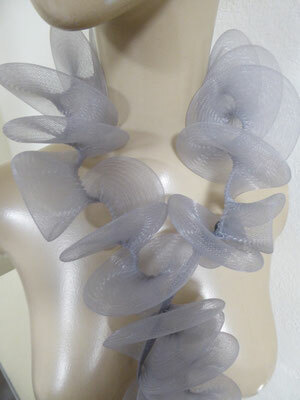 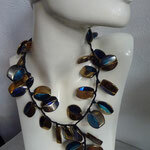 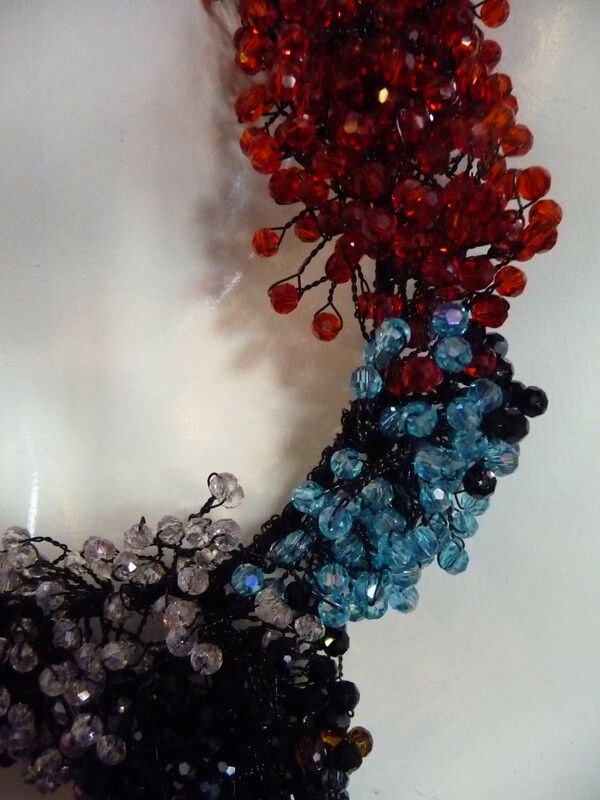 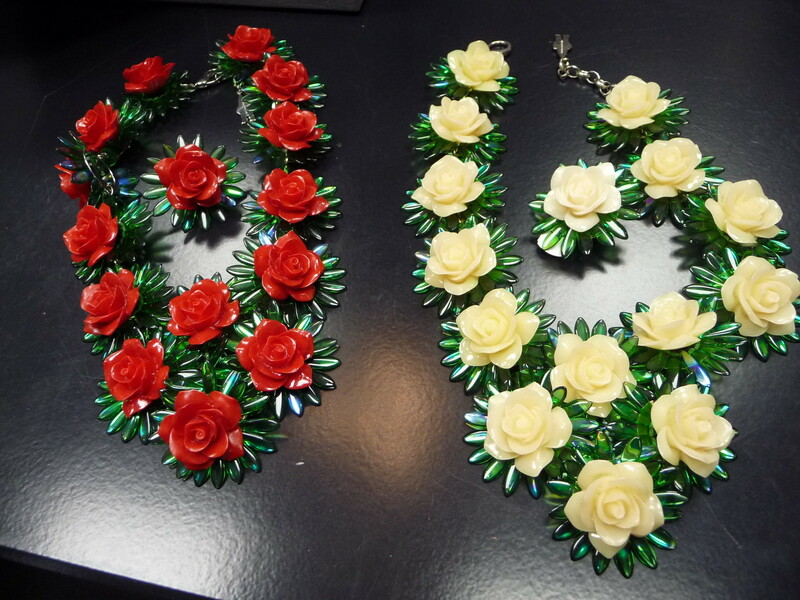 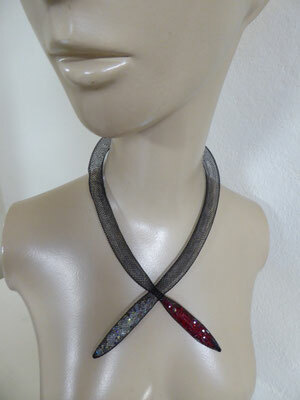 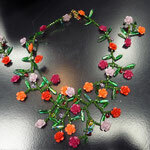 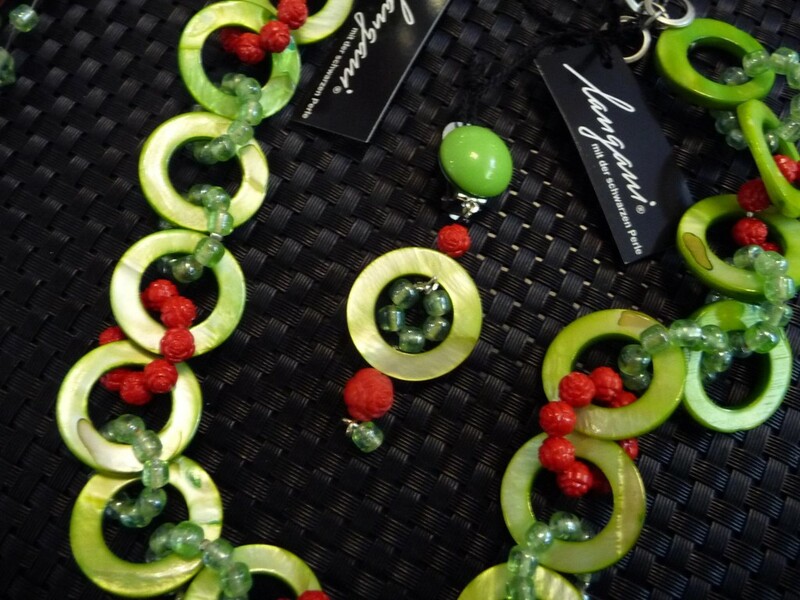 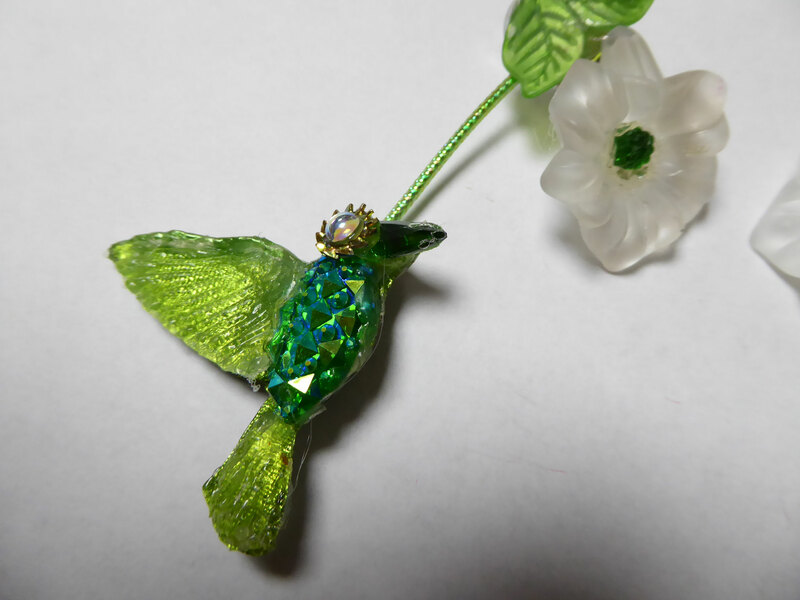 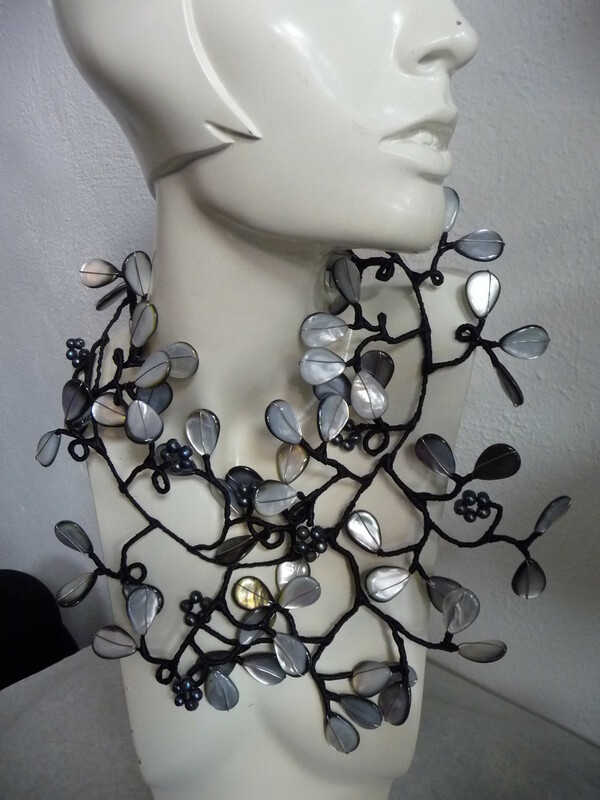 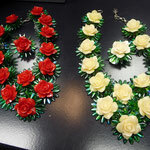 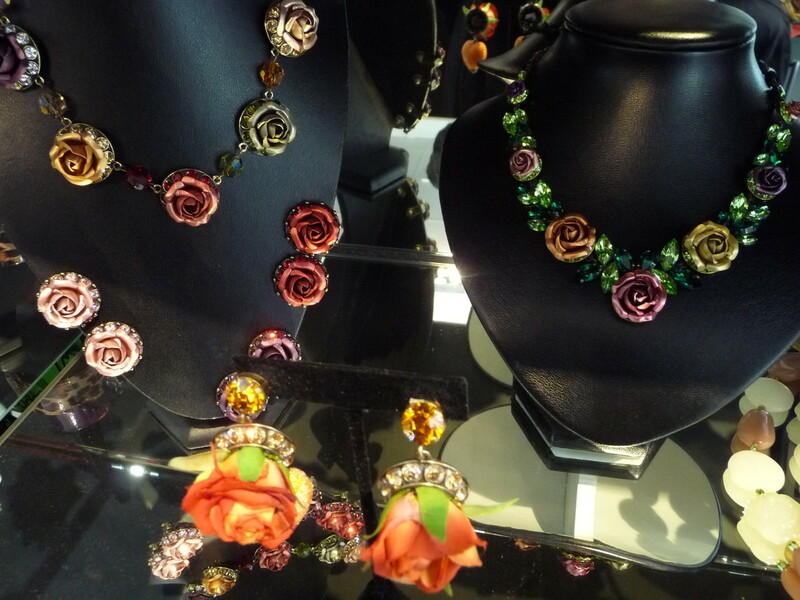 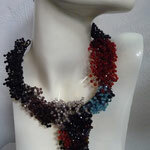 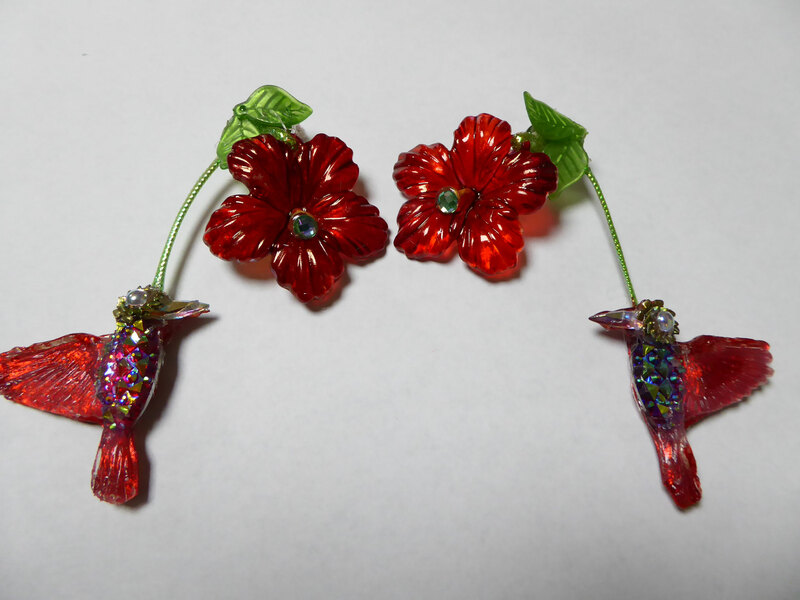 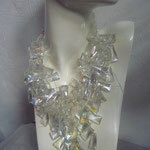 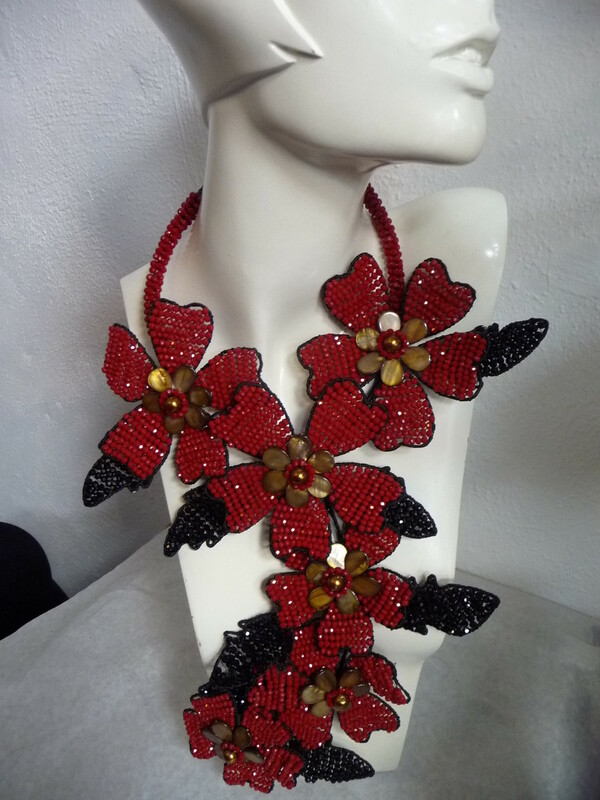 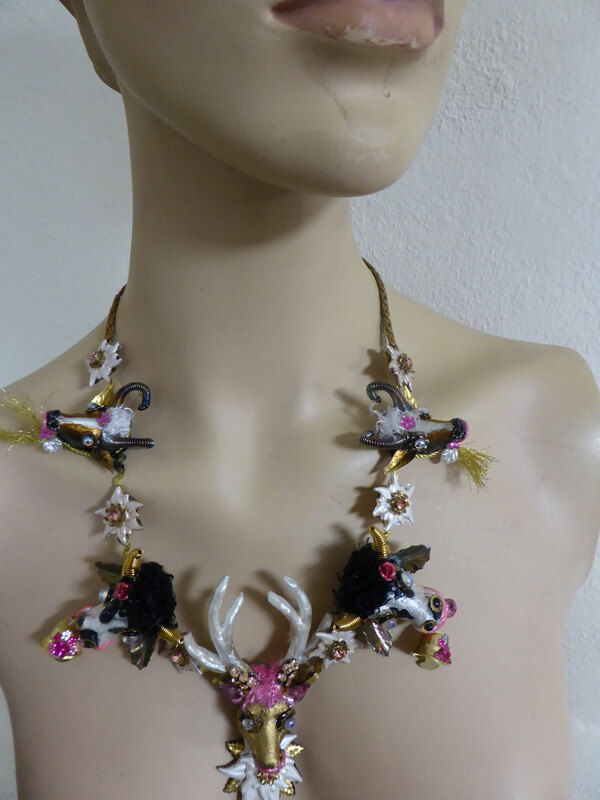 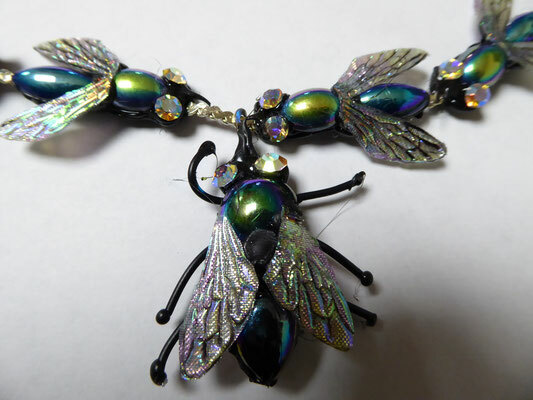 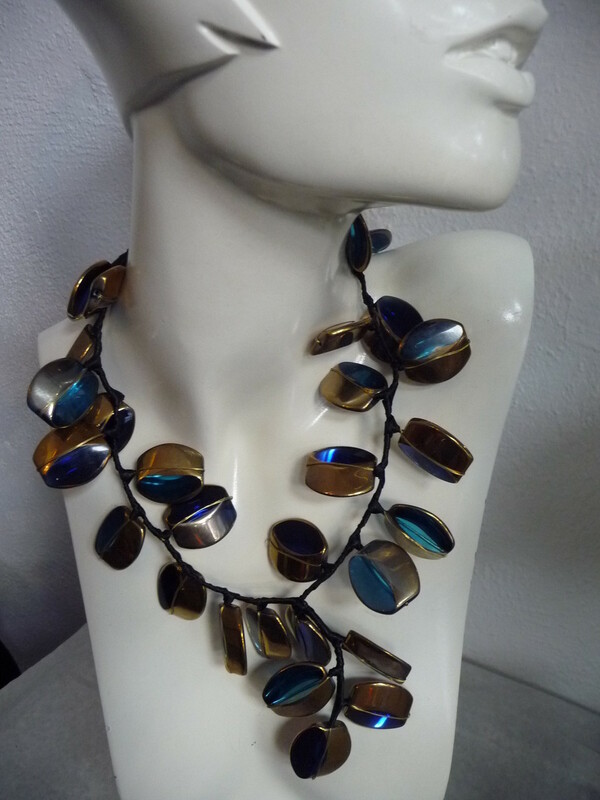 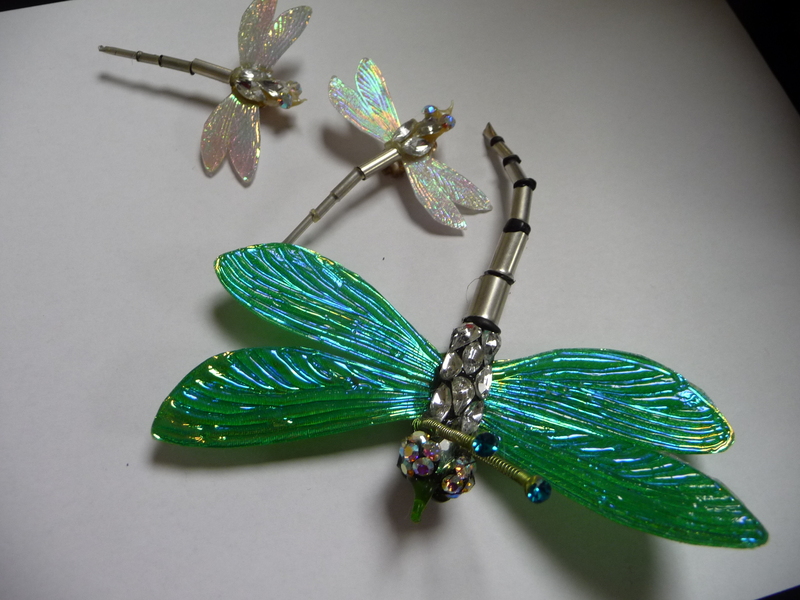 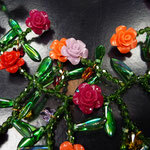 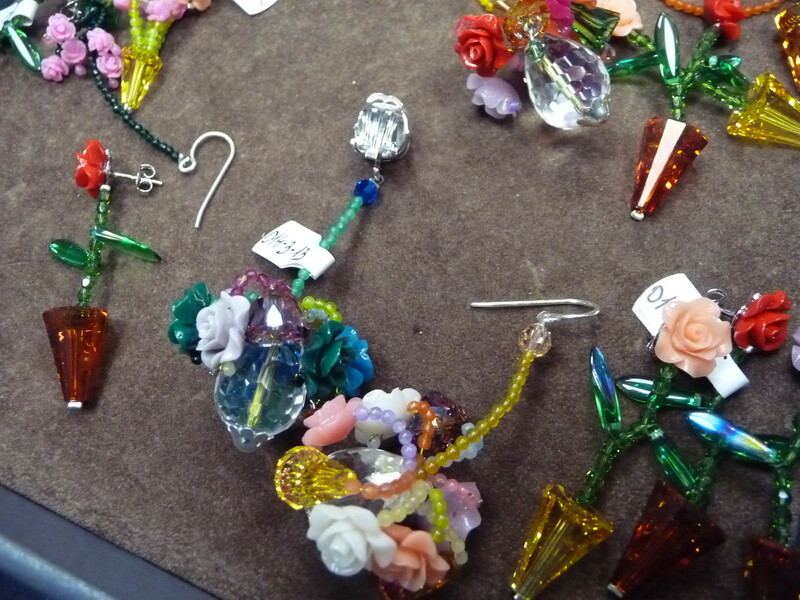 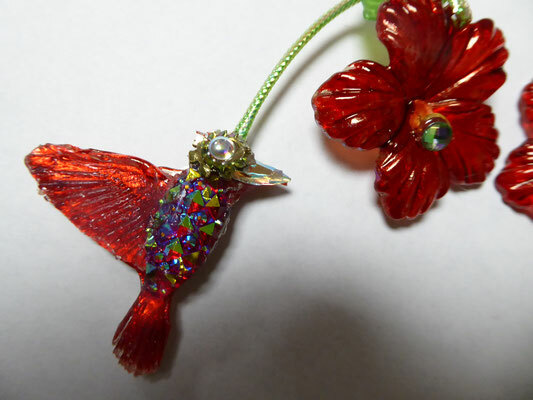 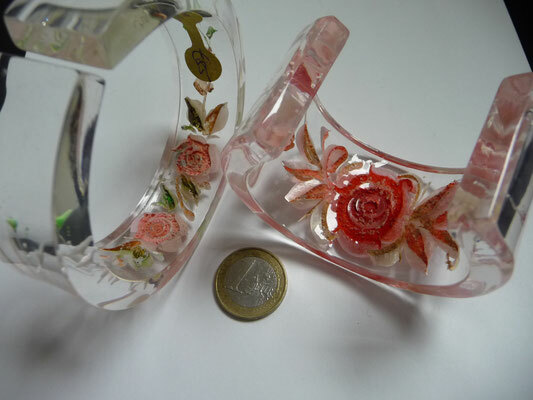 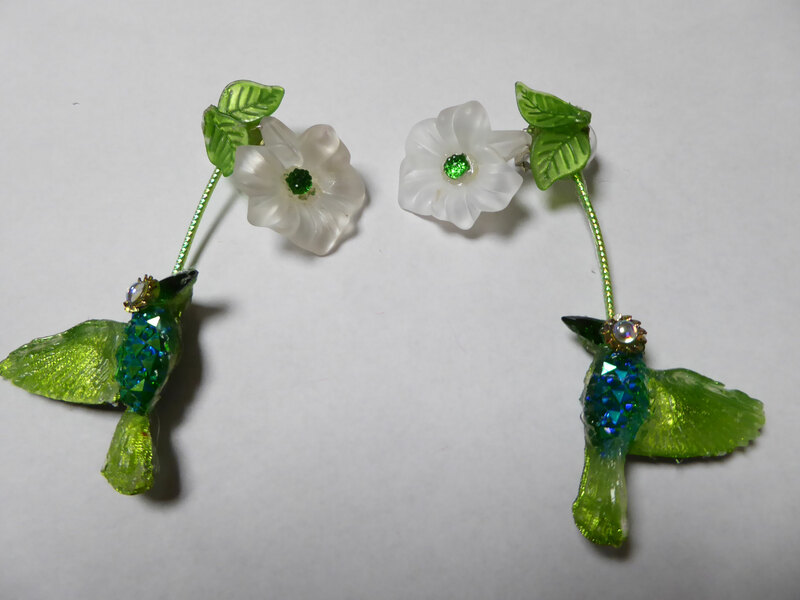 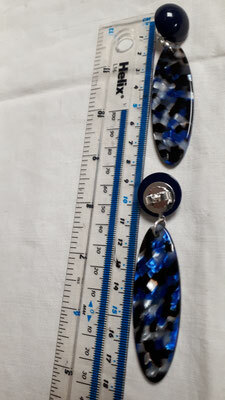 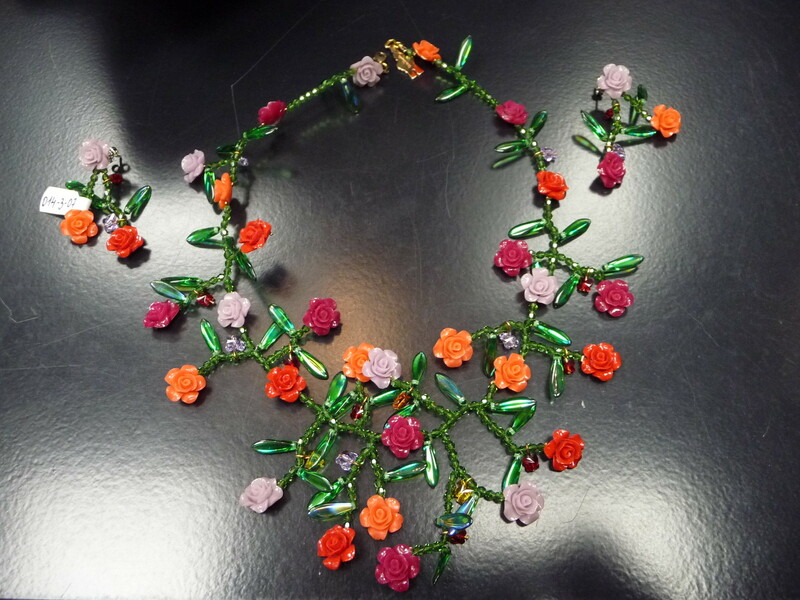 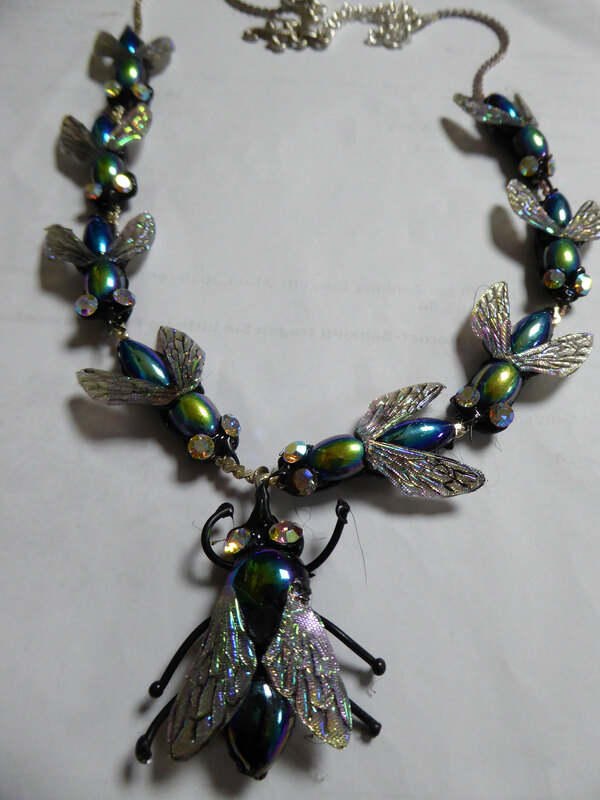 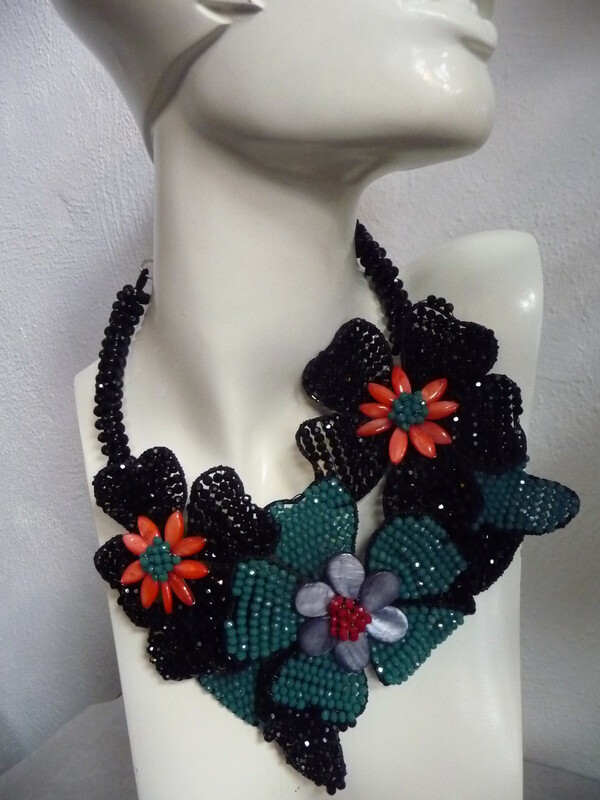 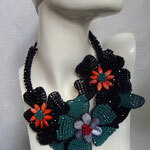 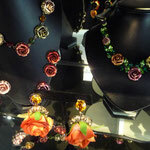 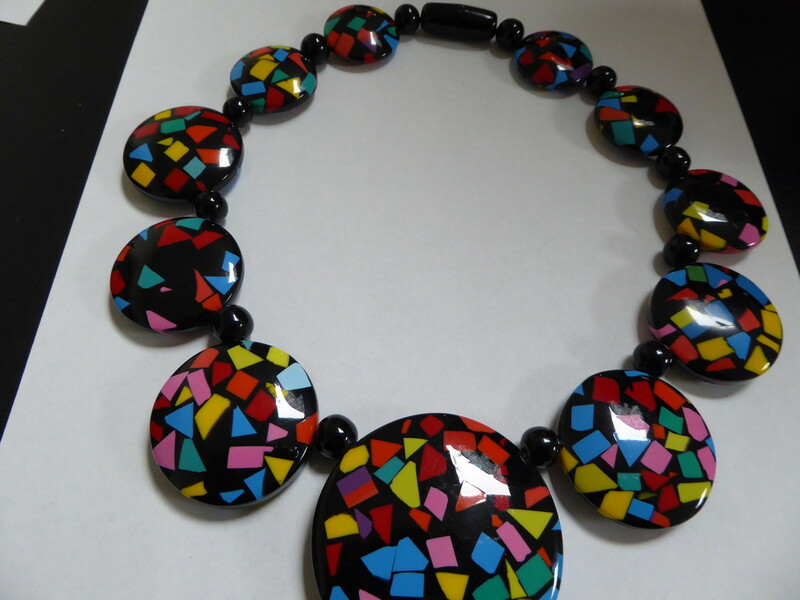 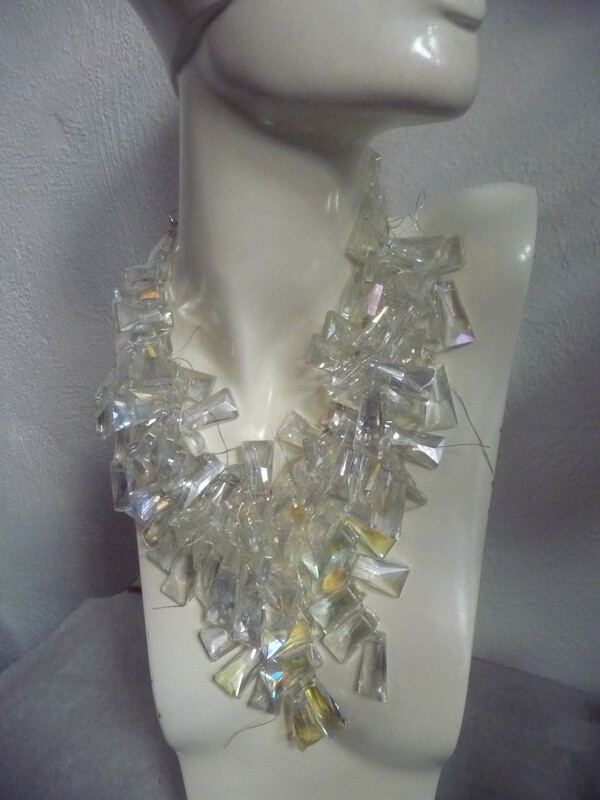 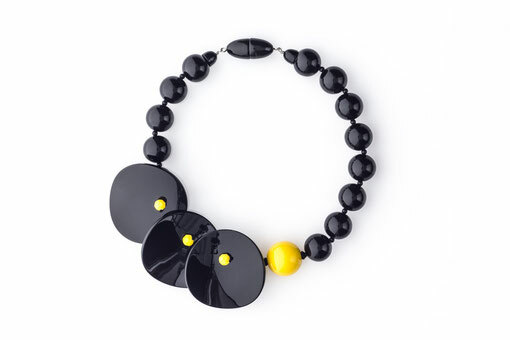 JEAN MARIE POINOT - master of acrylic jewelry. 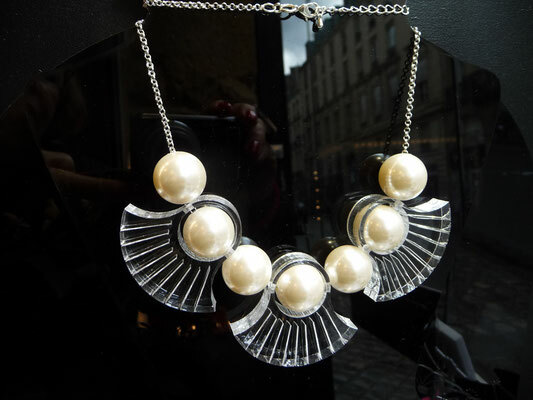 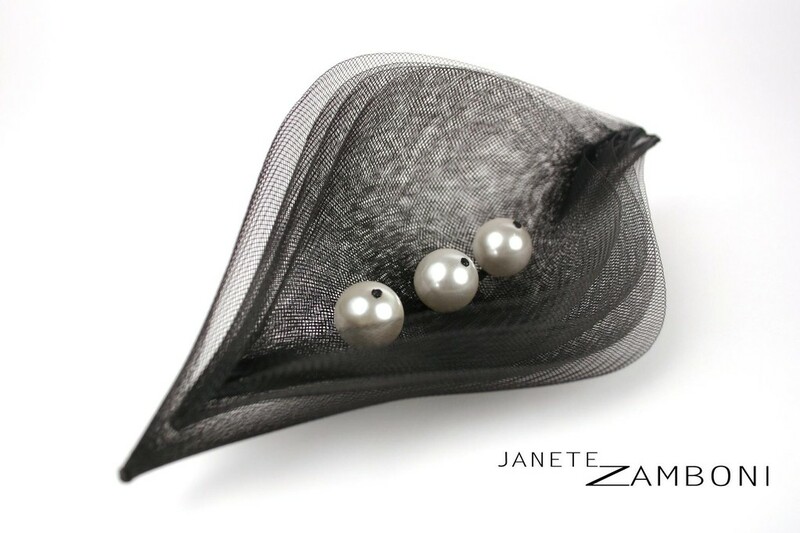 Jean Marie Poinot has been designing jewellery since 1975 and has worked for all the major European fashion houses including Chanel, Dior, Yves Saint Laurent, Christian Lacrois and Jean-Paul Gaultier. The quality of the workmanship he produces under the JMP signature is superb. 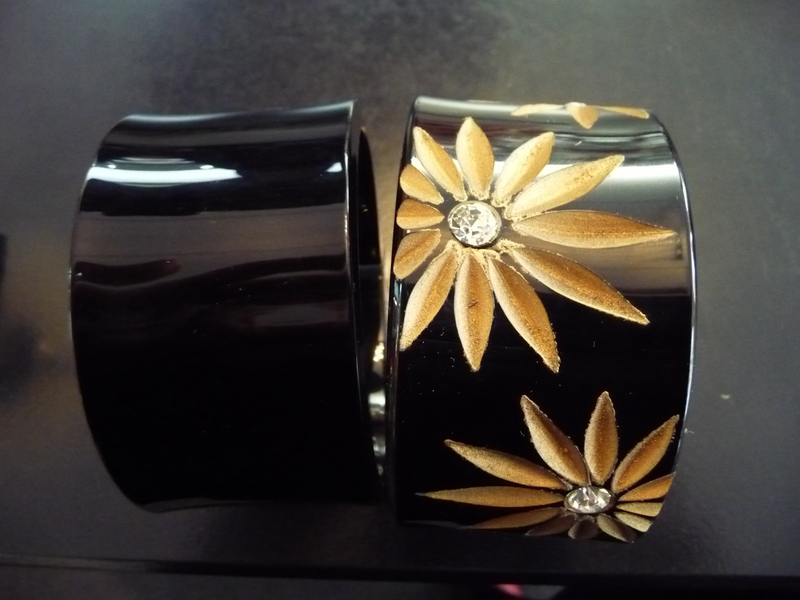 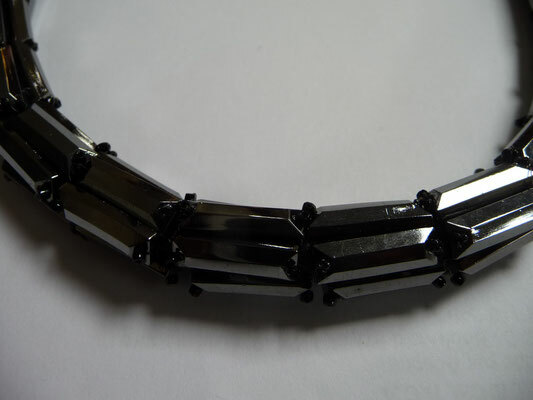 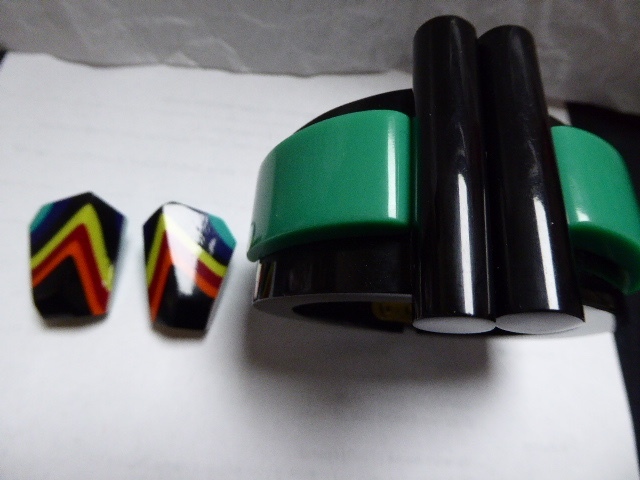 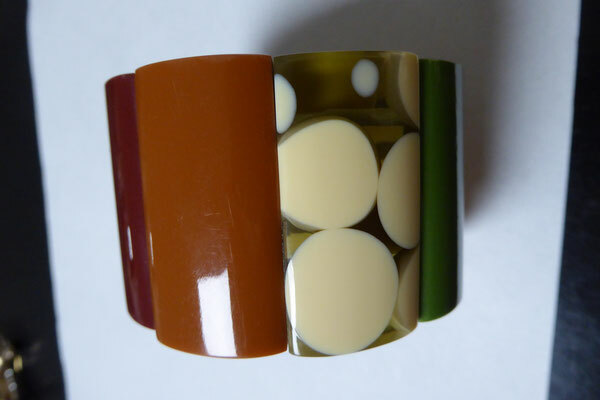 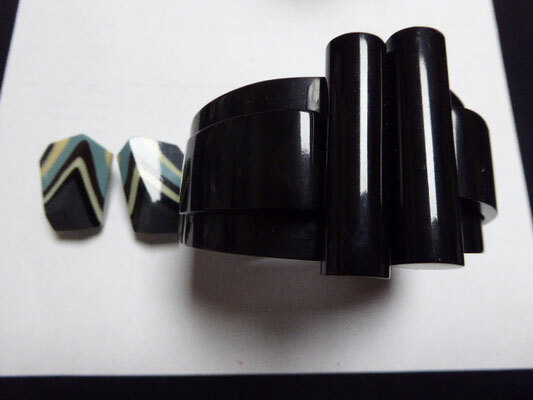 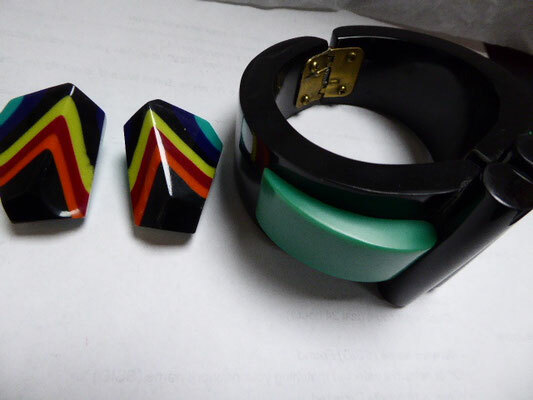 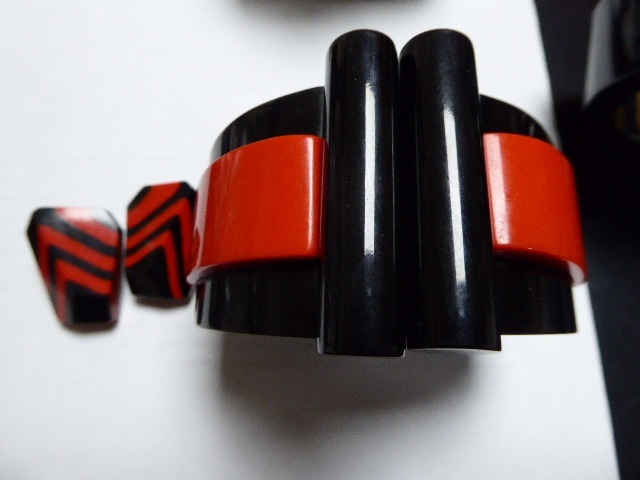 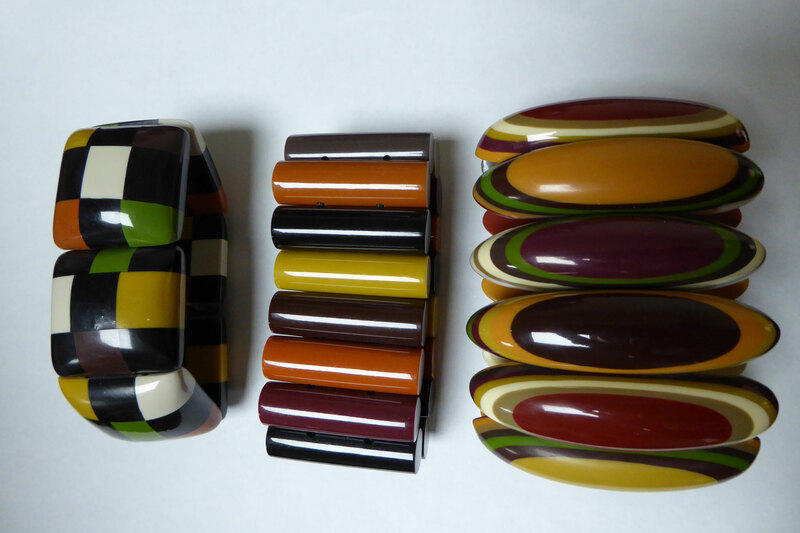 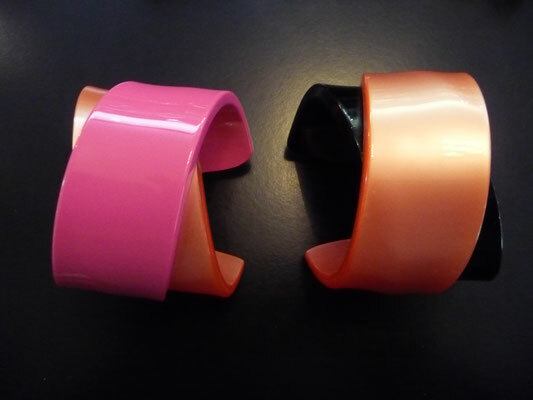 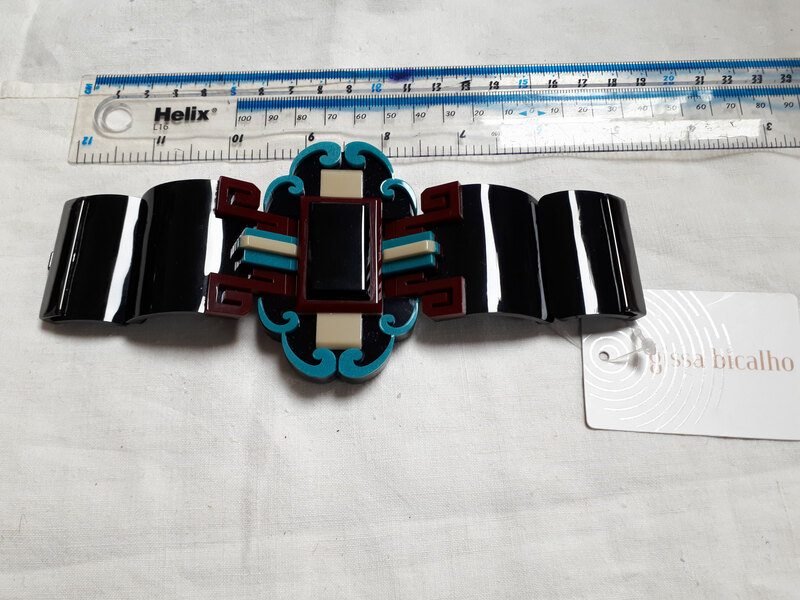 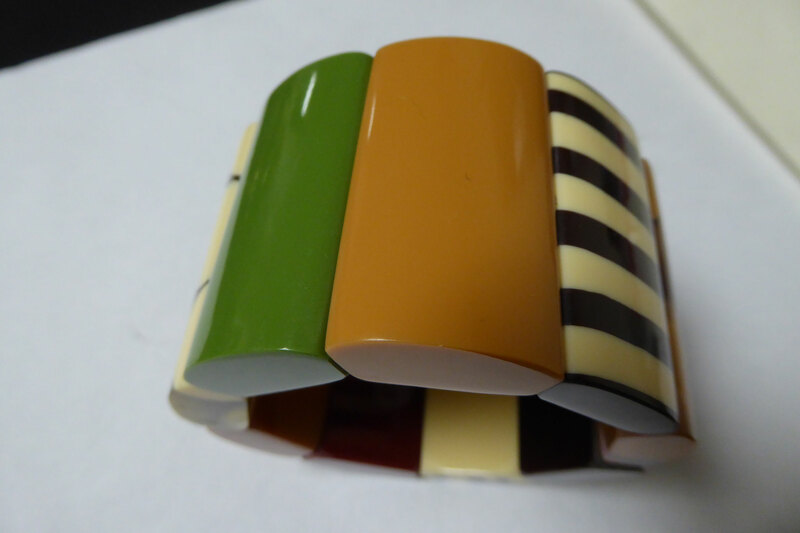 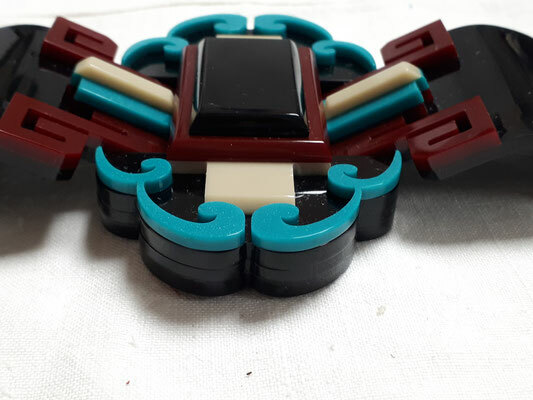 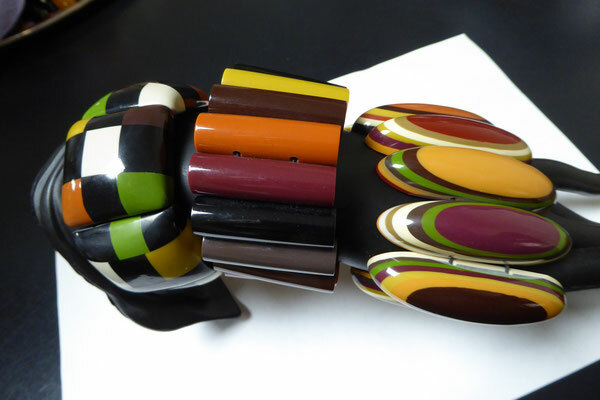 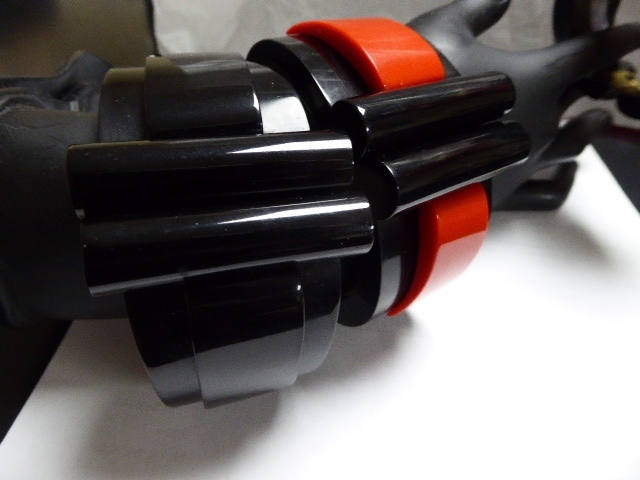 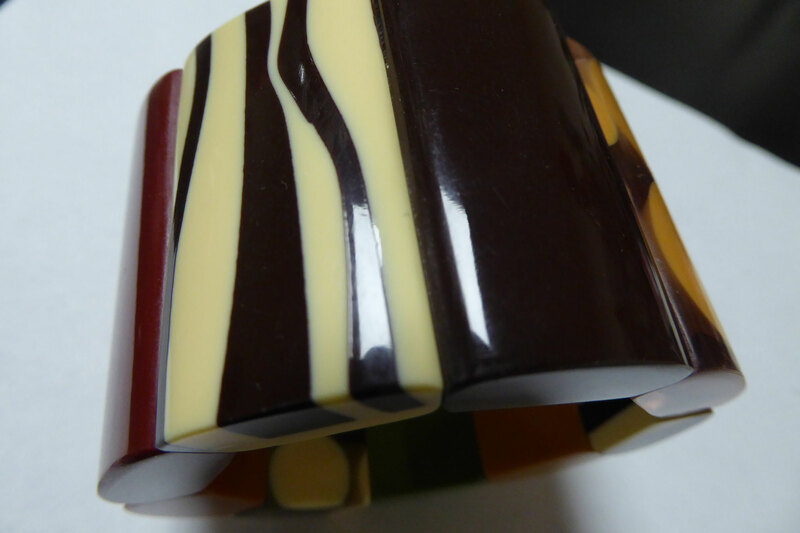 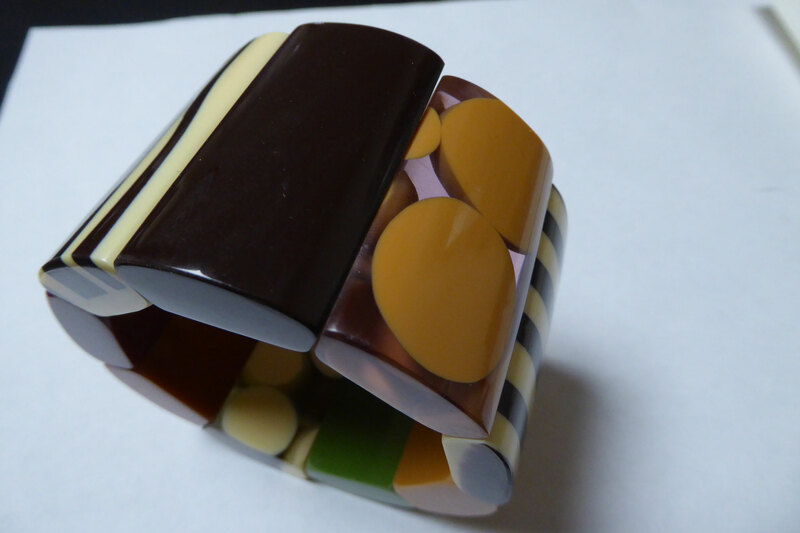 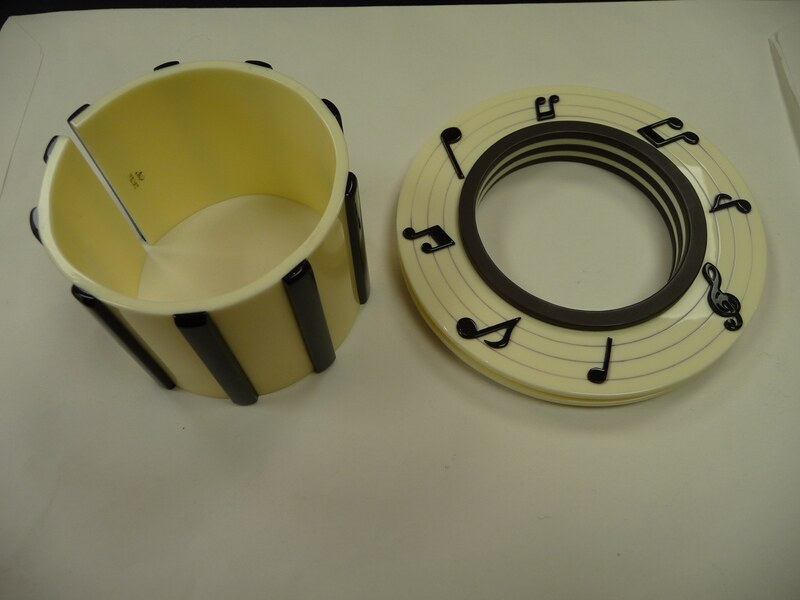 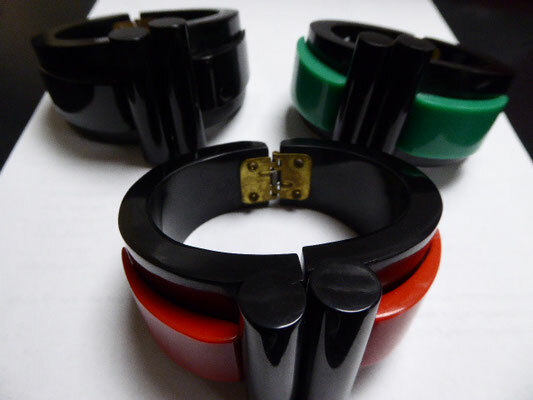 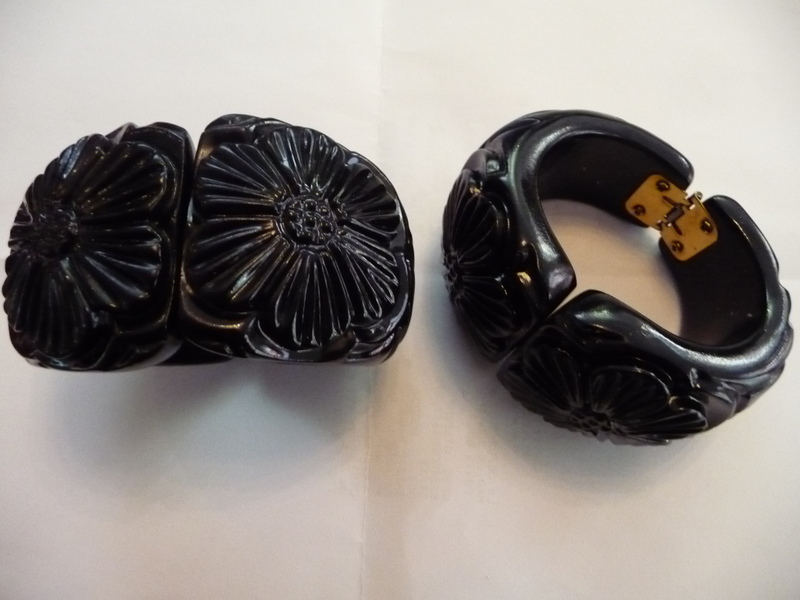 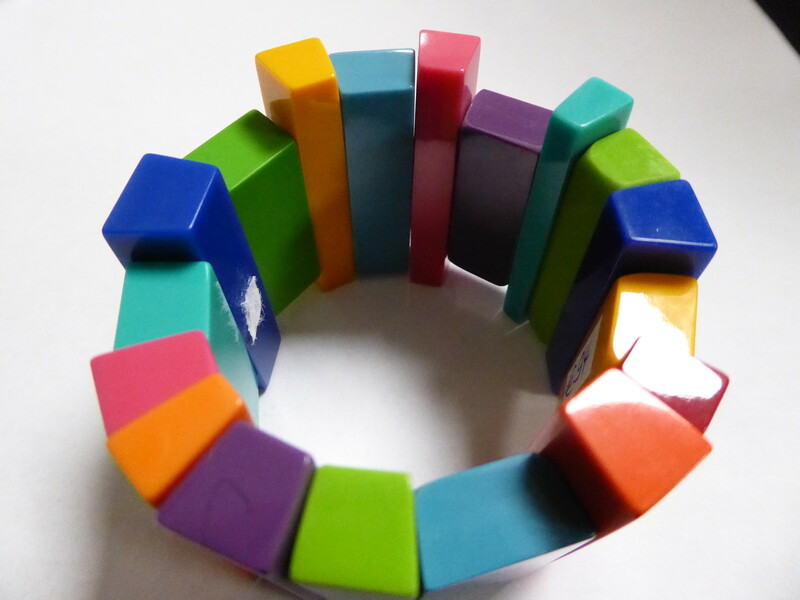 His superb cuff bracelets often have a very art deco look and are highly collectable. 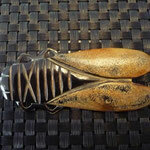 Tragically he died last year. 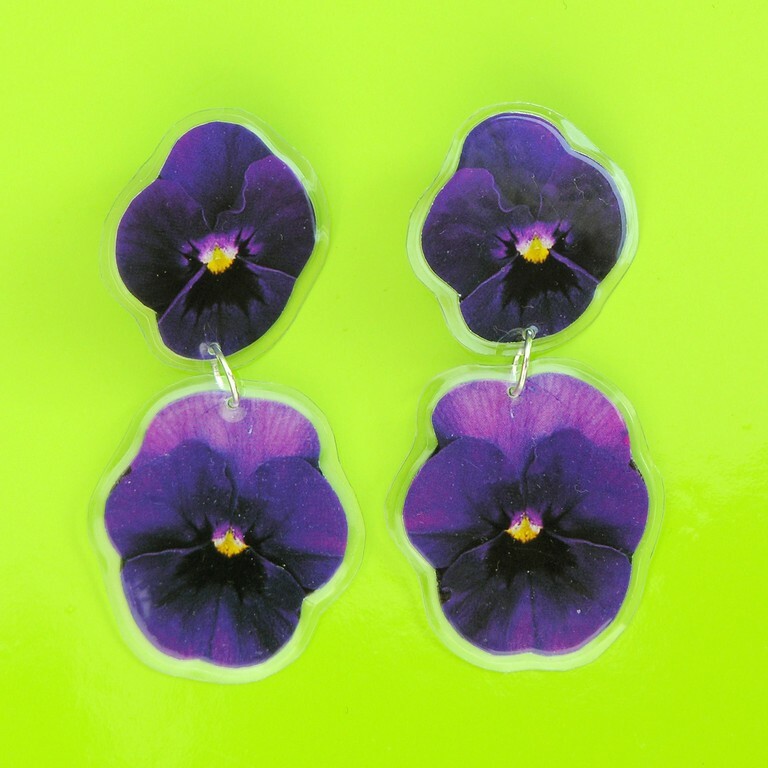 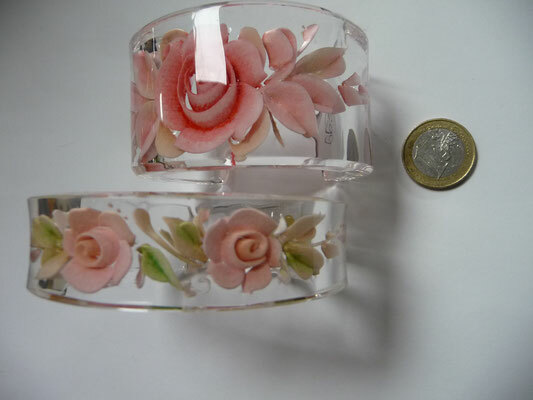 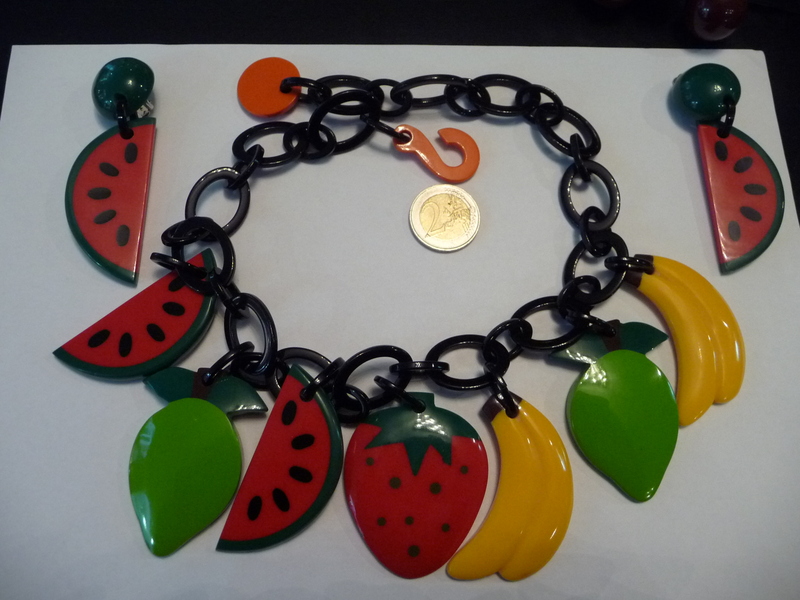 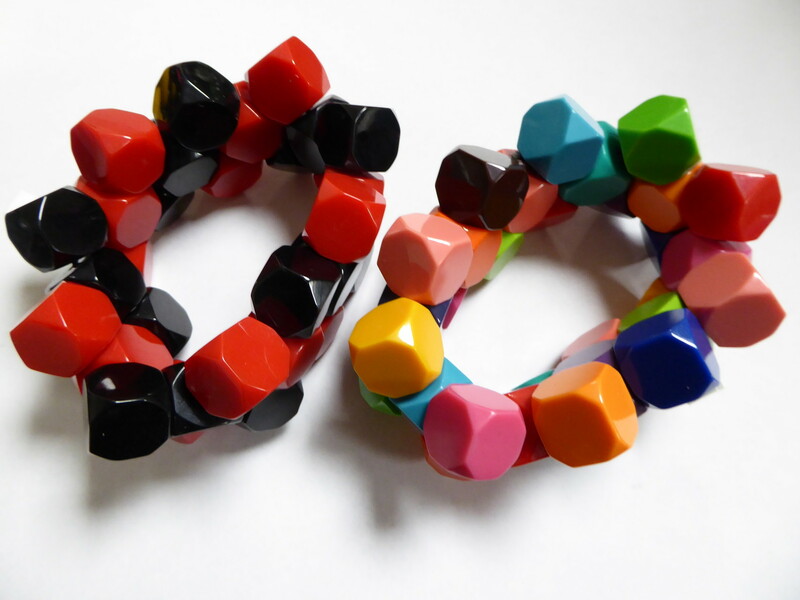 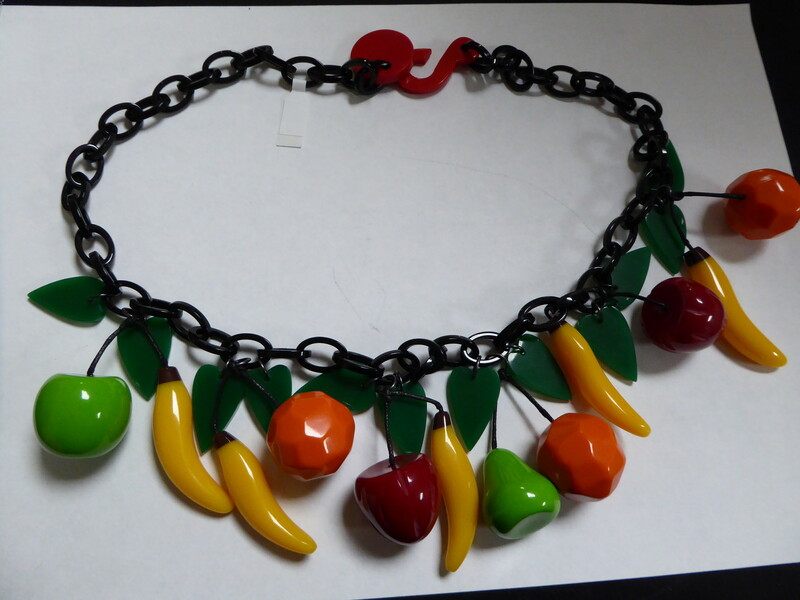 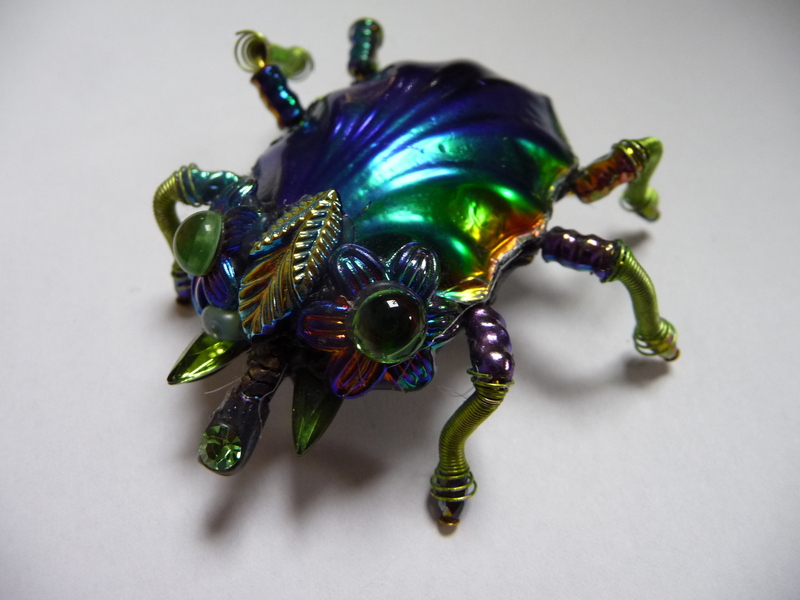 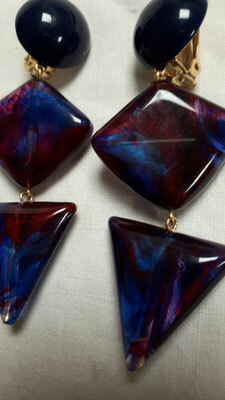 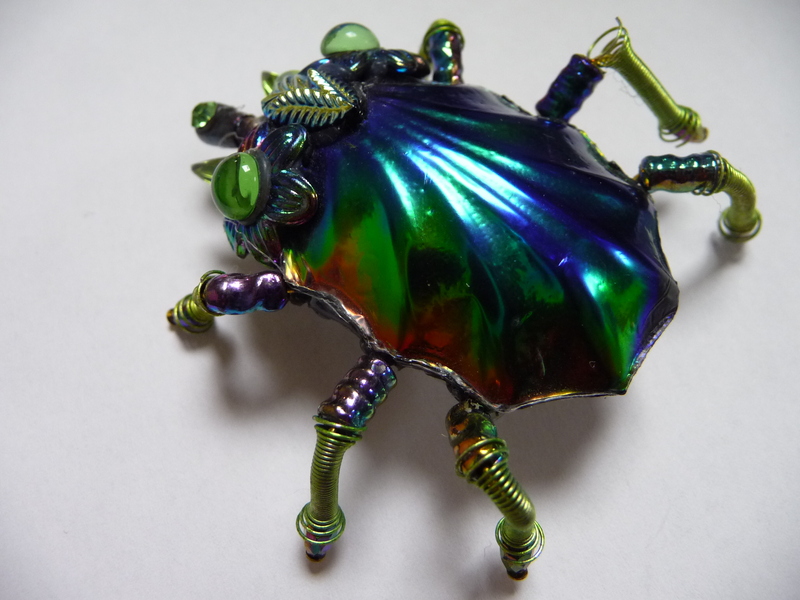 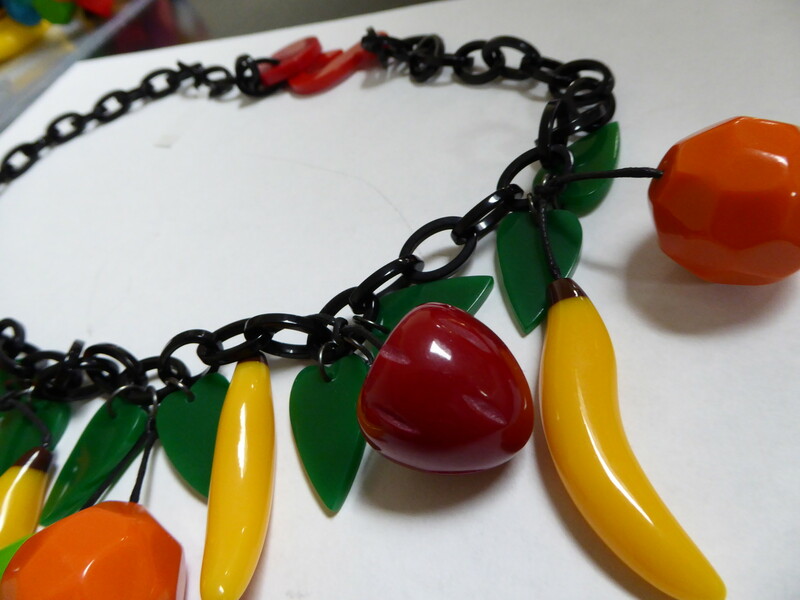 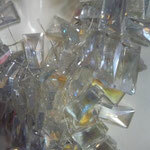 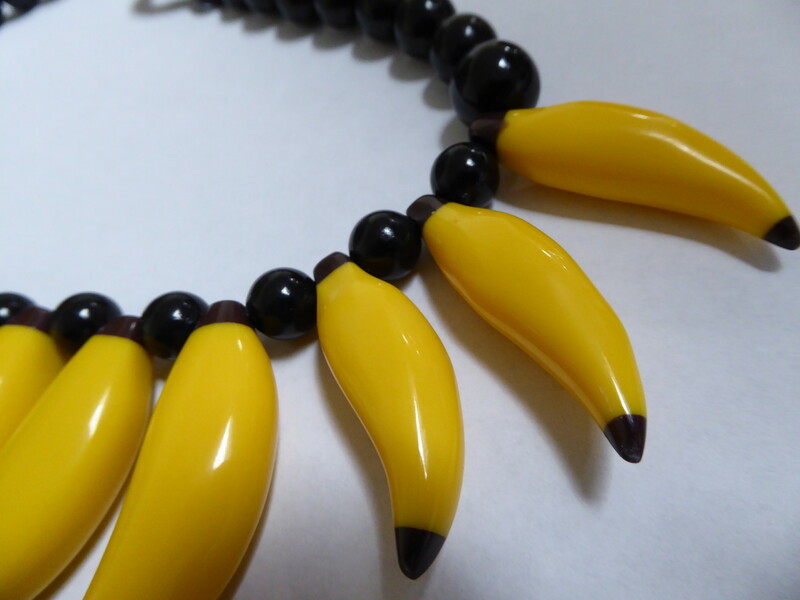 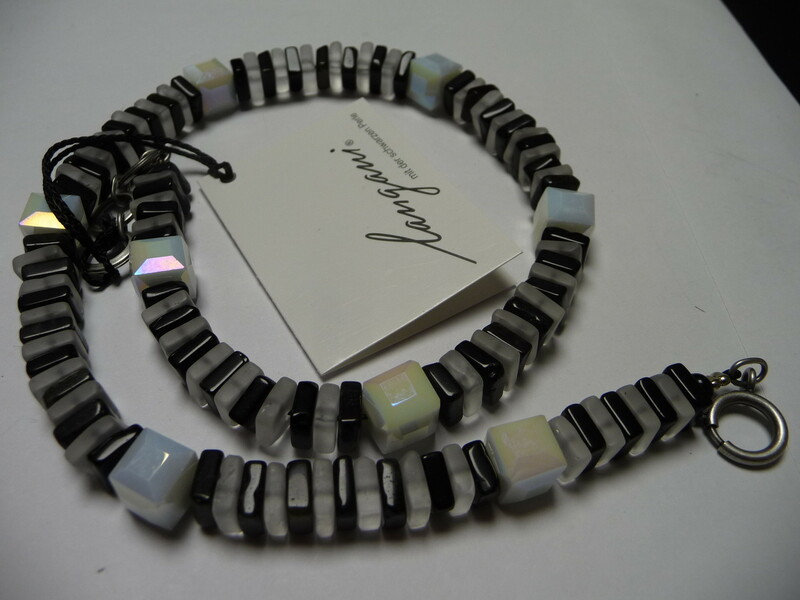 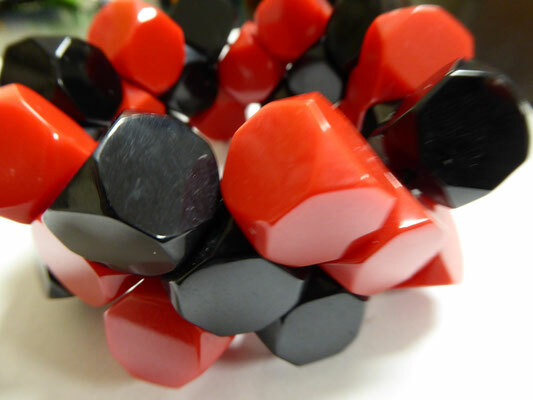 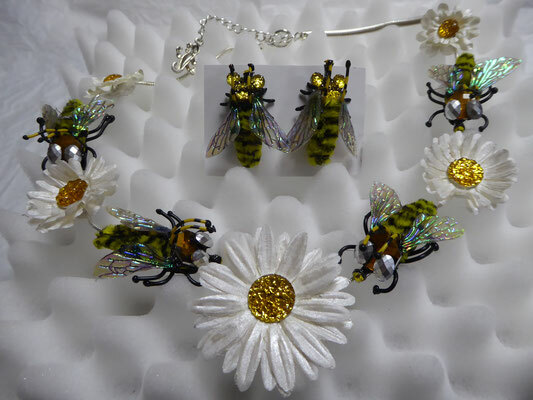 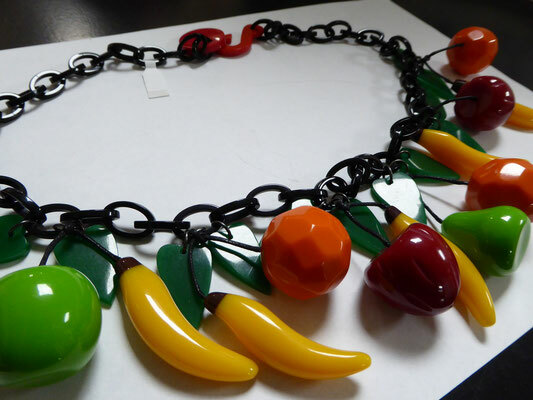 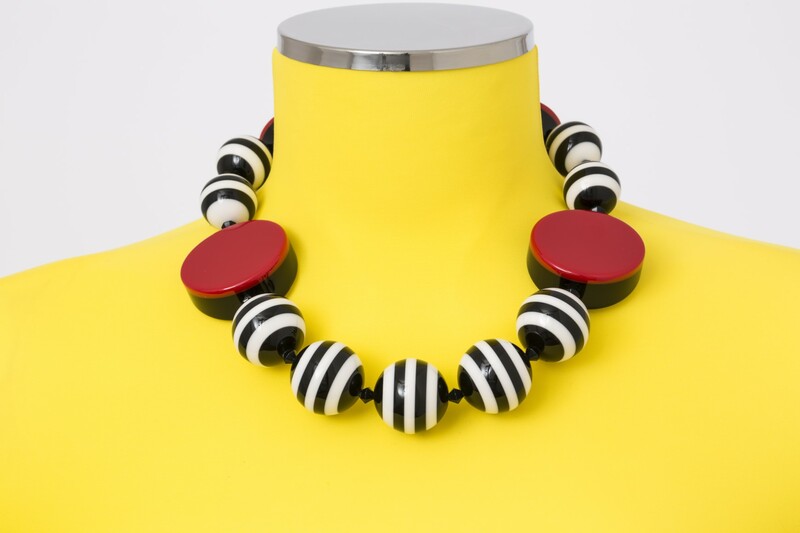 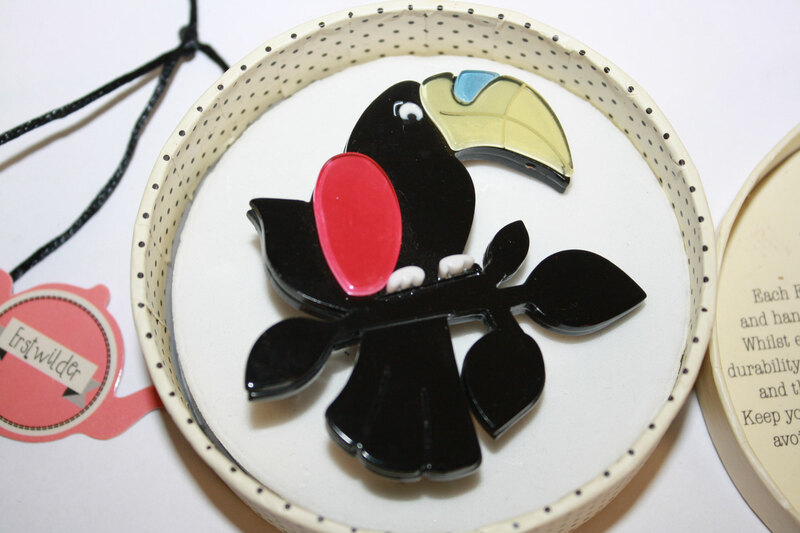 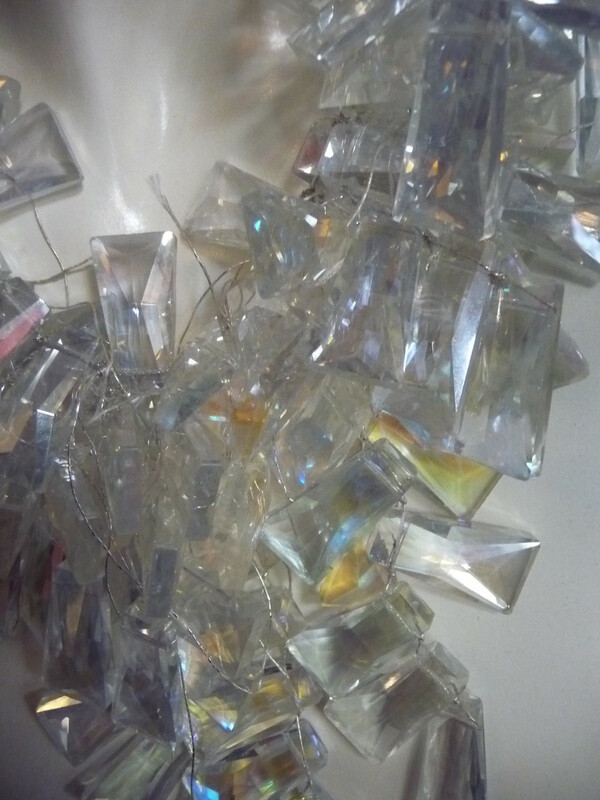 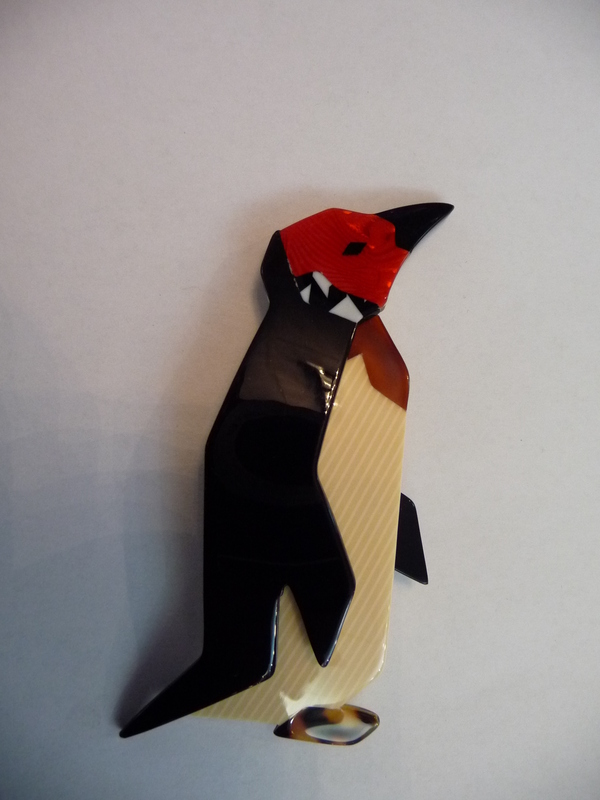 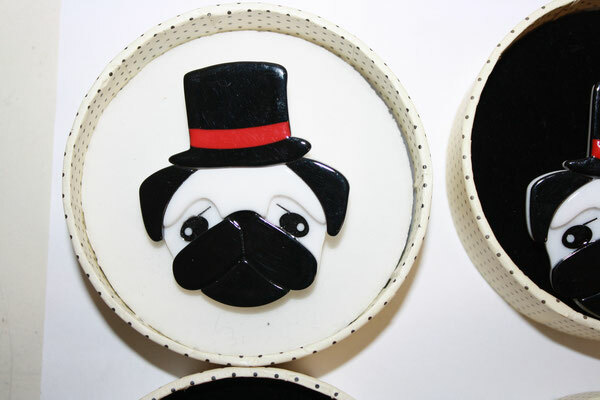 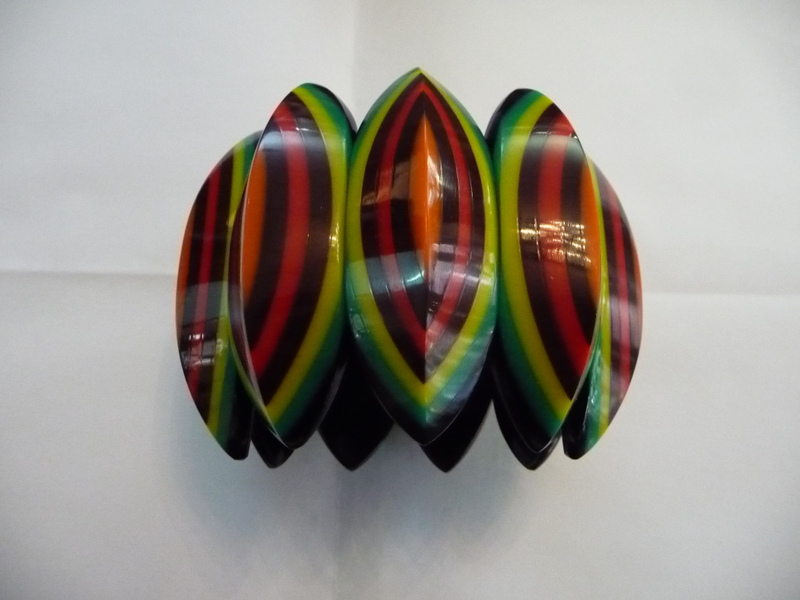 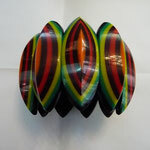 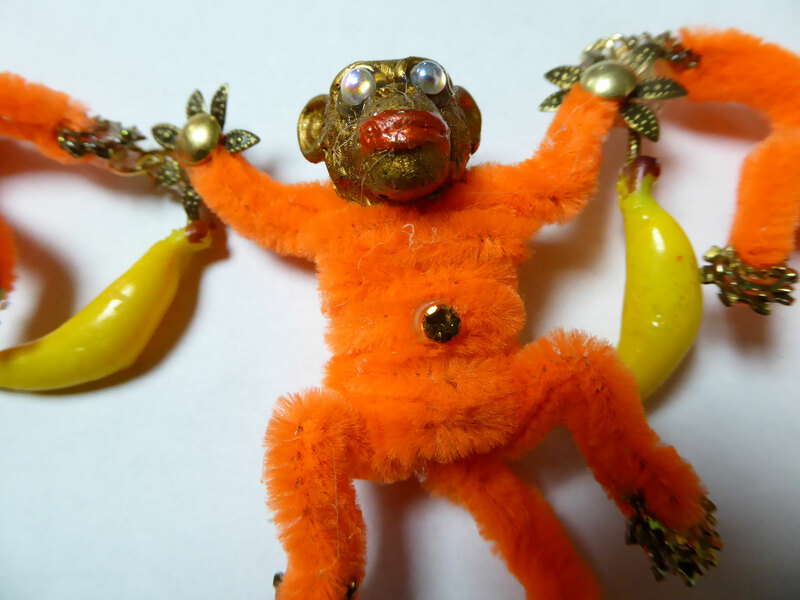 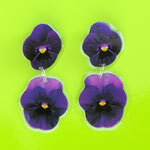 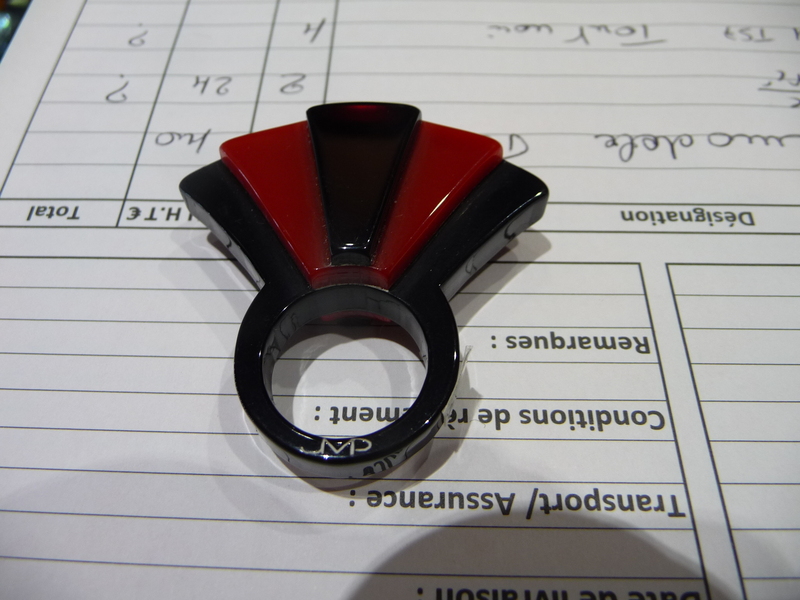 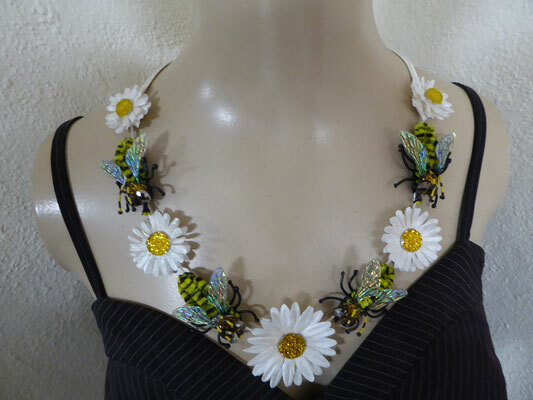 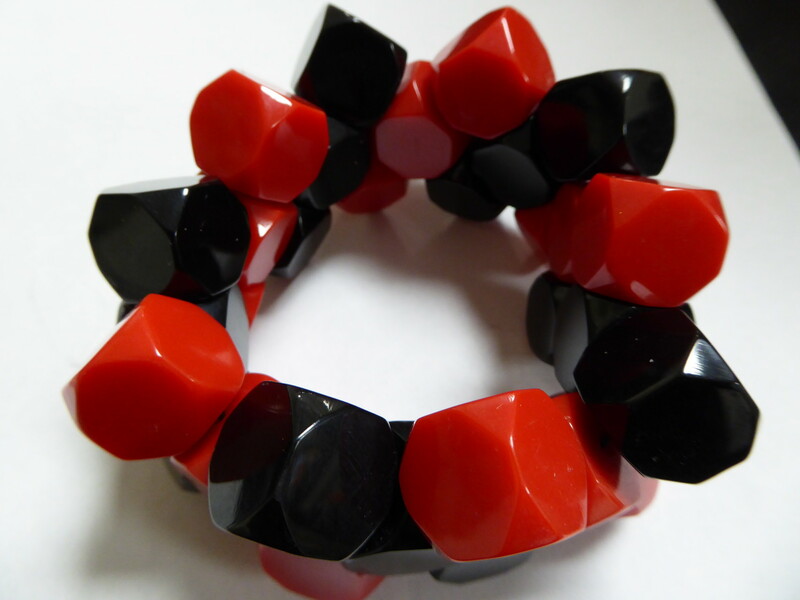 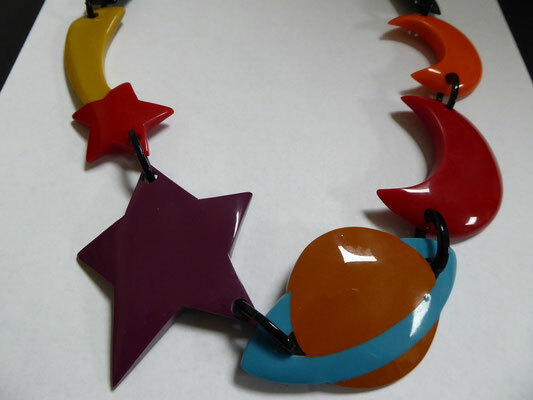 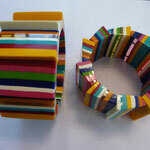 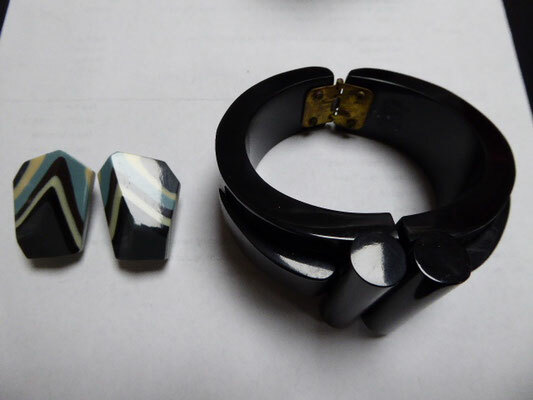 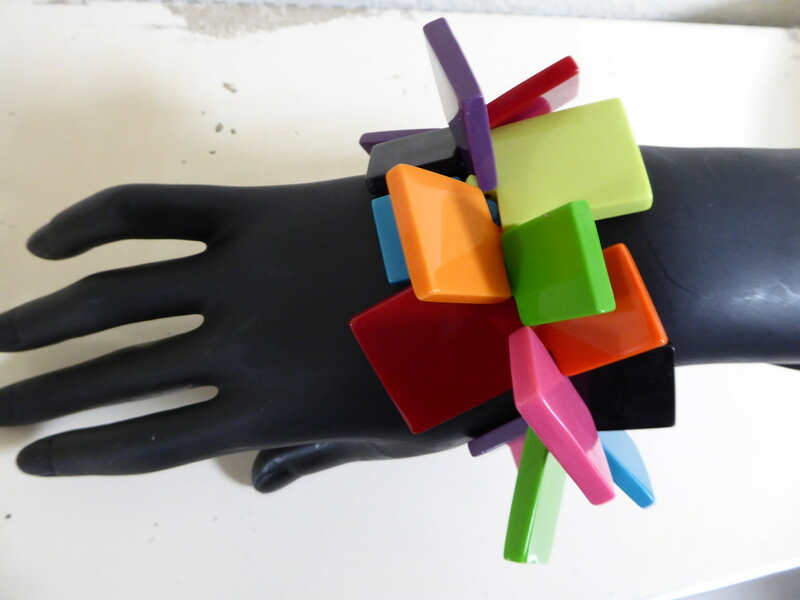 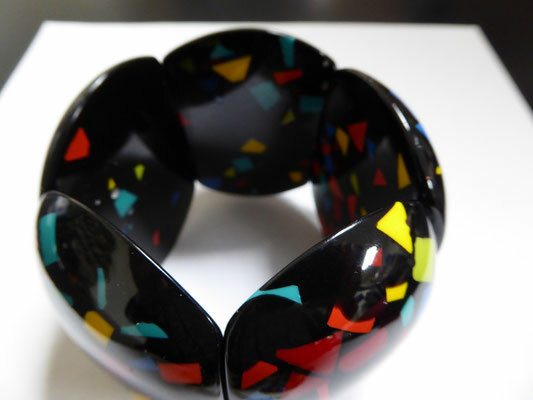 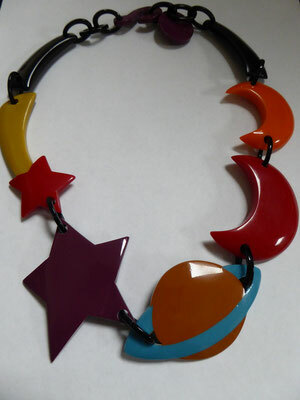 His loss is immense in the world of contemporary acrylic jewellery. 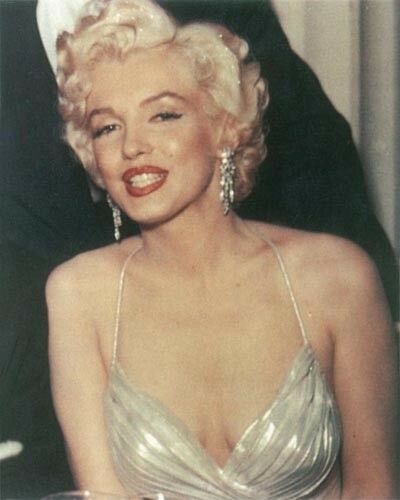 No one works like him. 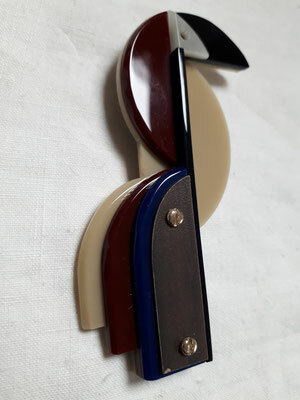 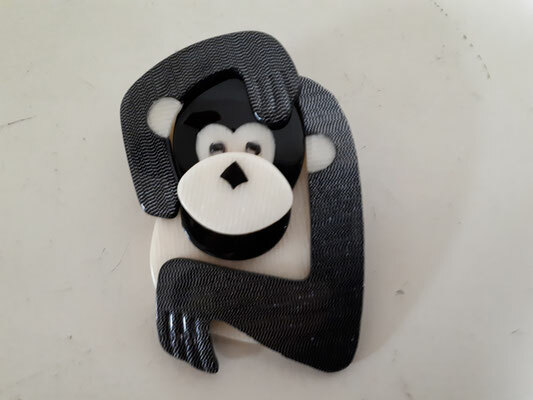 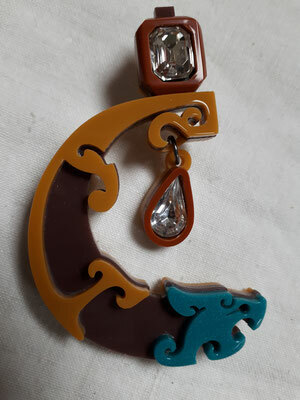 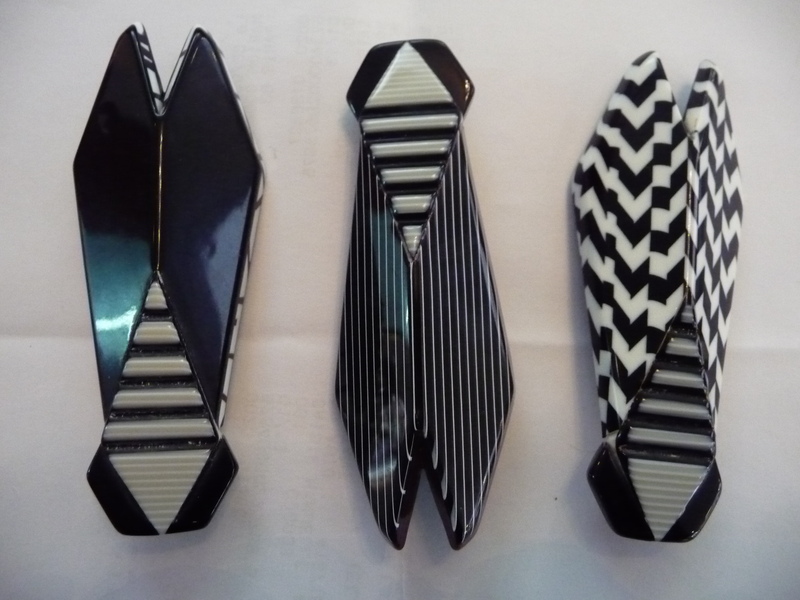 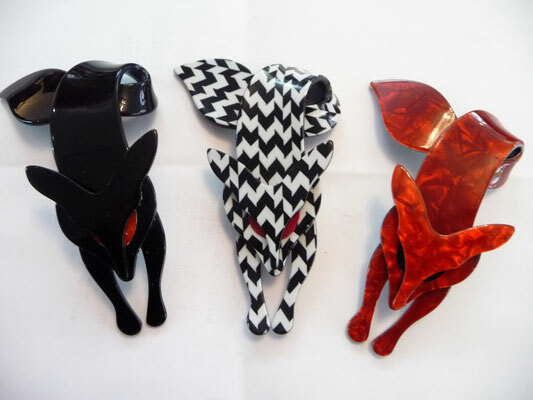 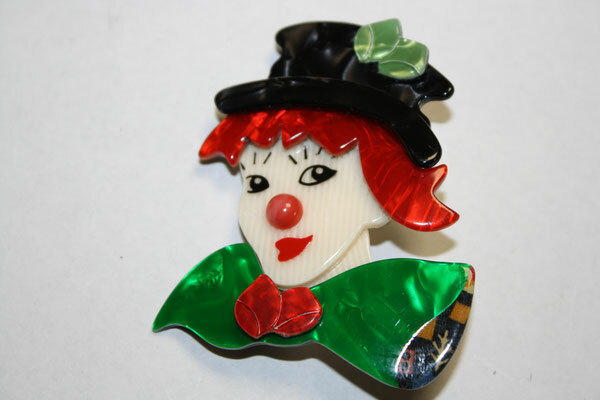 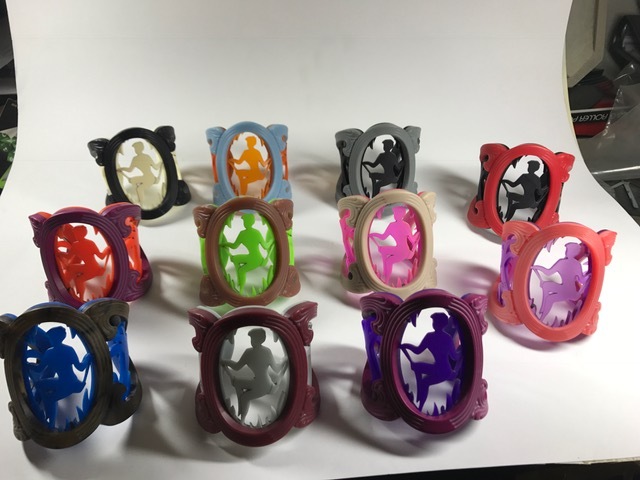 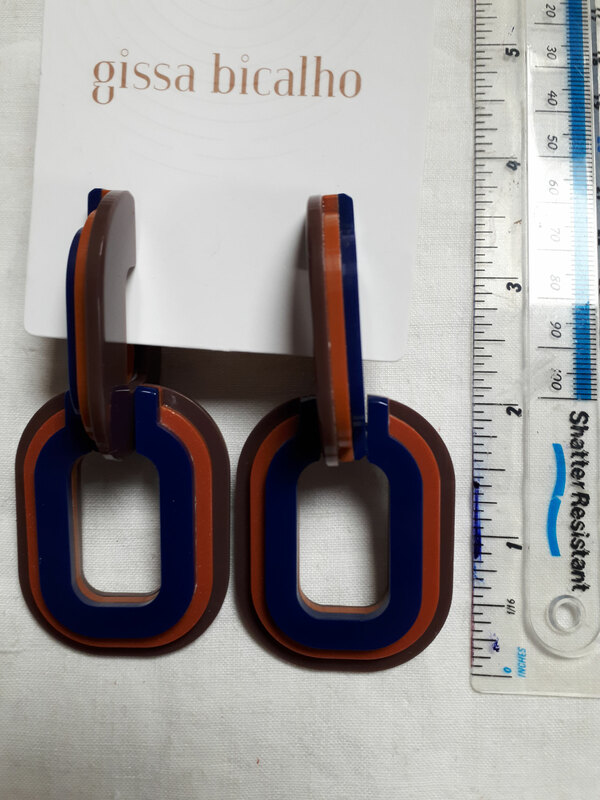 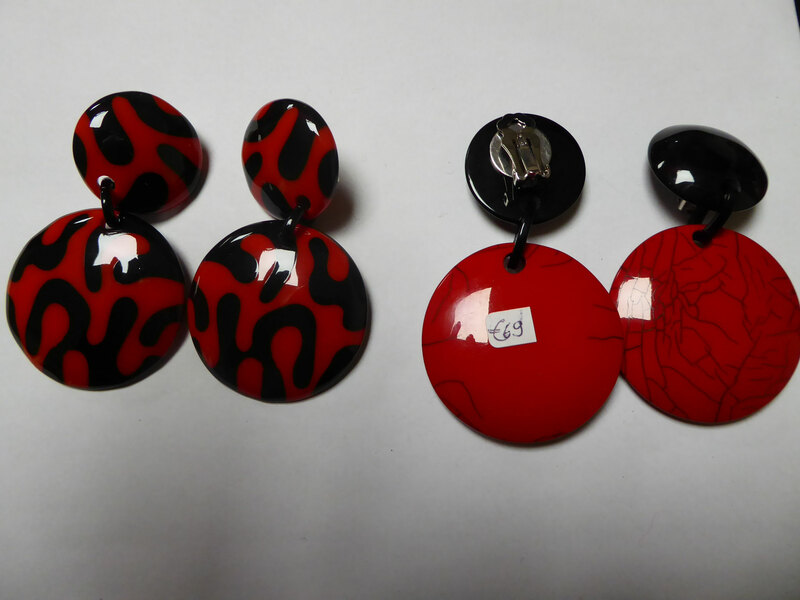 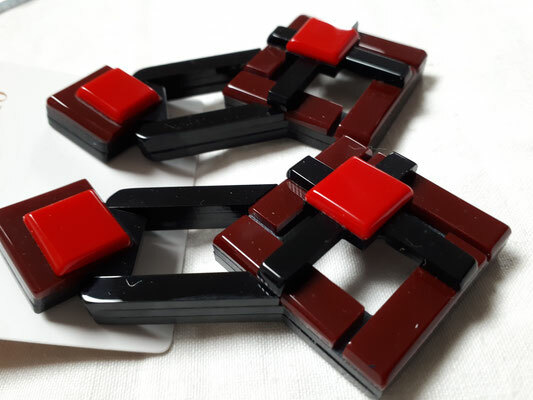 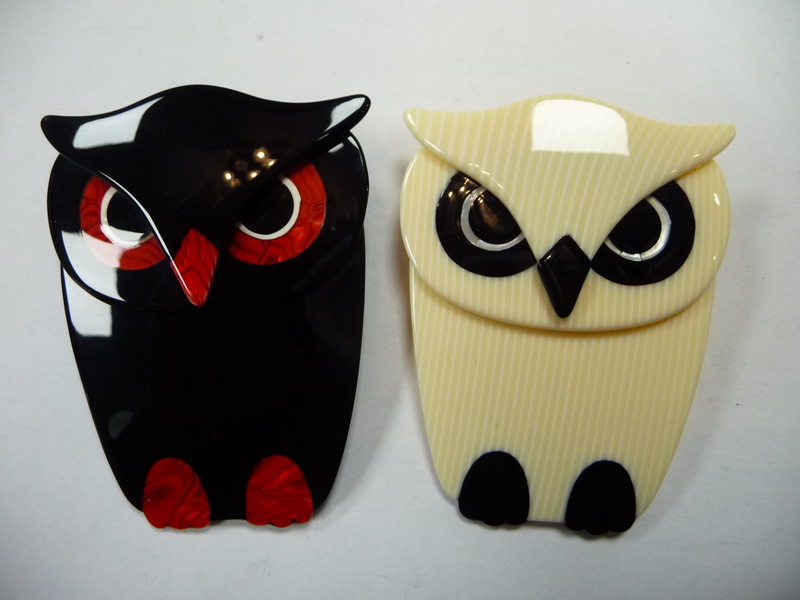 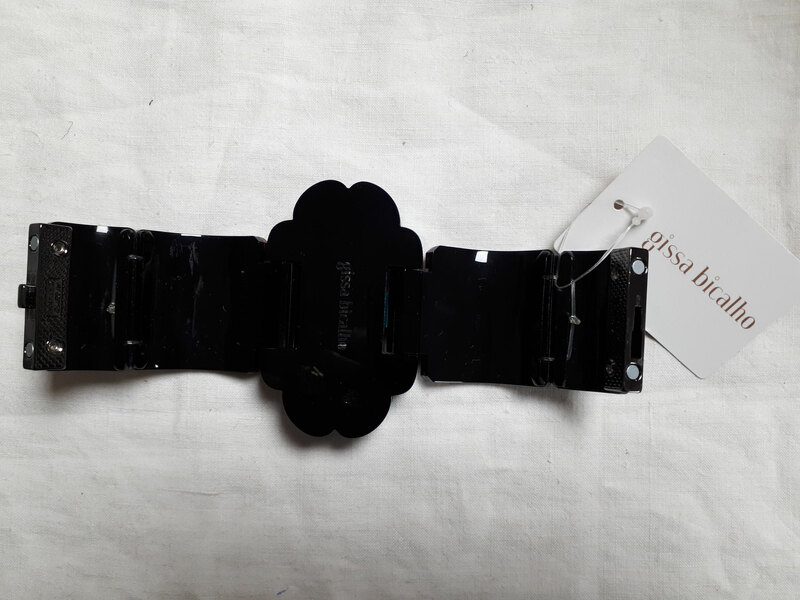 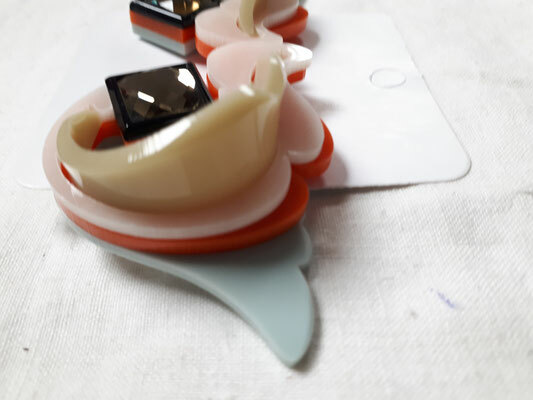 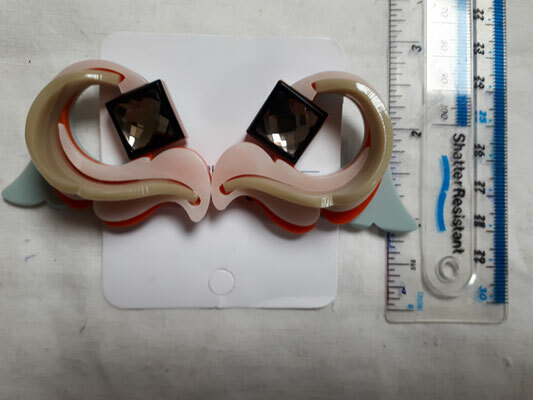 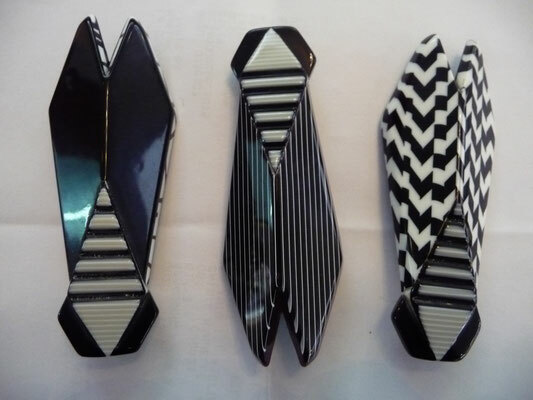 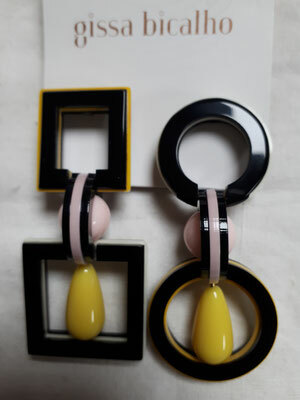 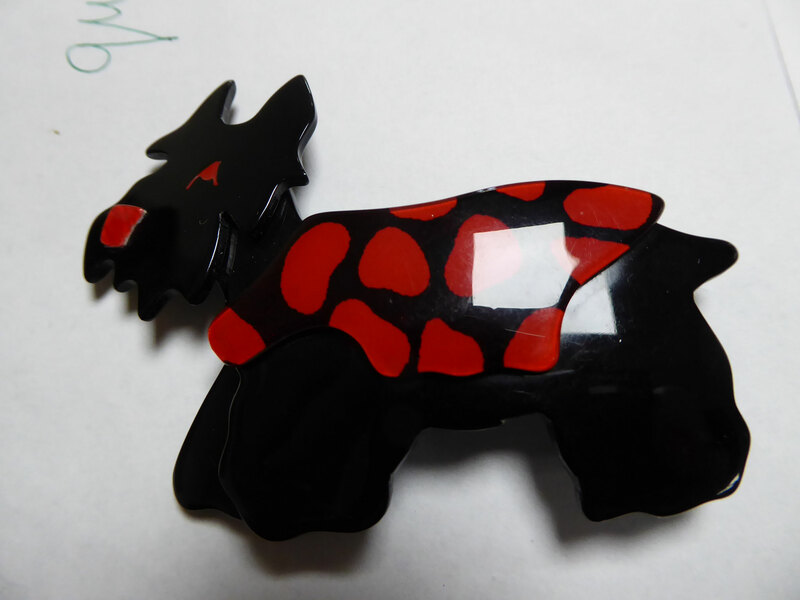 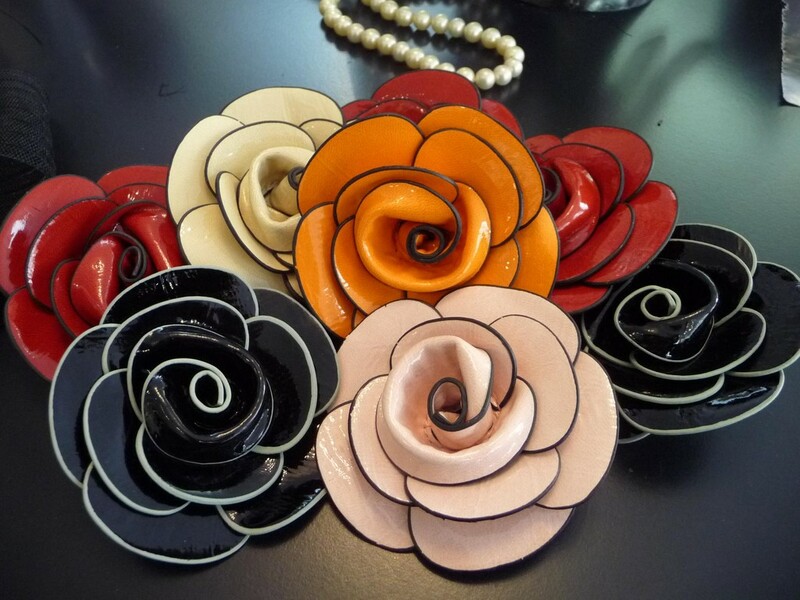 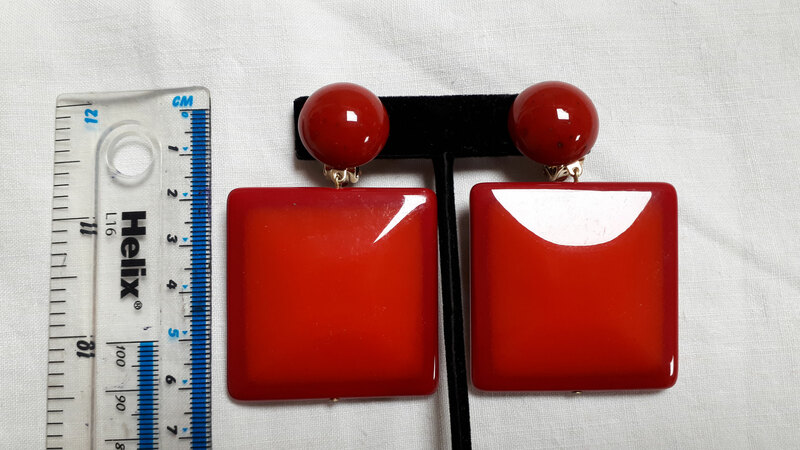 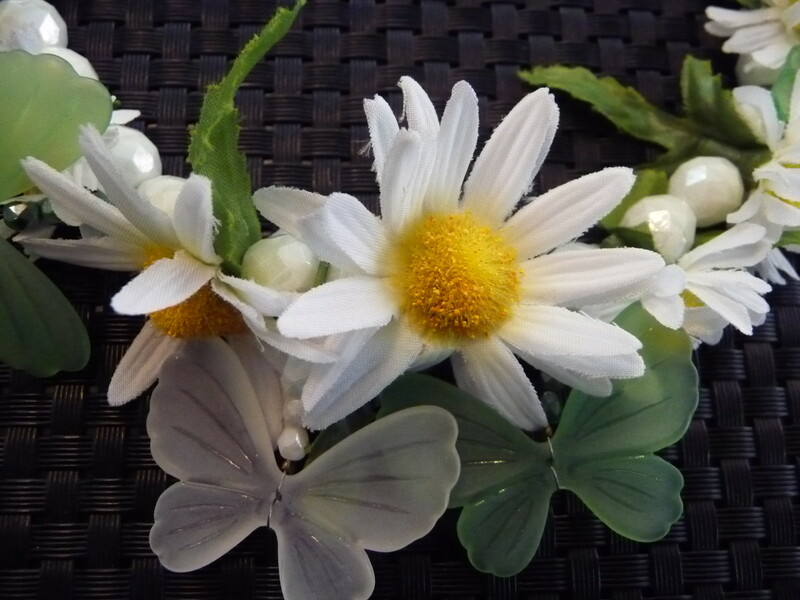 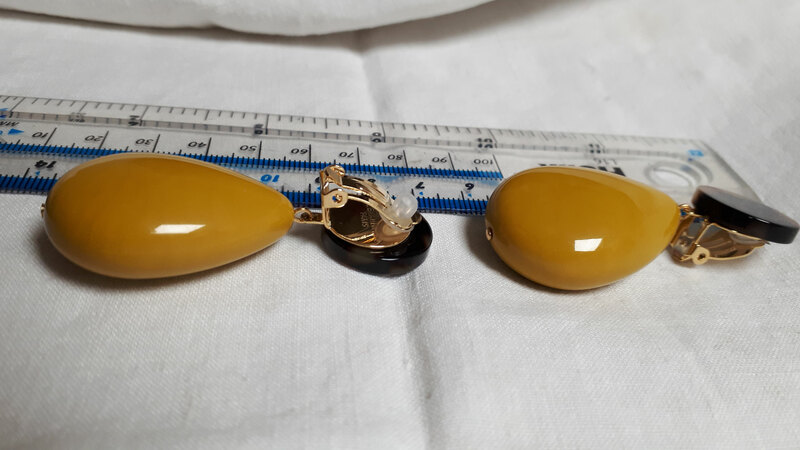 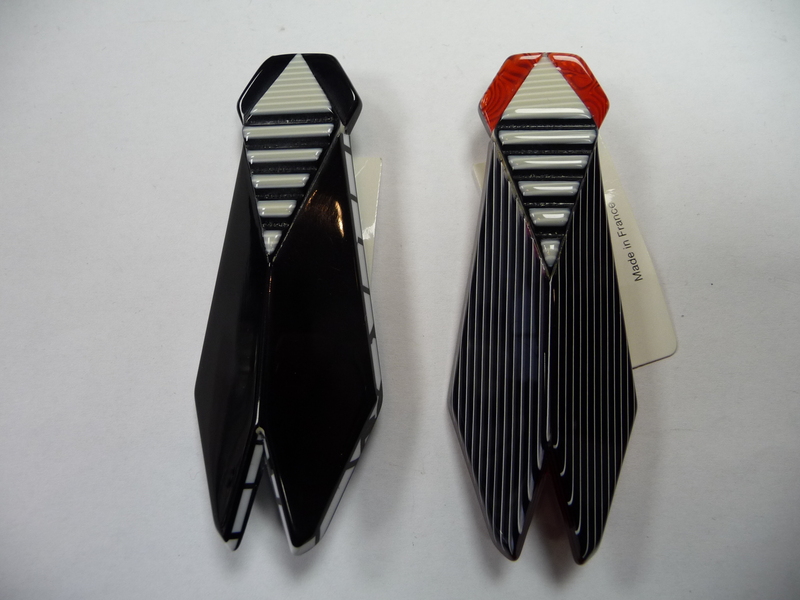 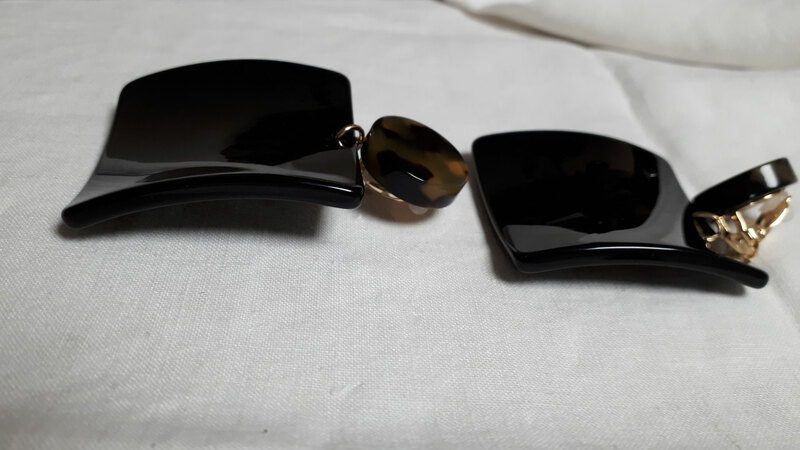 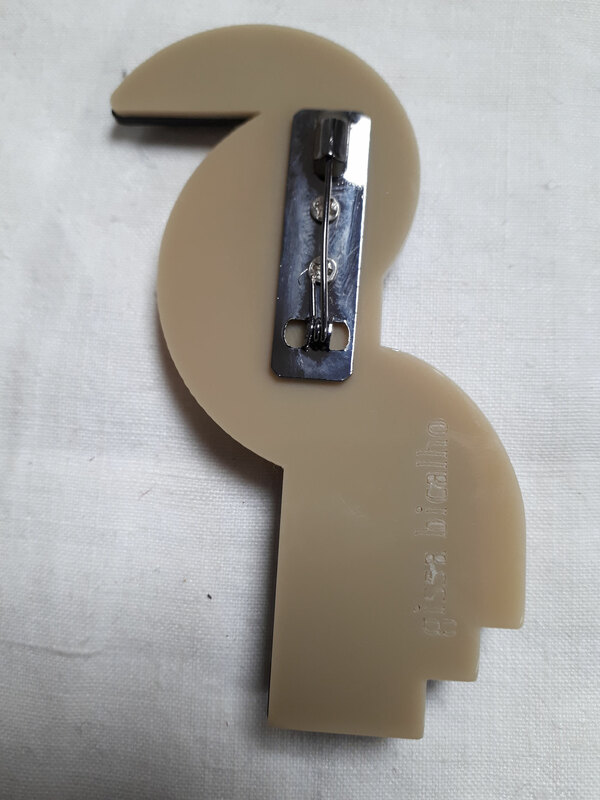 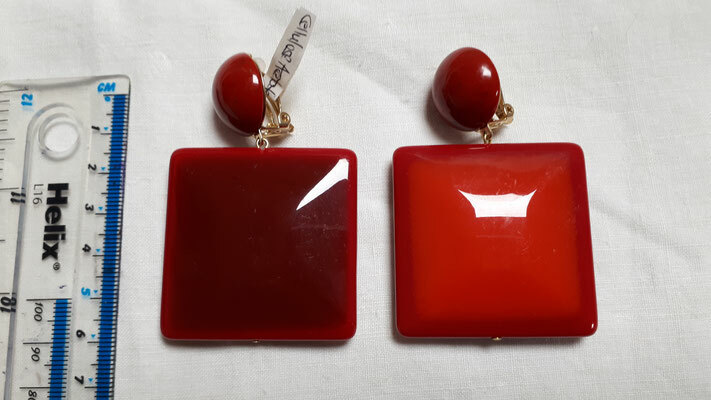 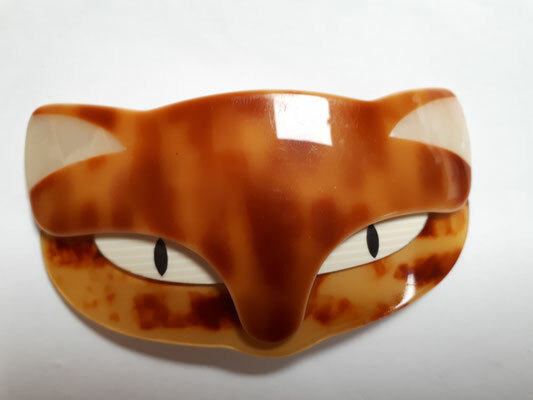 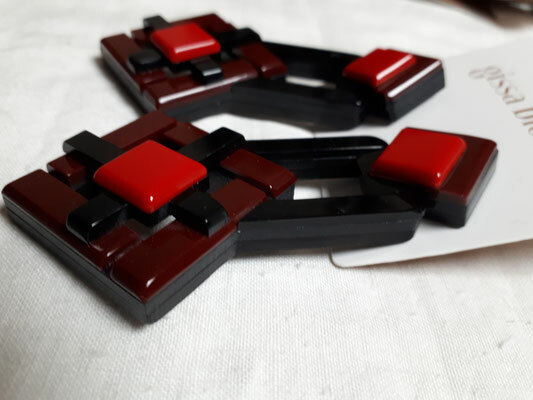 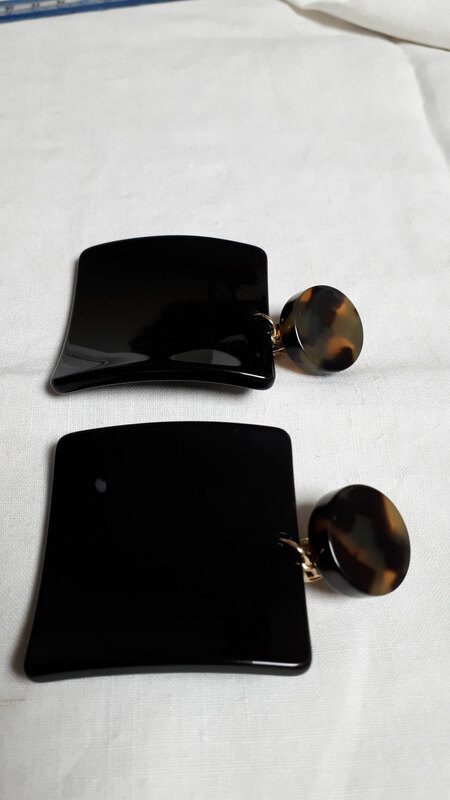 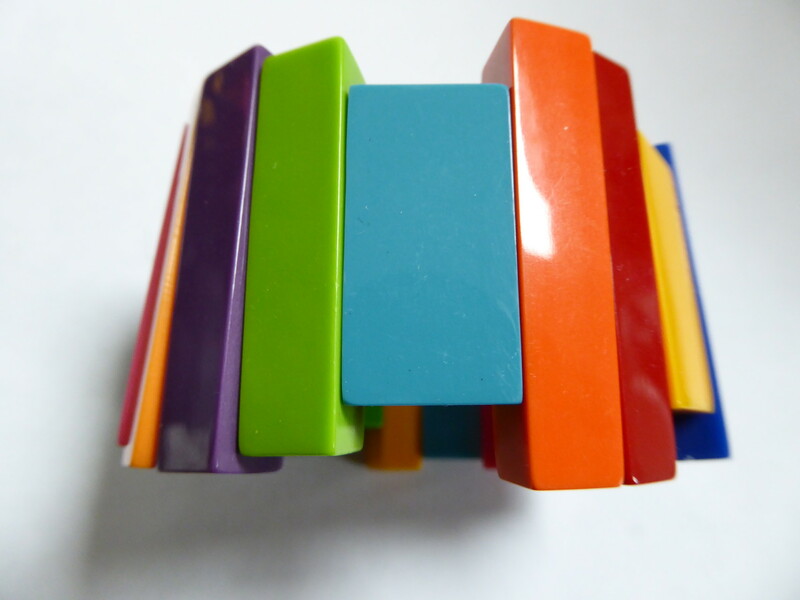 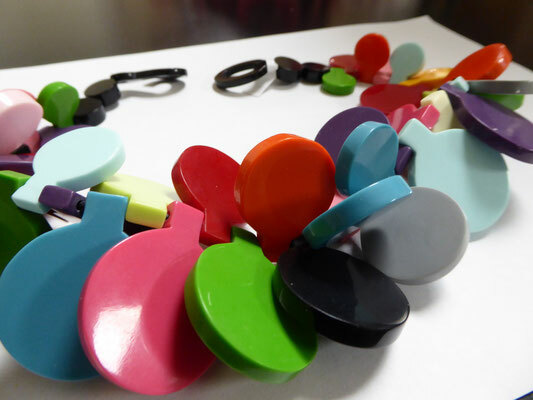 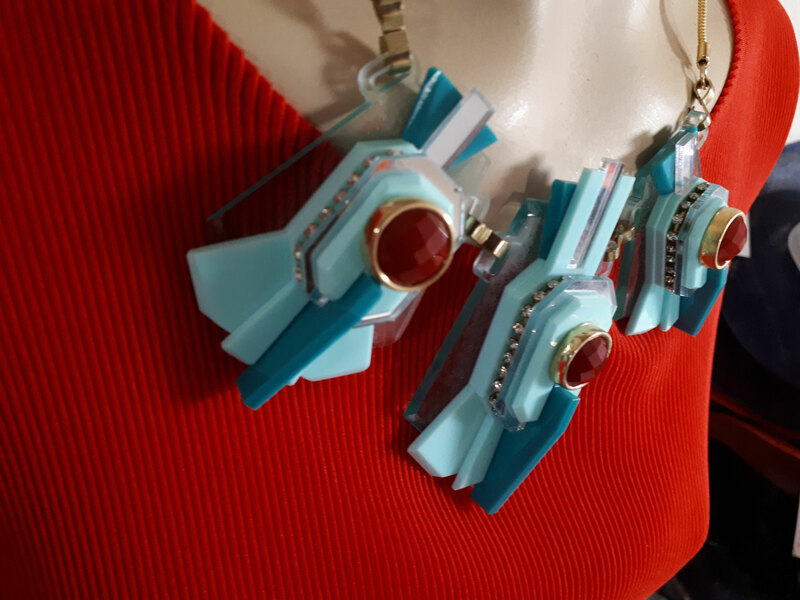 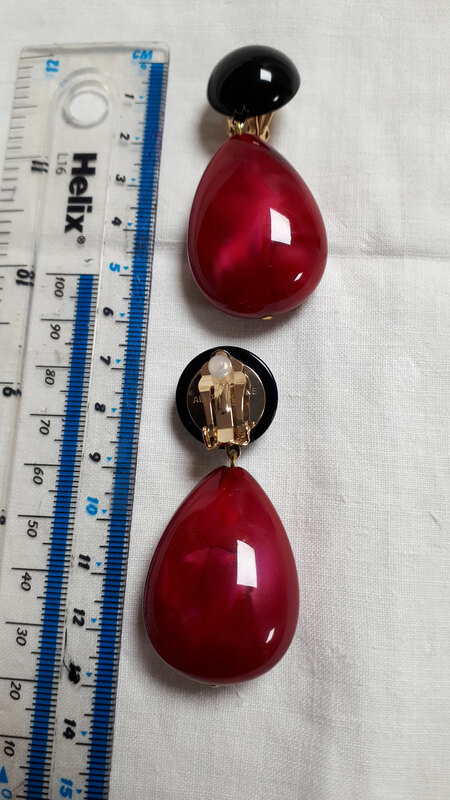 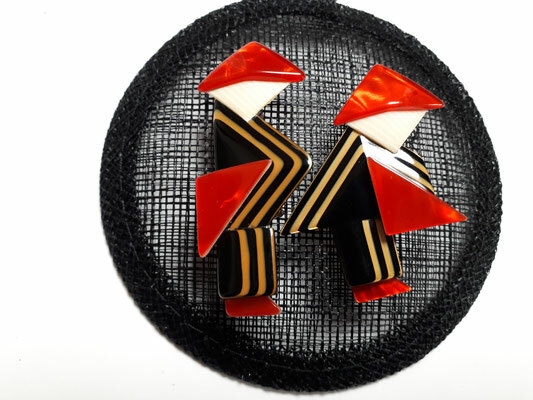 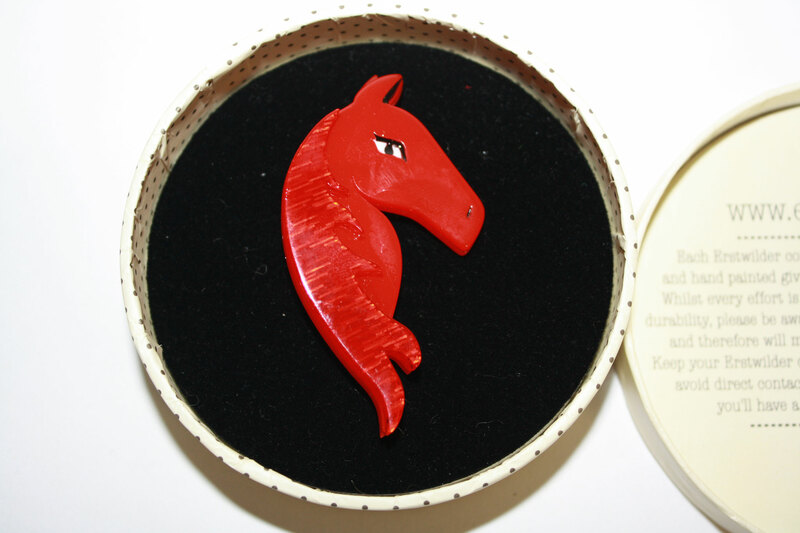 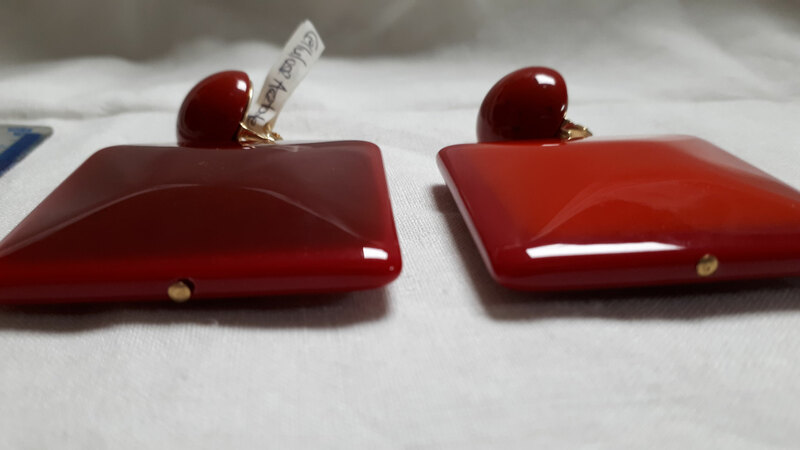 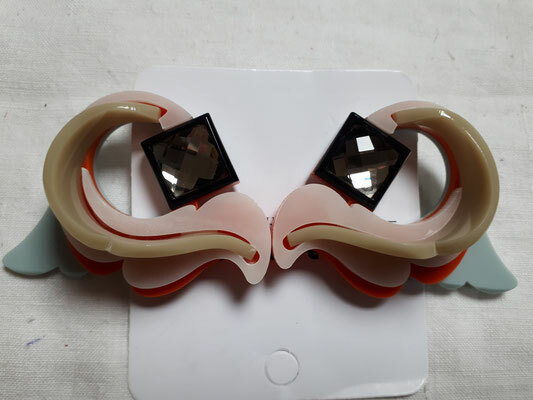 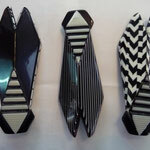 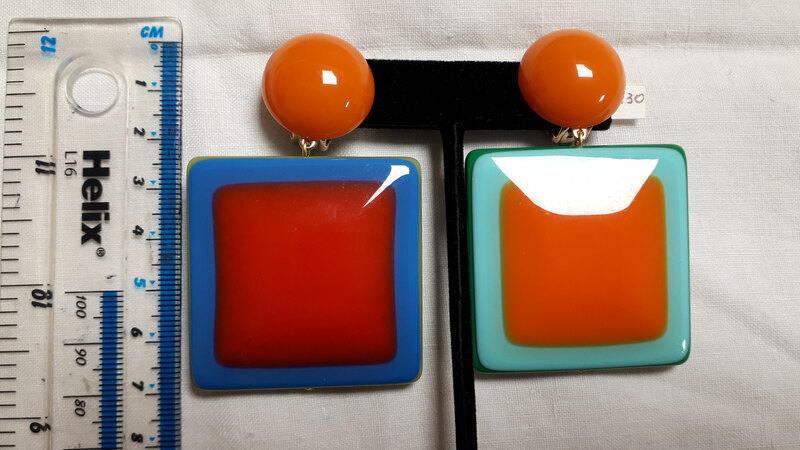 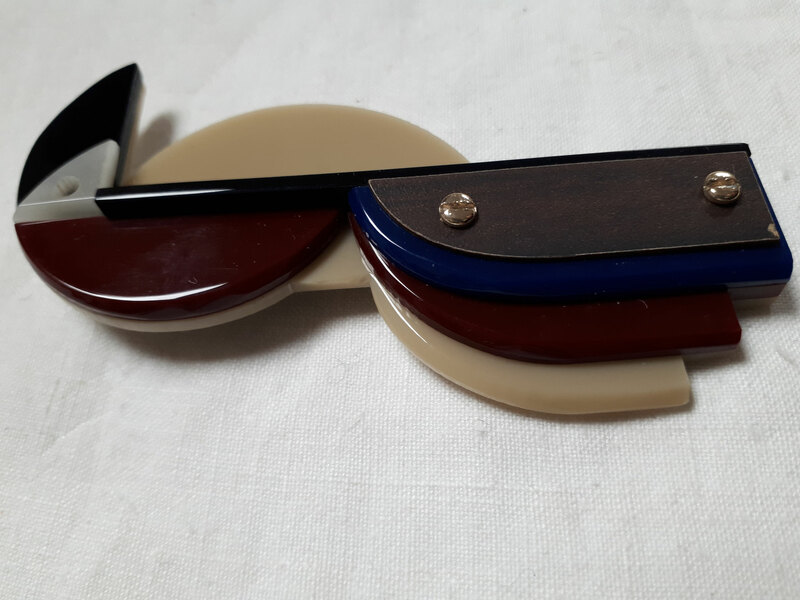 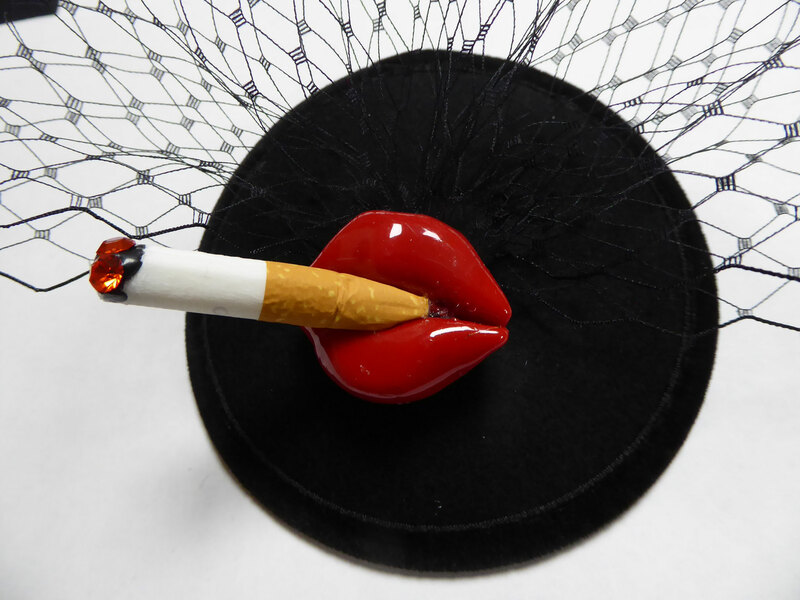 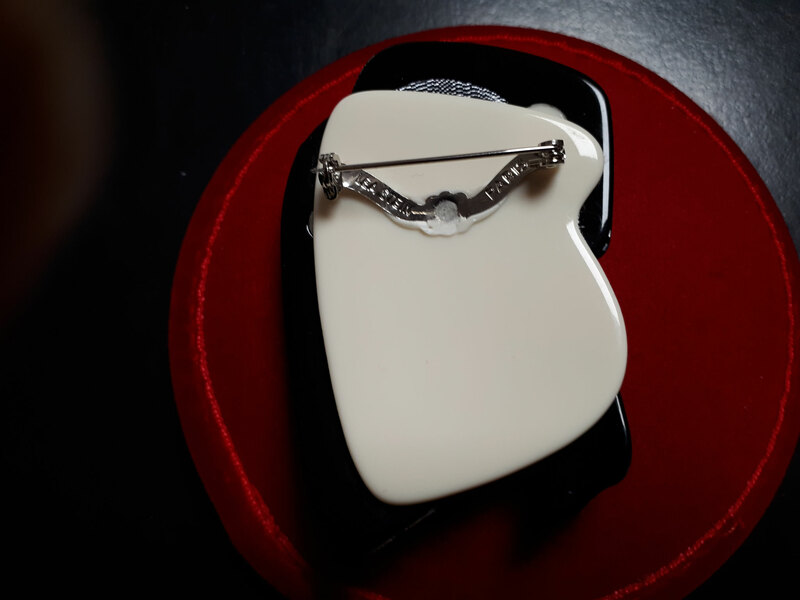 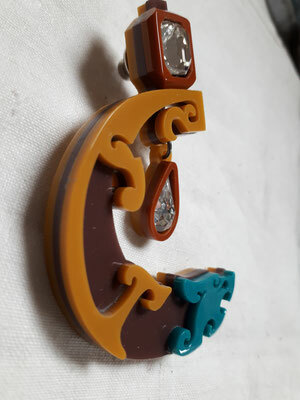 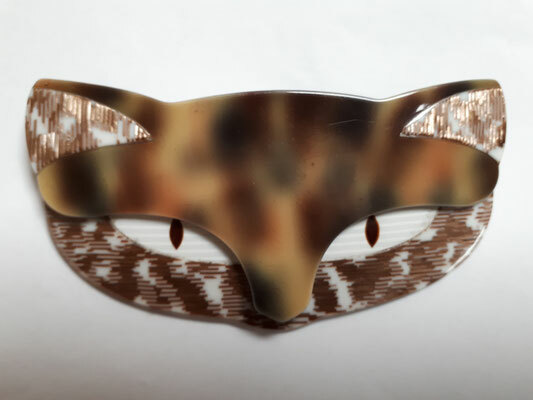 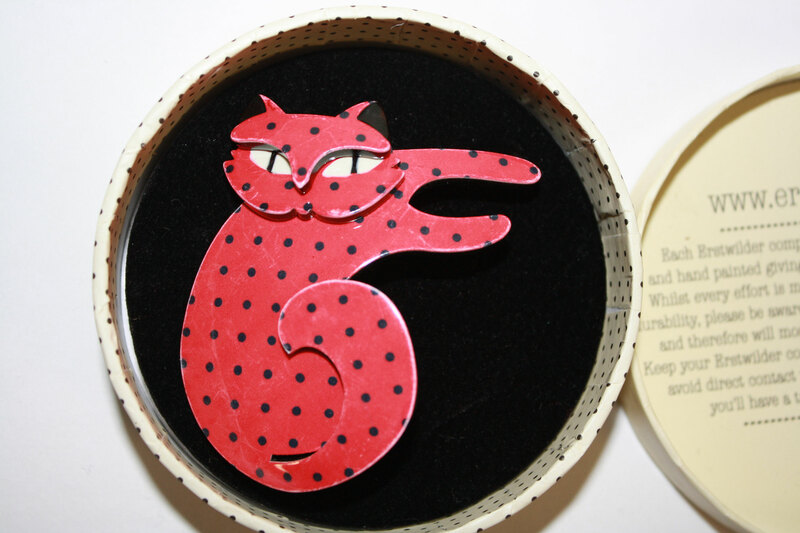 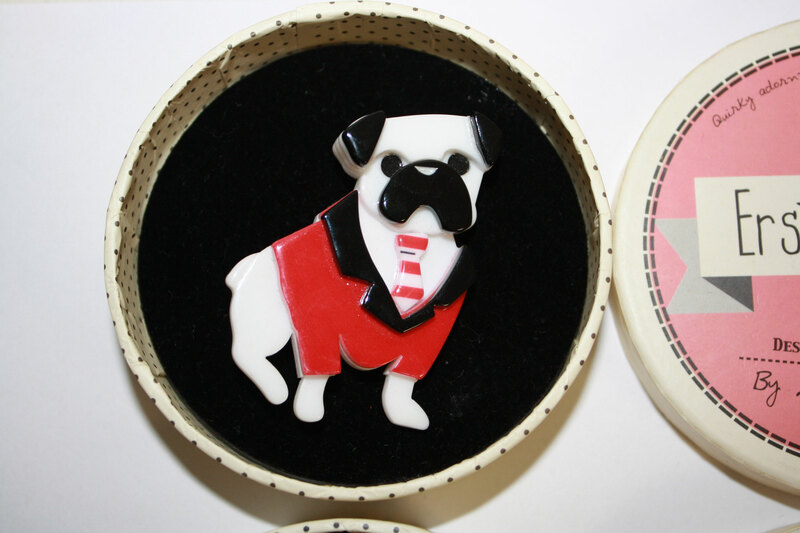 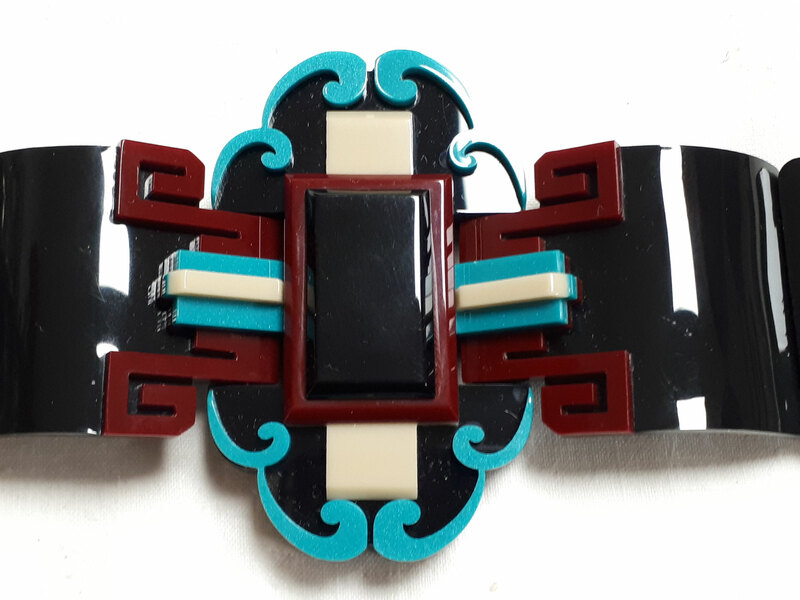 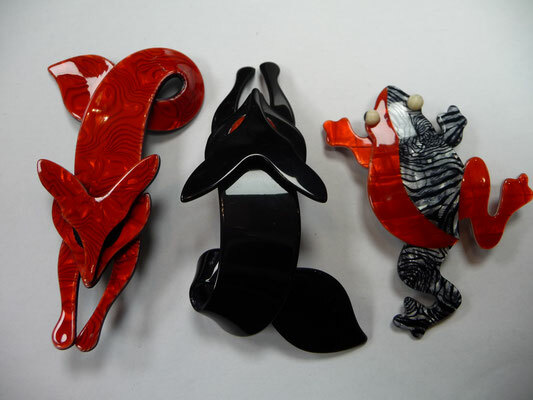 LEA STEIN BROOCHES.....made of cellulose acetate and signed on the clasp at the back, Lea Stein brooches are iconic and highly collectible. 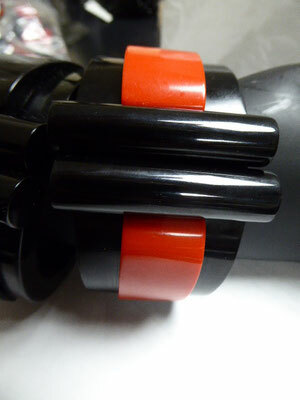 Please avoid buying cheap copies!! 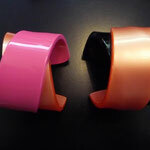 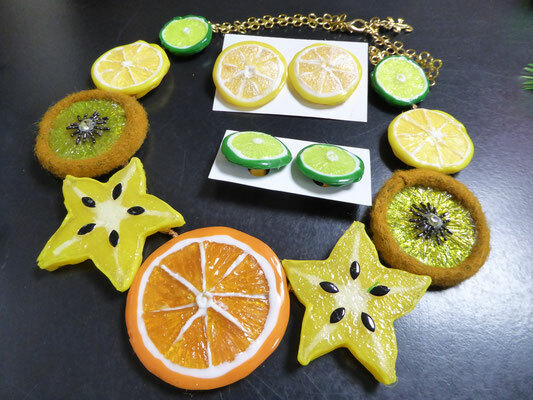 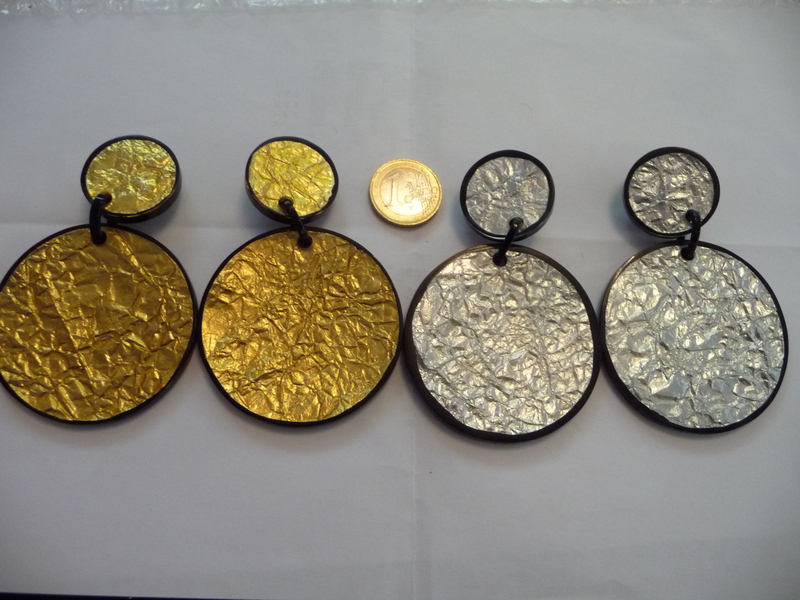 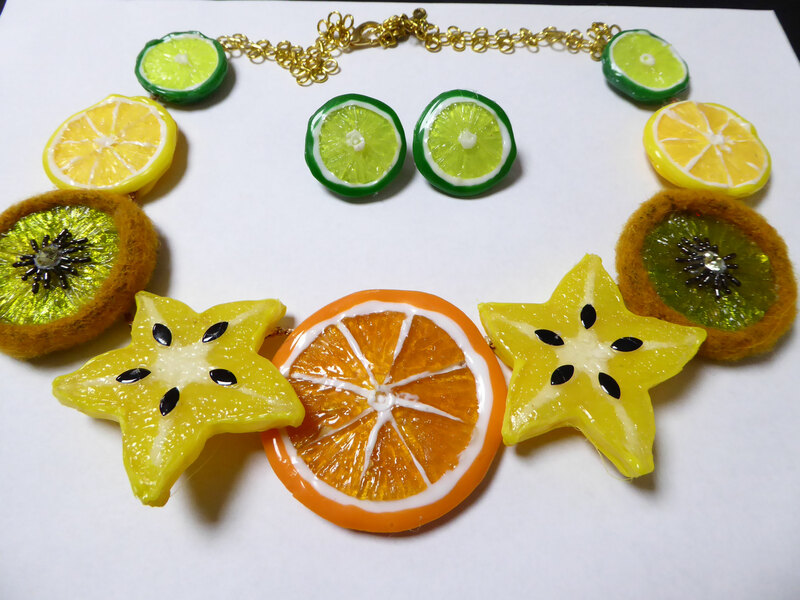 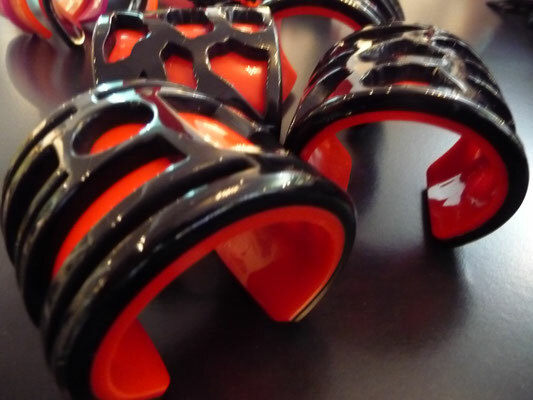 Lea has worked all her life to provide us with her beautiful jewelry; it is unethical to buy cheap molded copies. 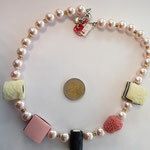 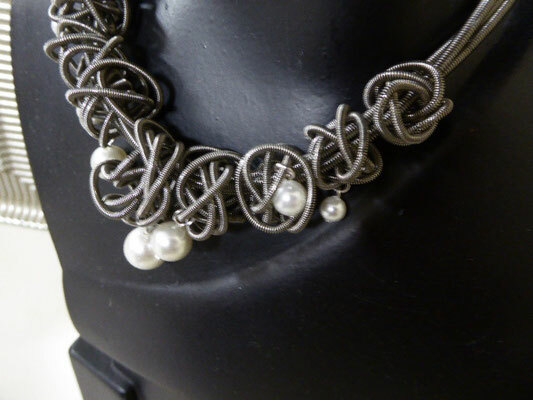 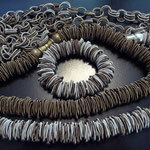 Her jewelry is all hand-made in a process that requires many steps. 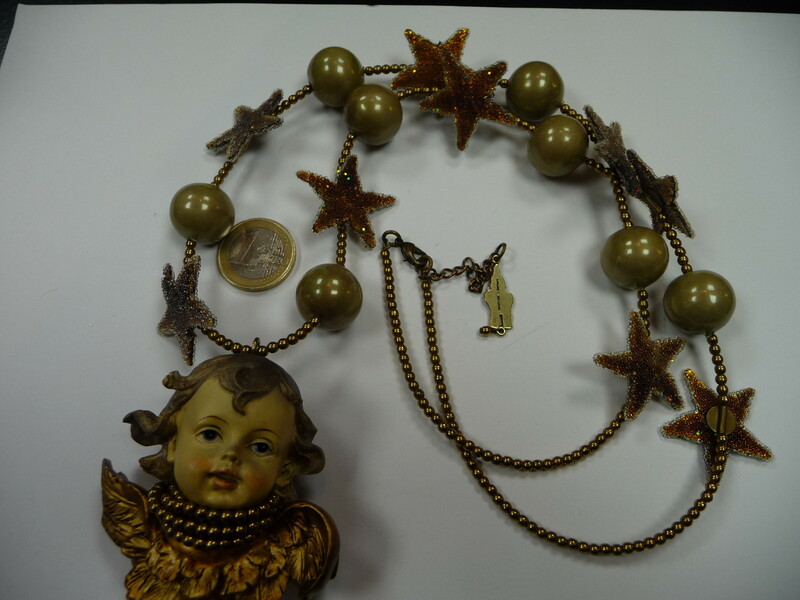 Some of the following are vintage items. 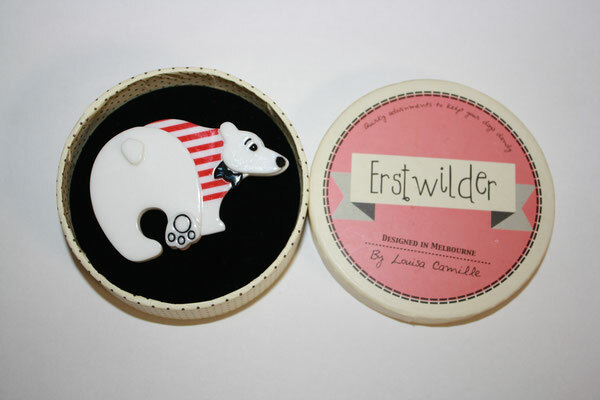 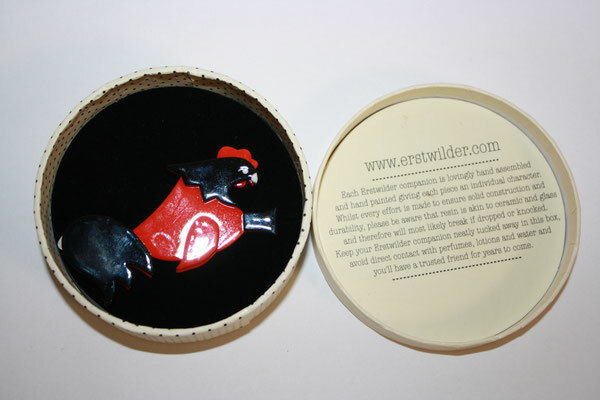 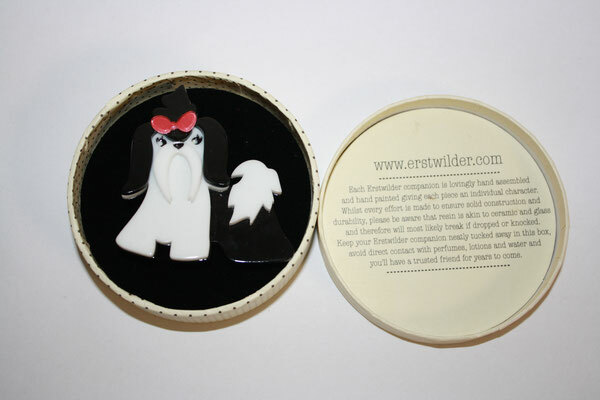 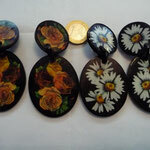 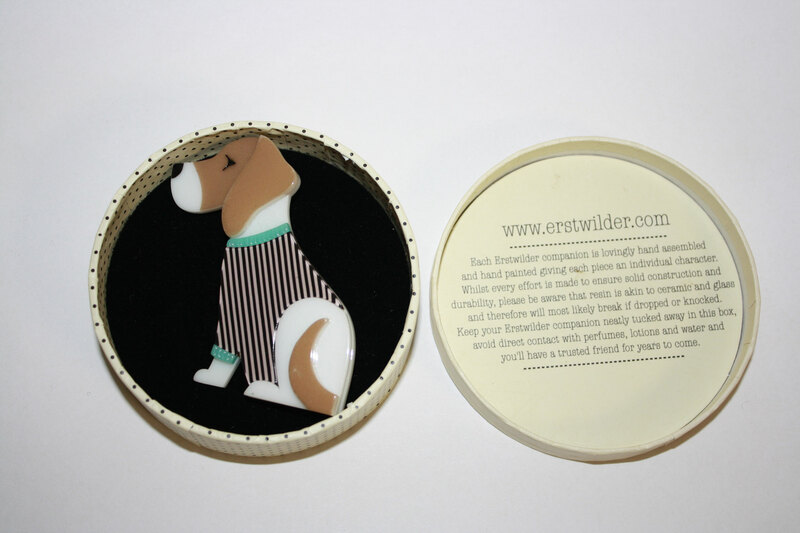 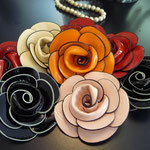 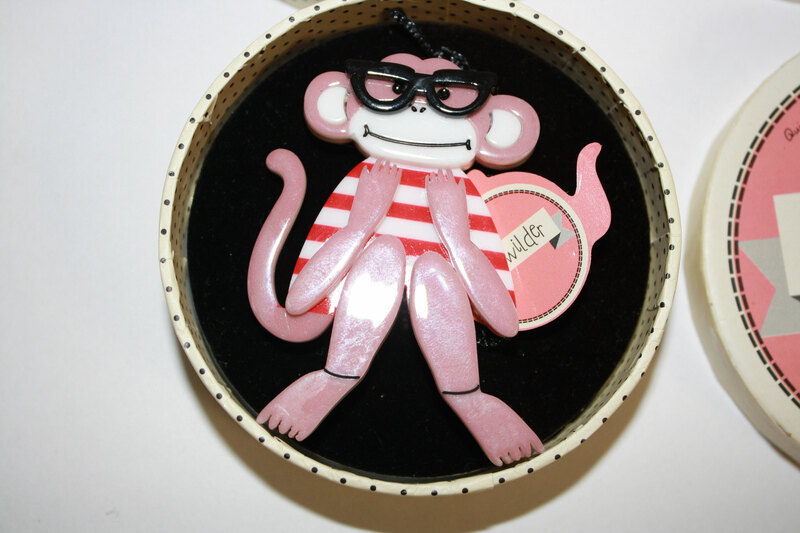 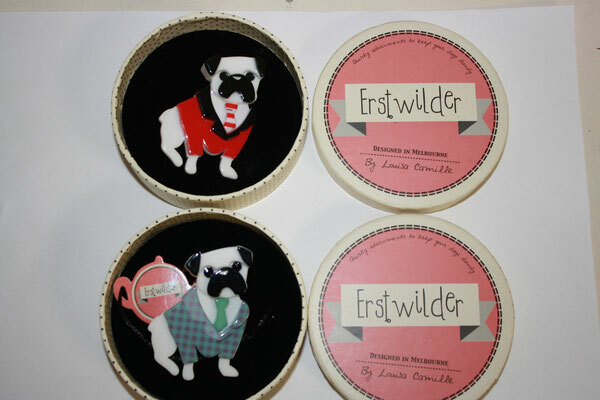 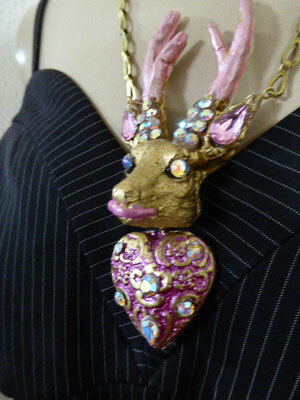 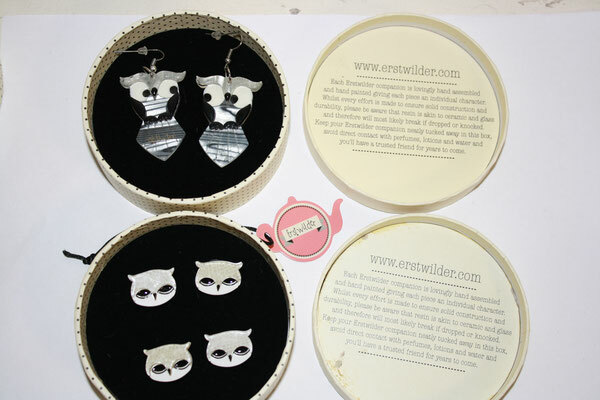 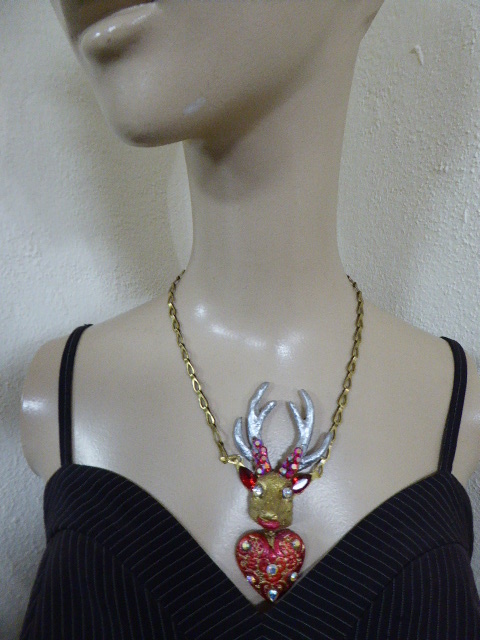 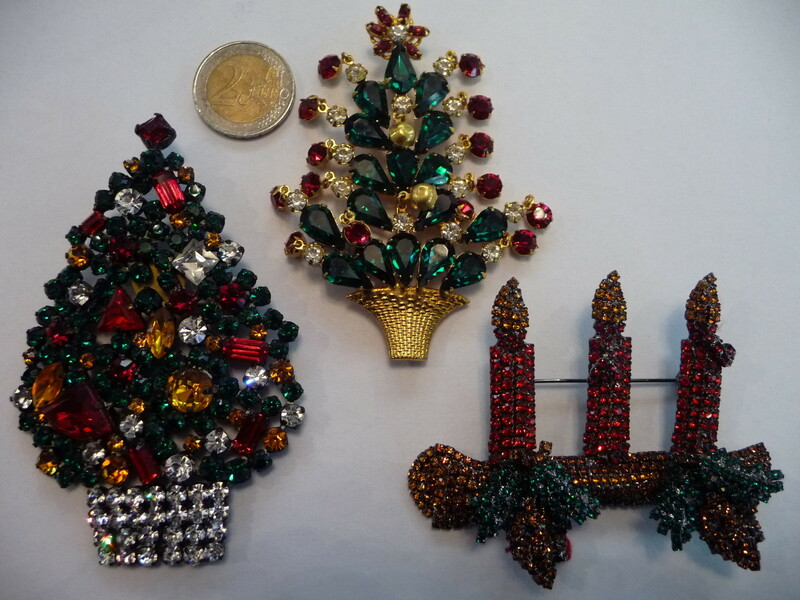 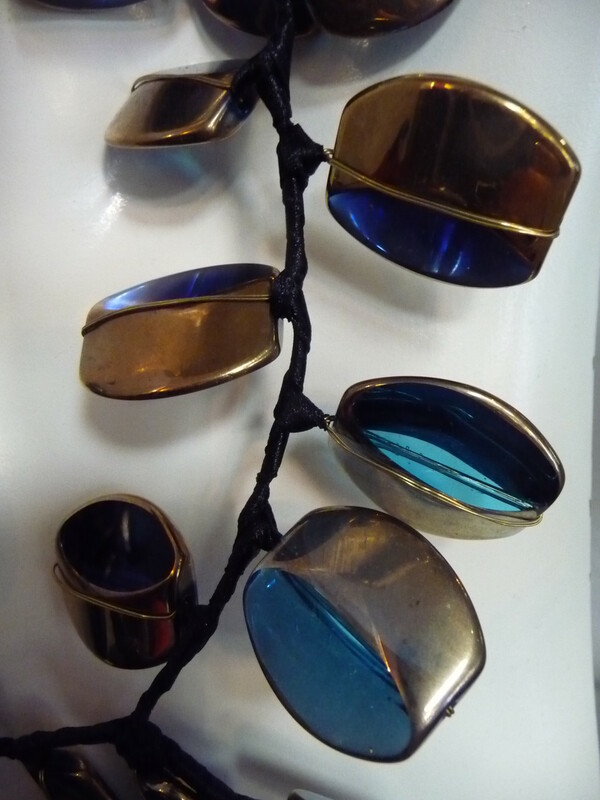 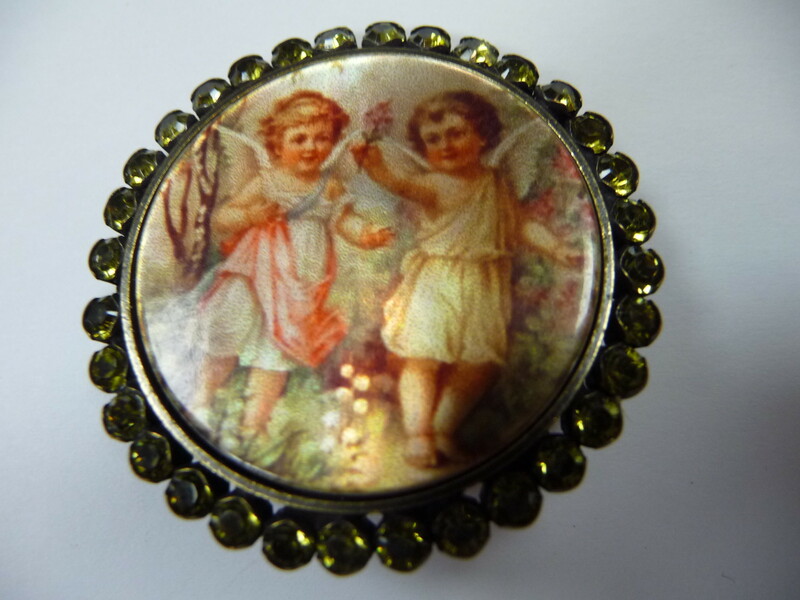 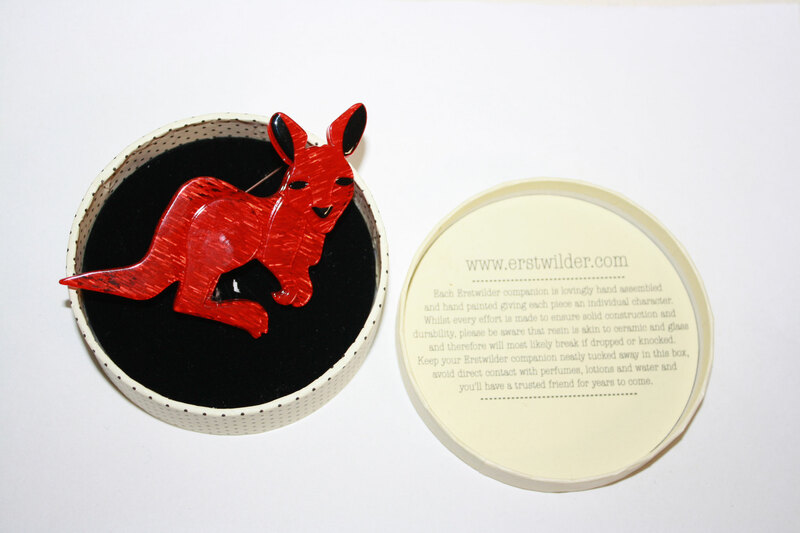 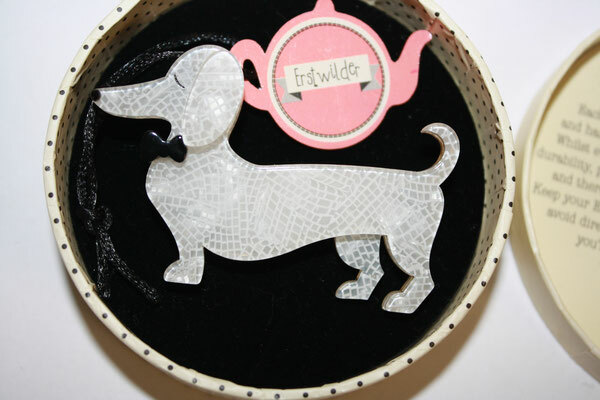 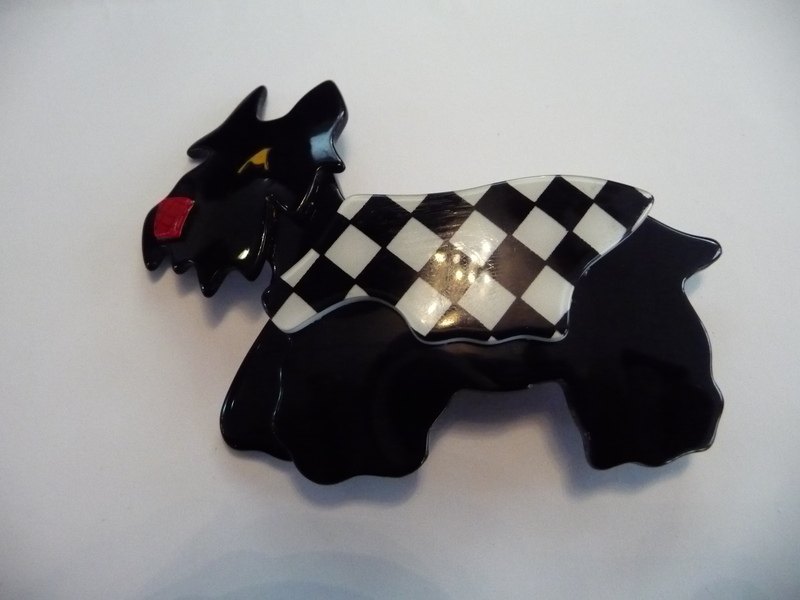 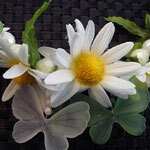 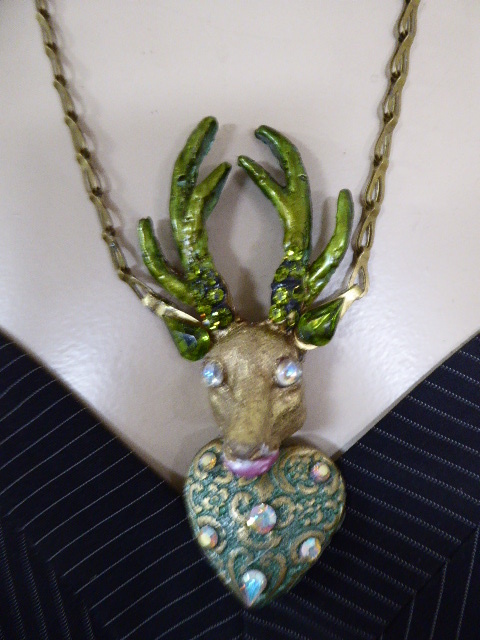 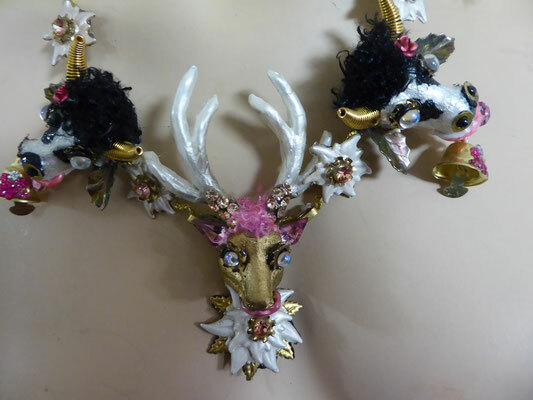 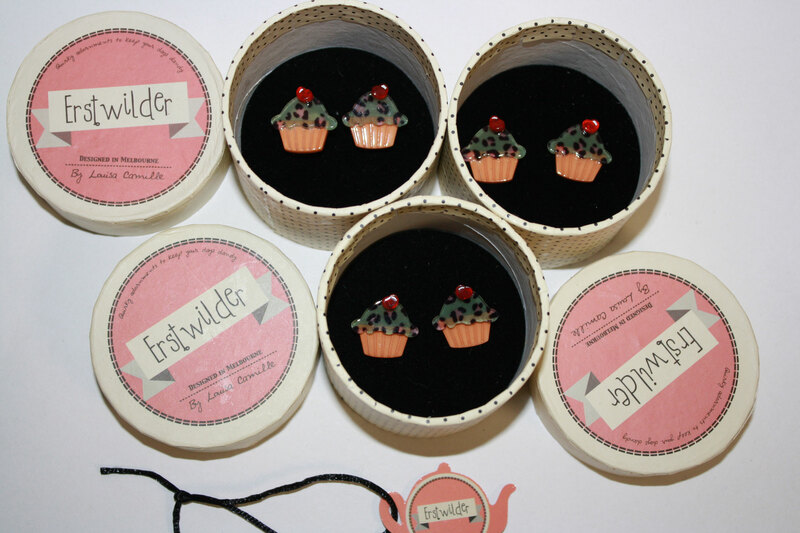 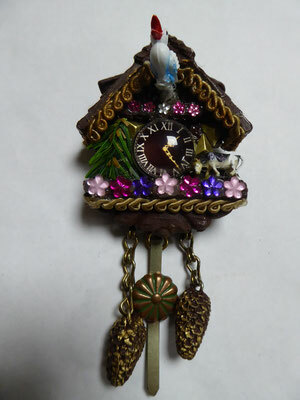 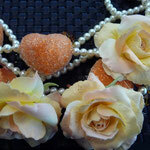 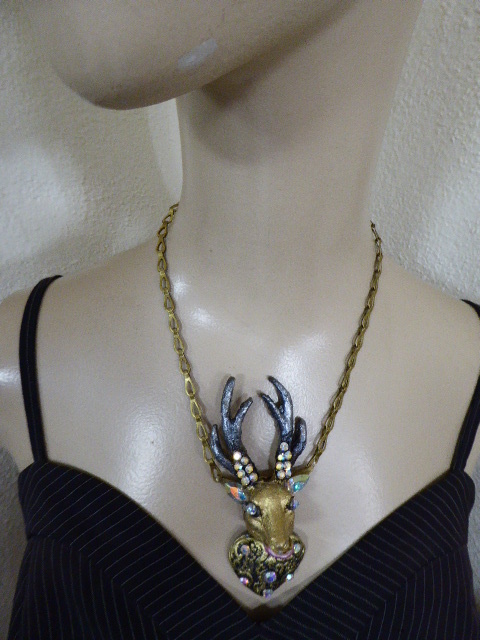 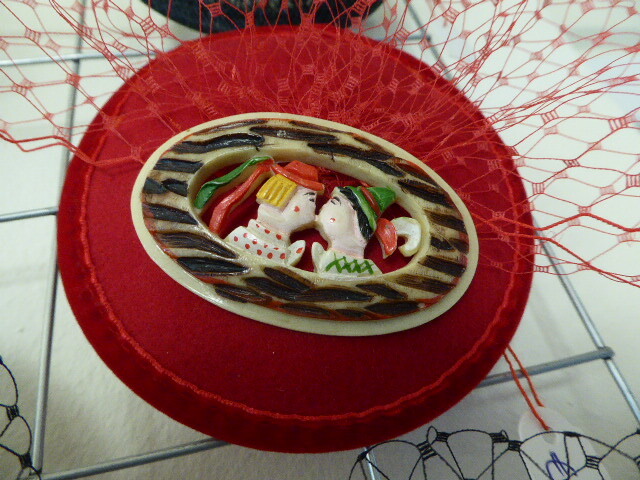 ERSTWILDER BROOCHES - "VINTAGE" - early brooches, no longer available......All unworn, absolutely new old stock. 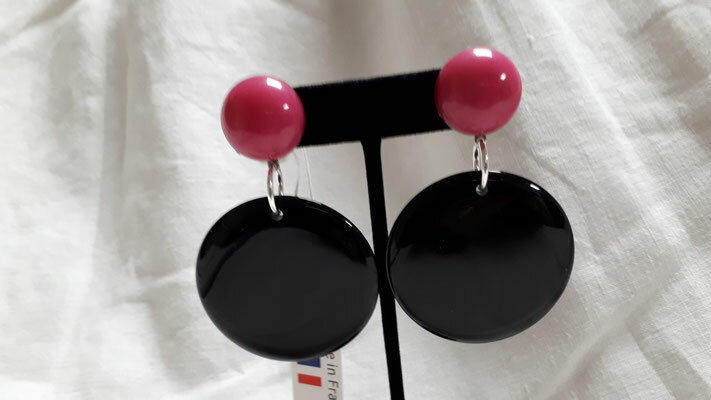 Neue Kollektion aus Paris. 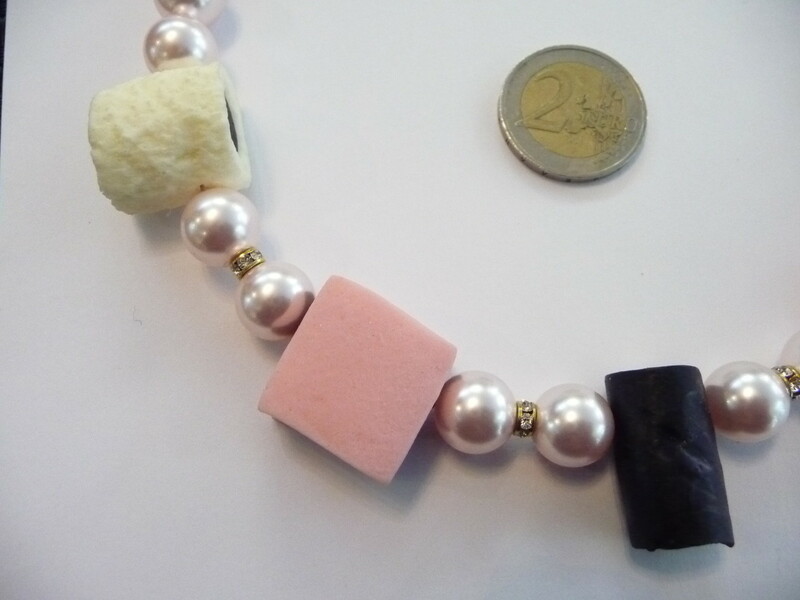 Schmuck aus Klavierdraht, Stahlfilament. 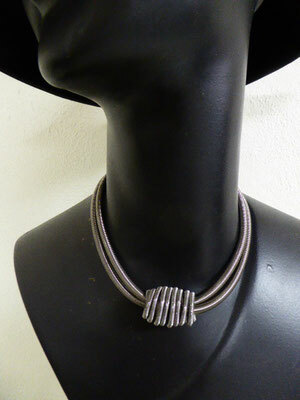 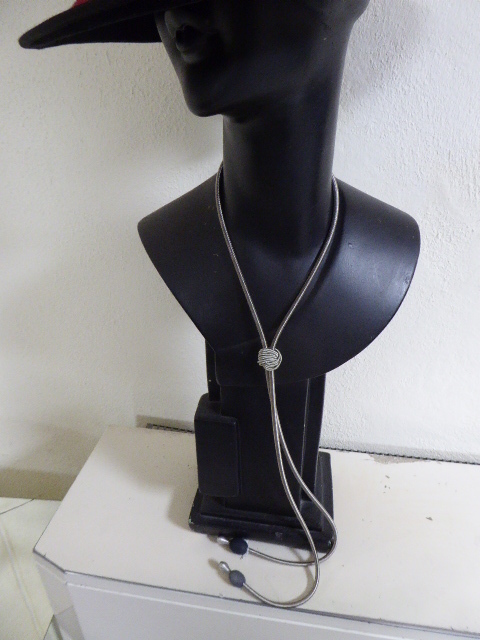 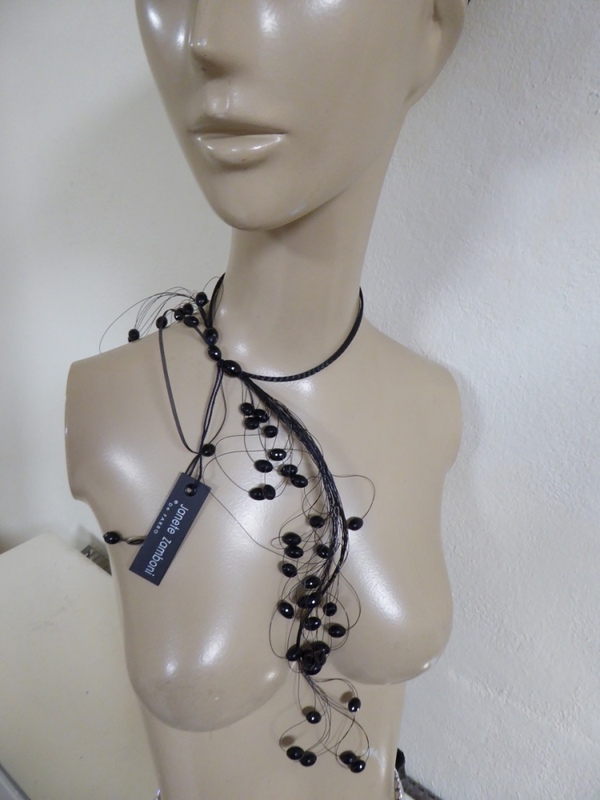 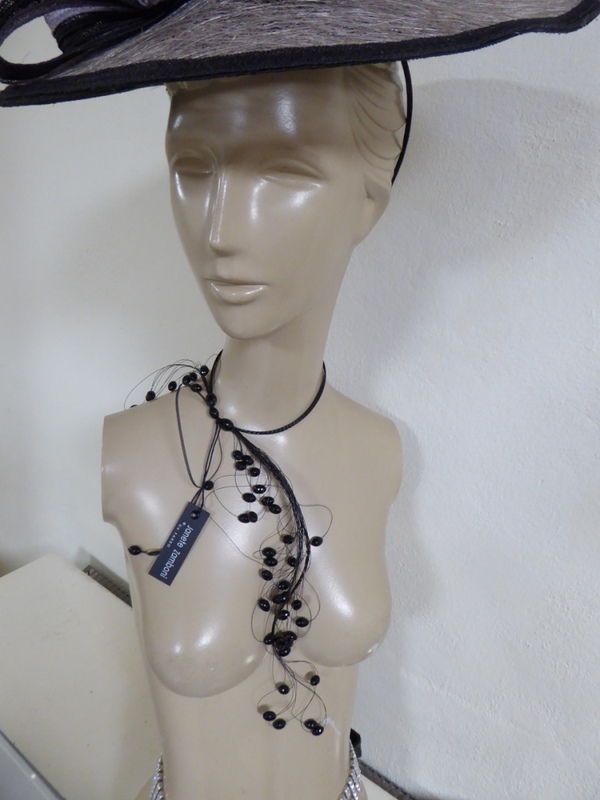 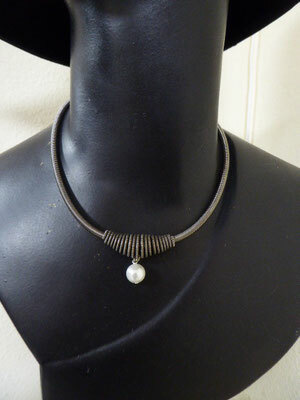 Latest collection from Paris - piano wire.....The necklaces have a 3 inch extender chain. 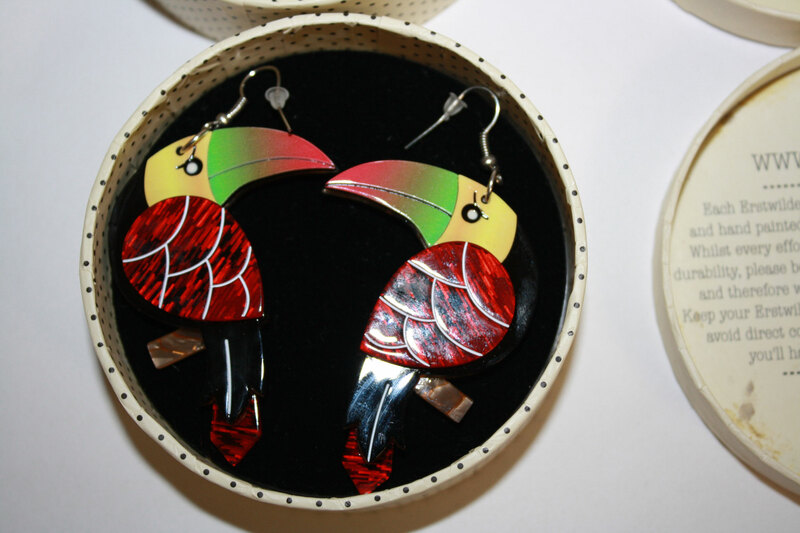 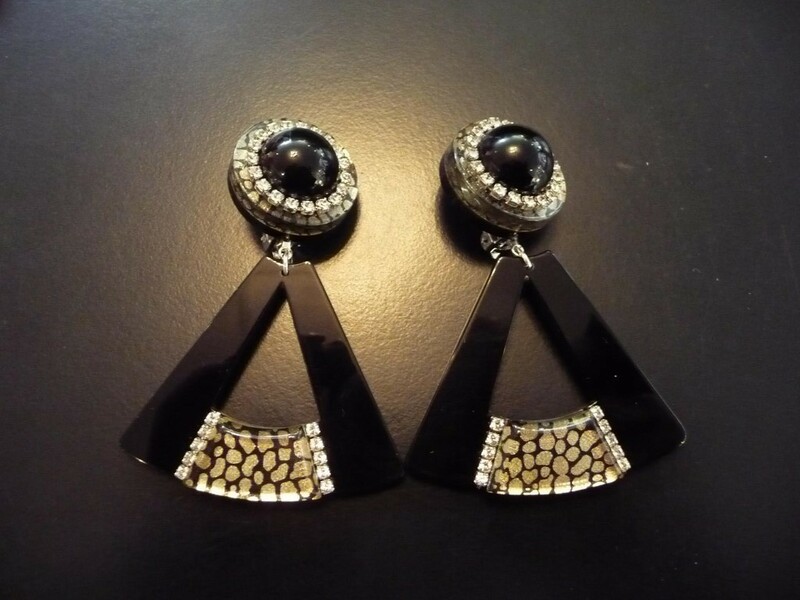 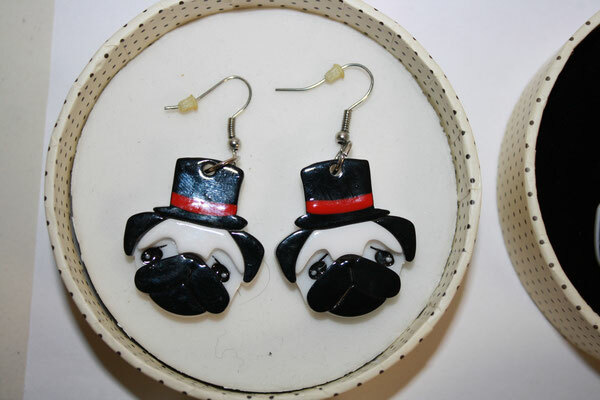 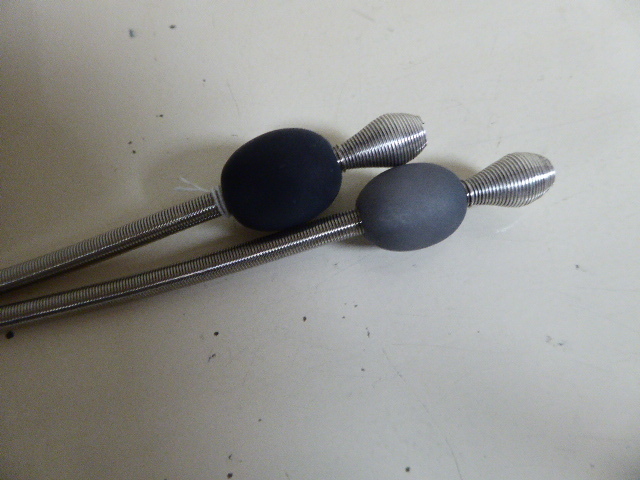 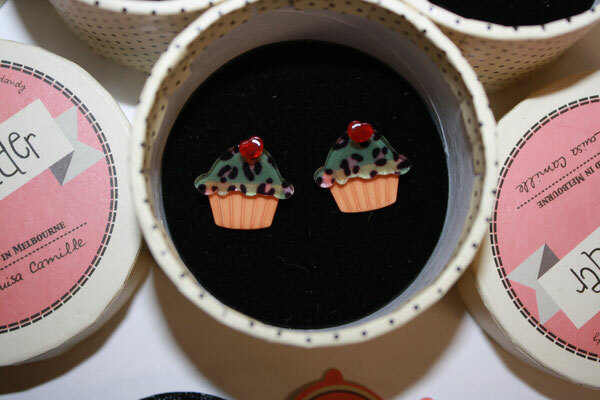 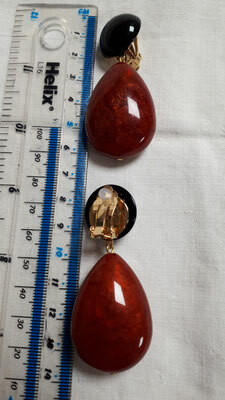 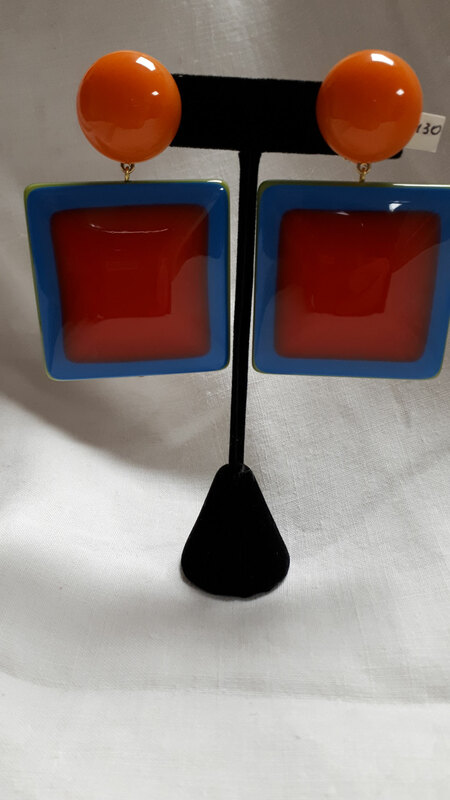 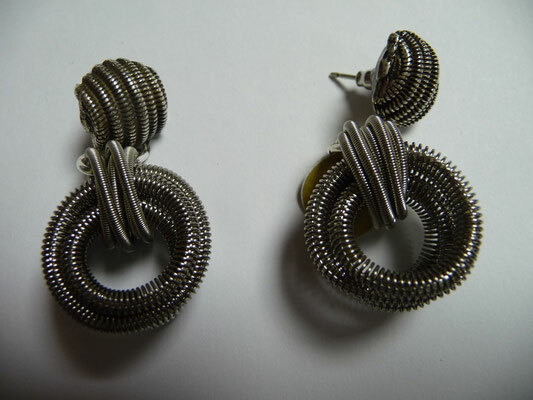 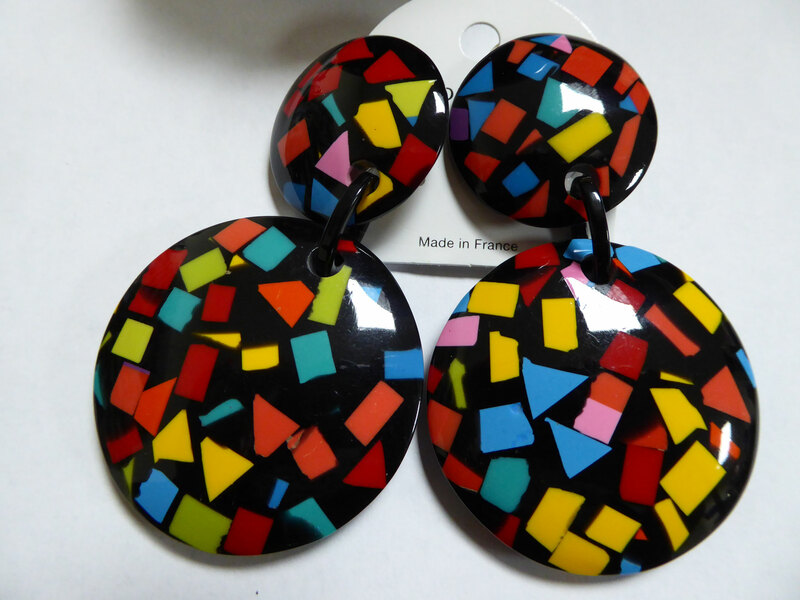 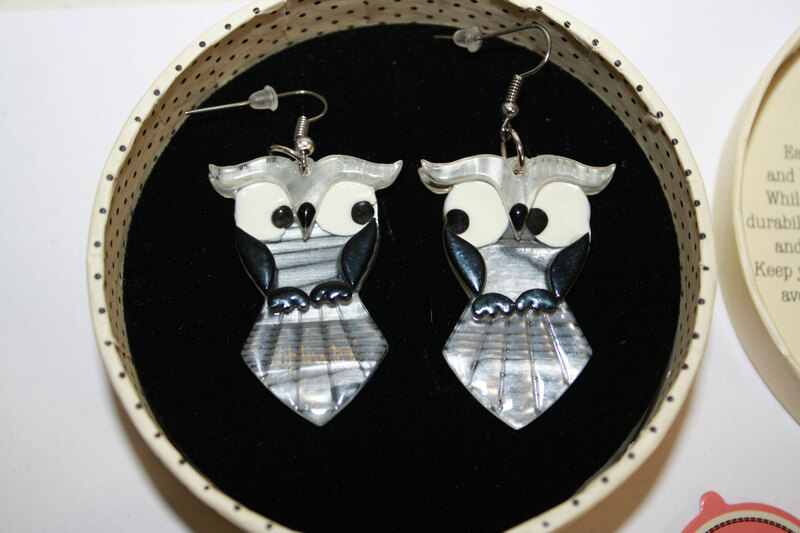 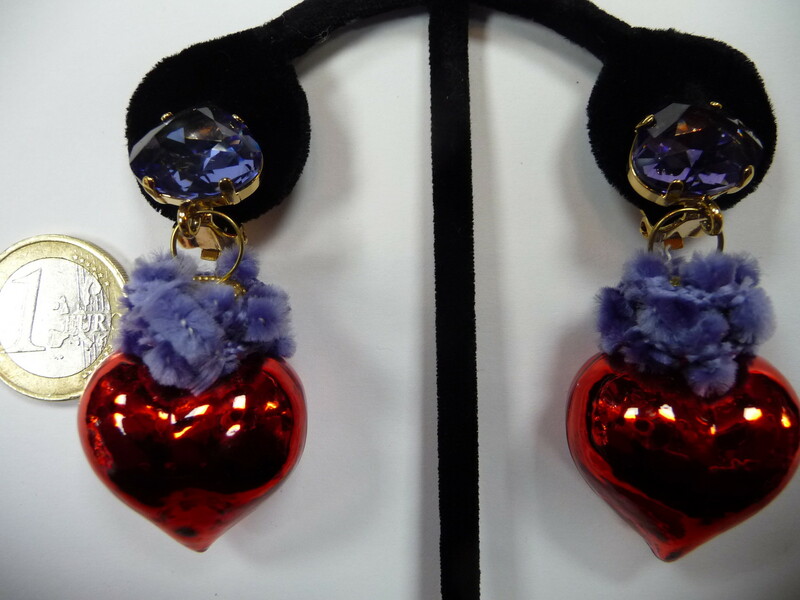 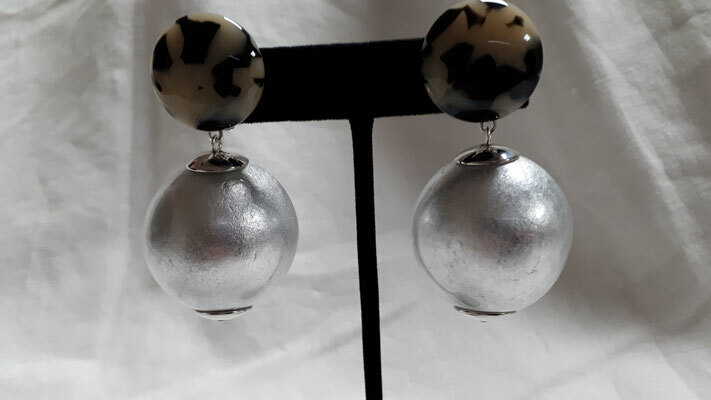 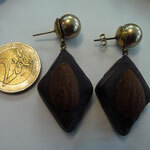 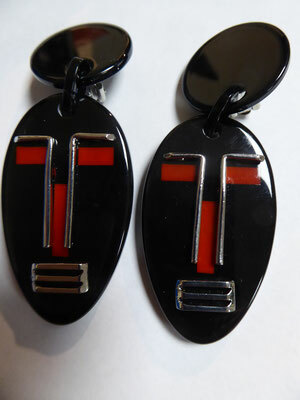 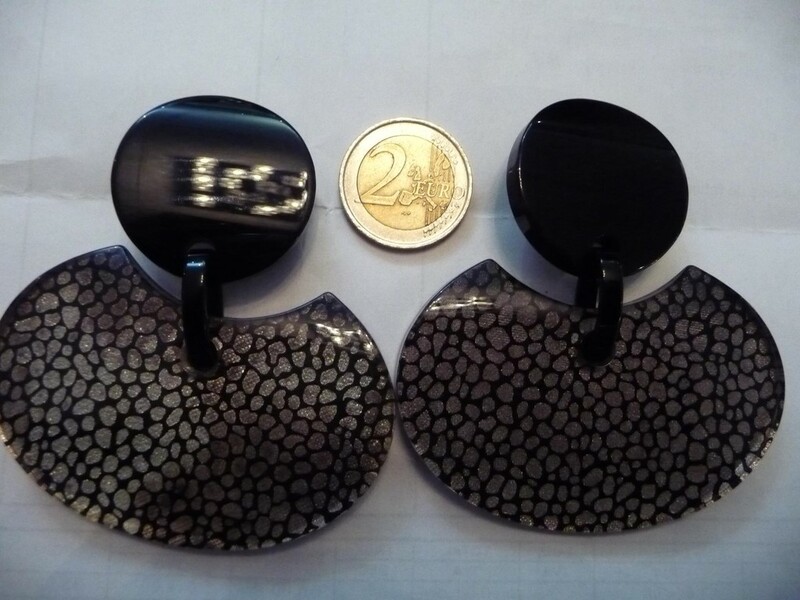 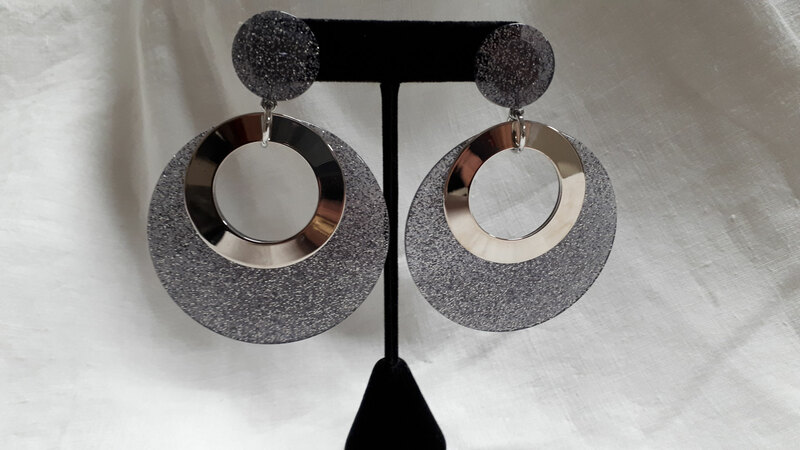 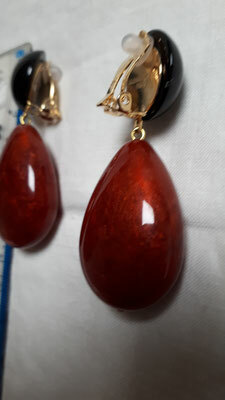 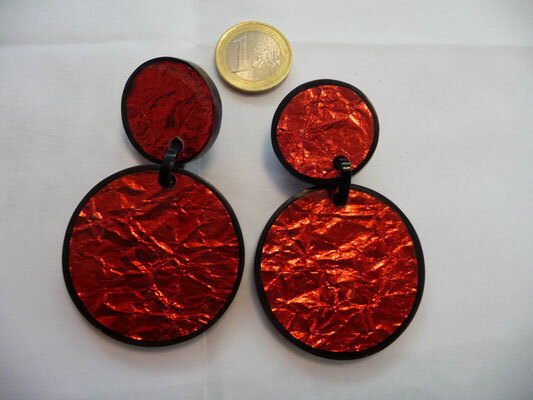 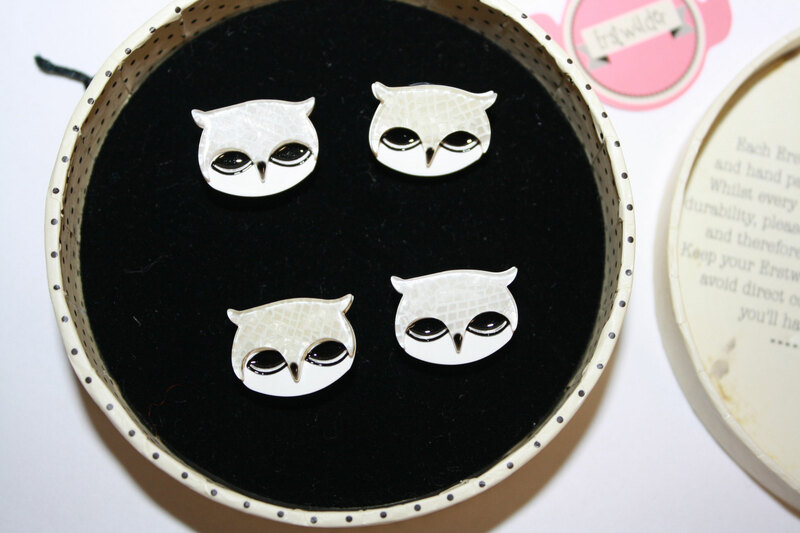 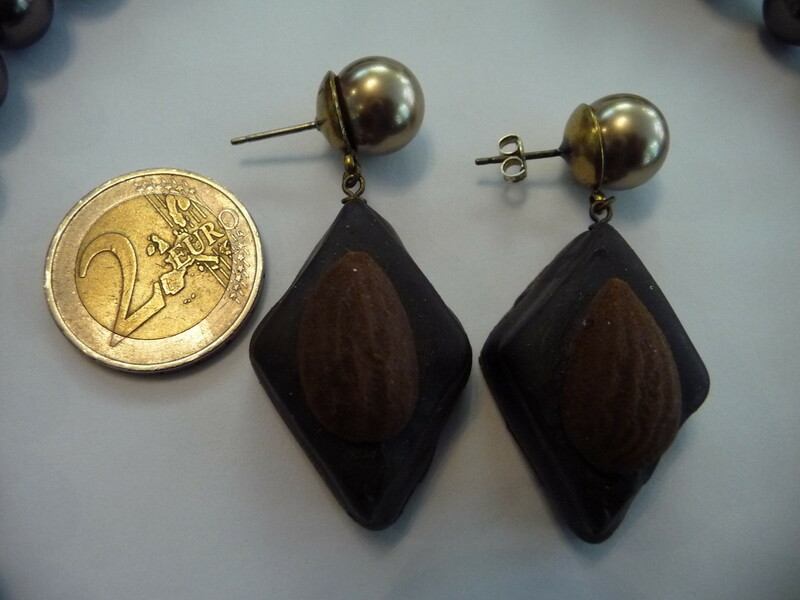 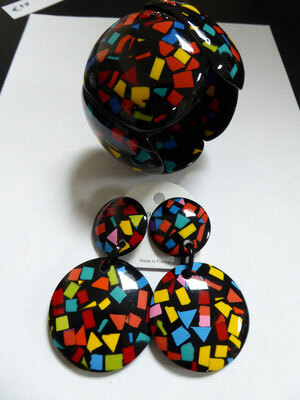 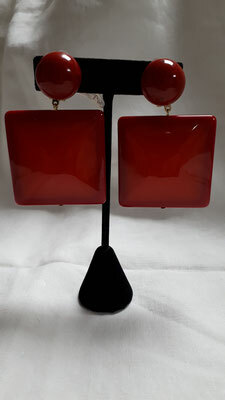 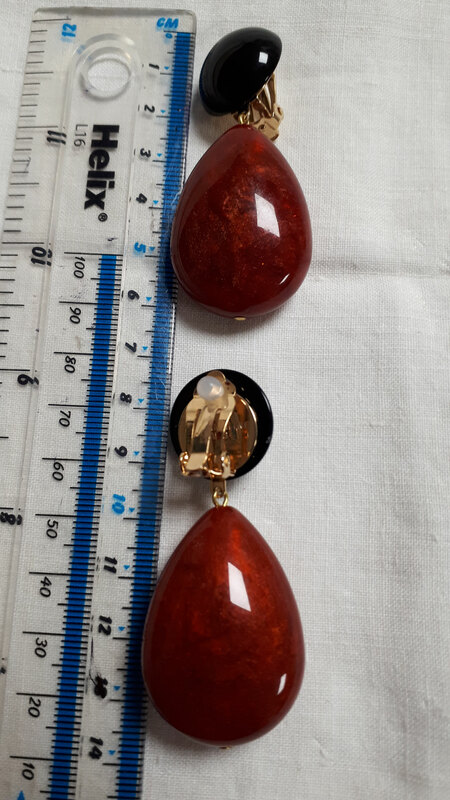 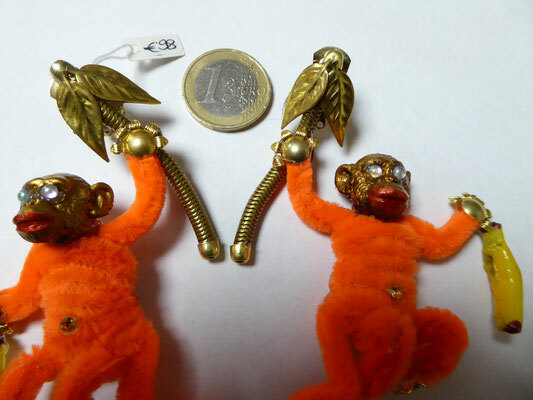 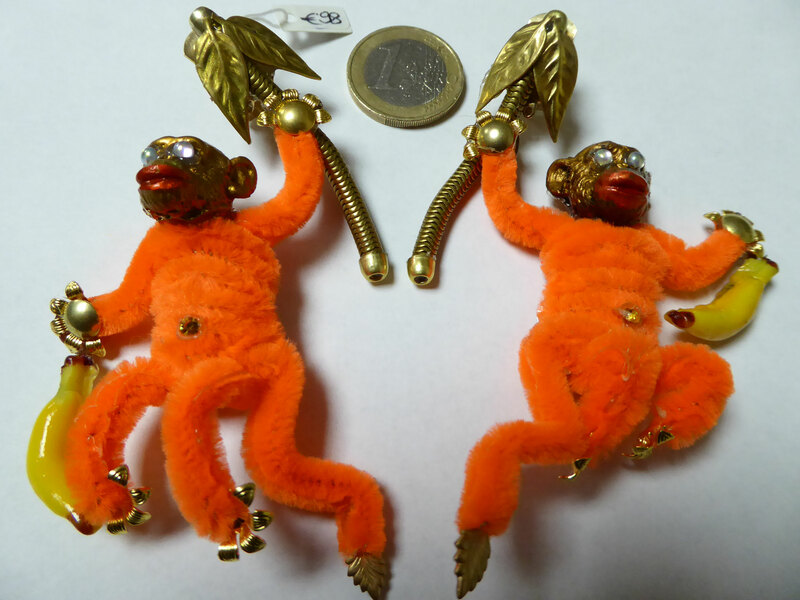 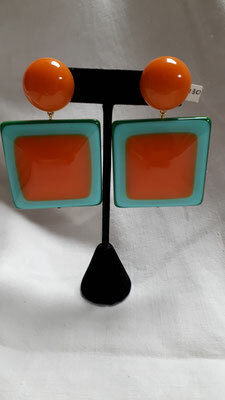 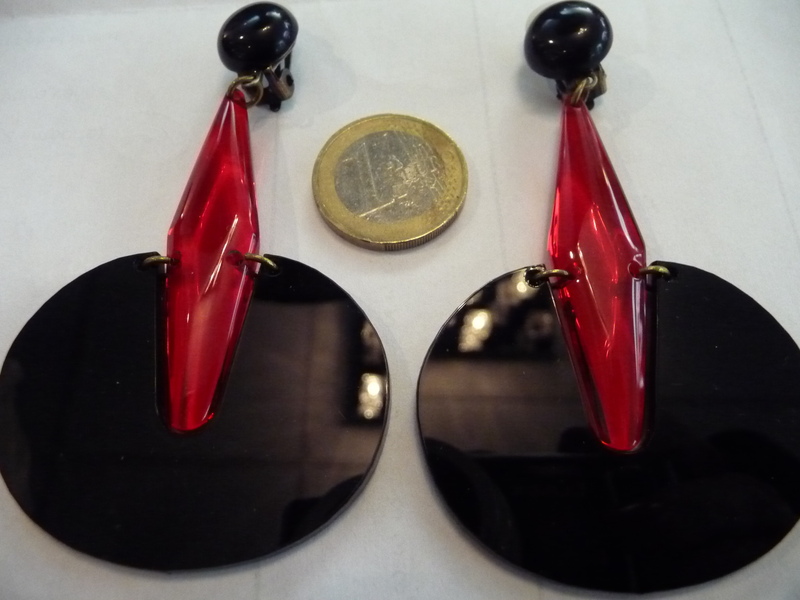 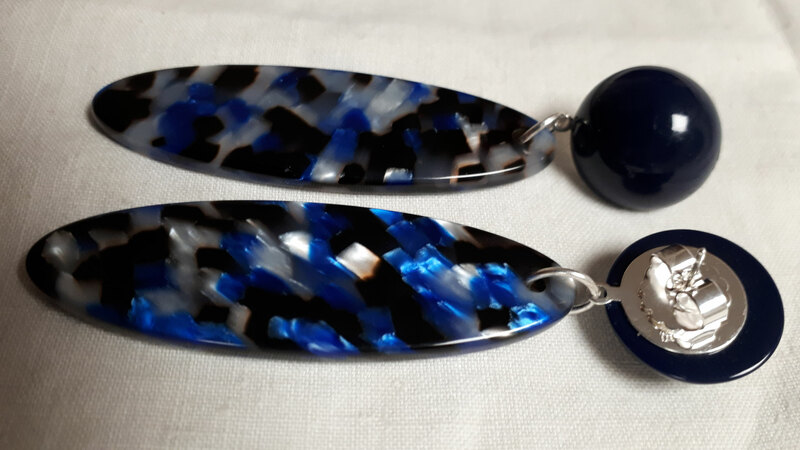 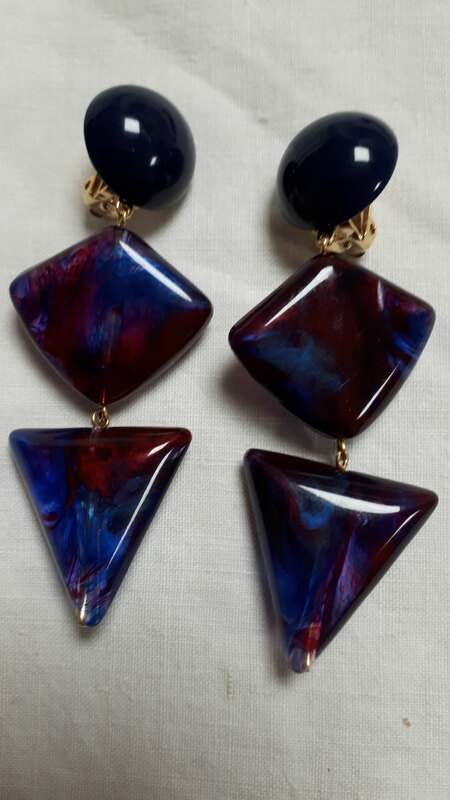 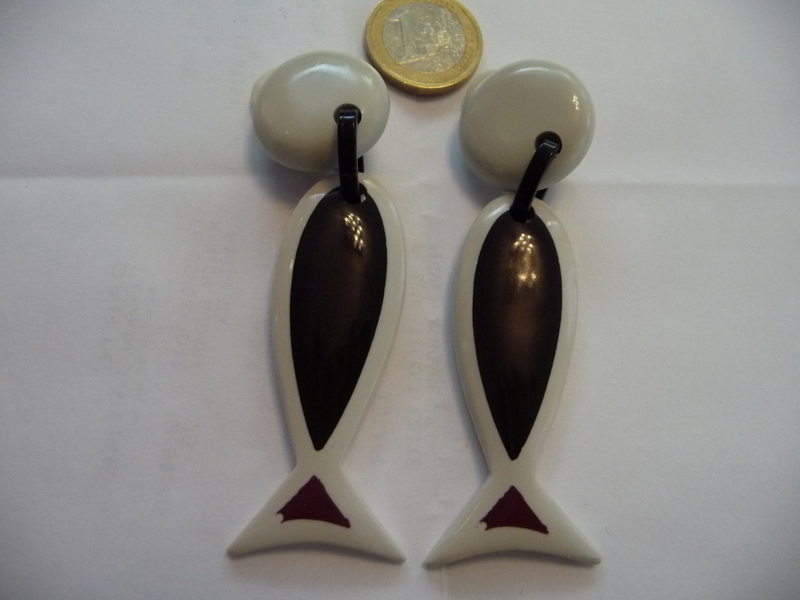 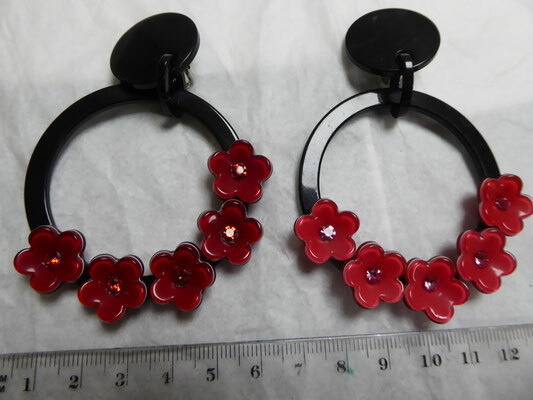 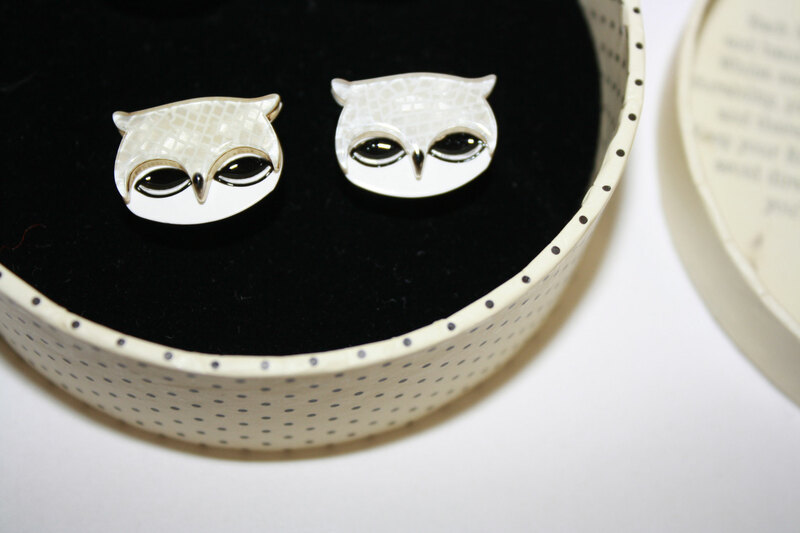 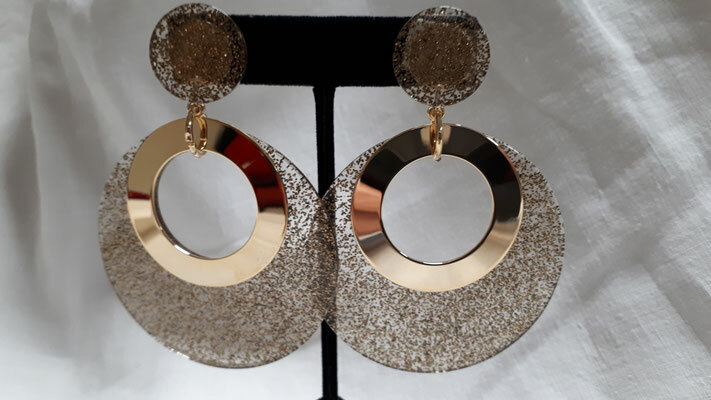 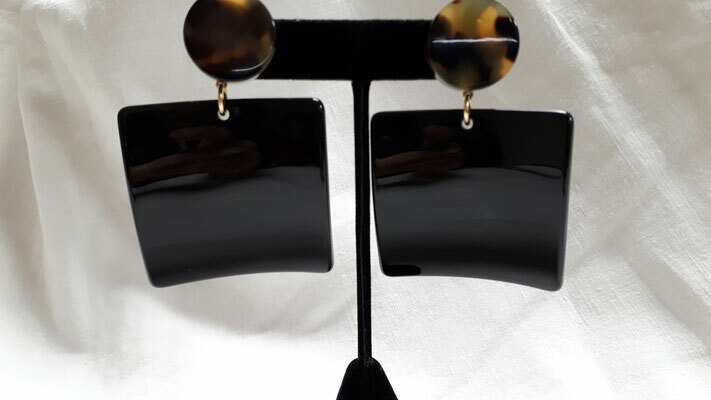 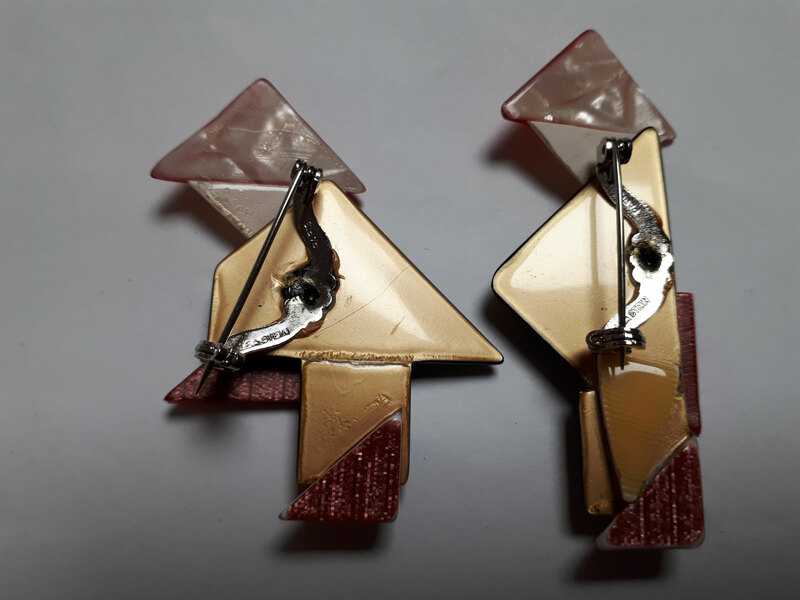 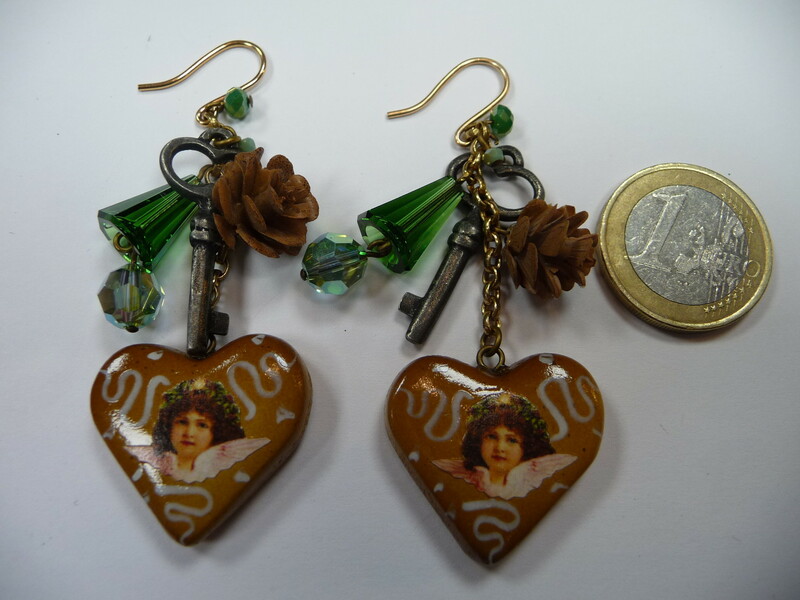 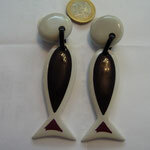 NEW in from Paris - Marion Godart clampers and earrings. 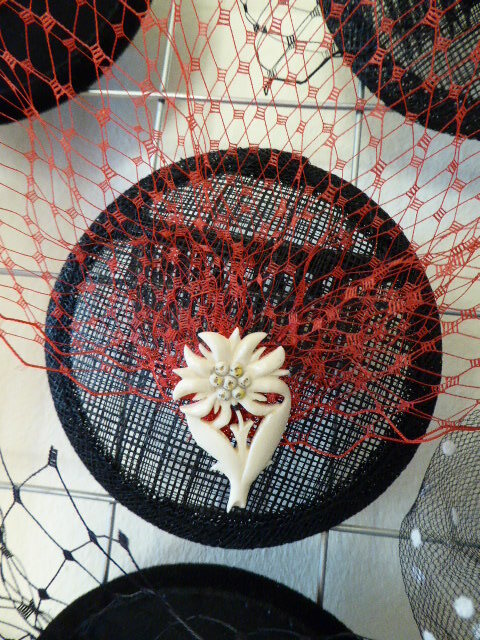 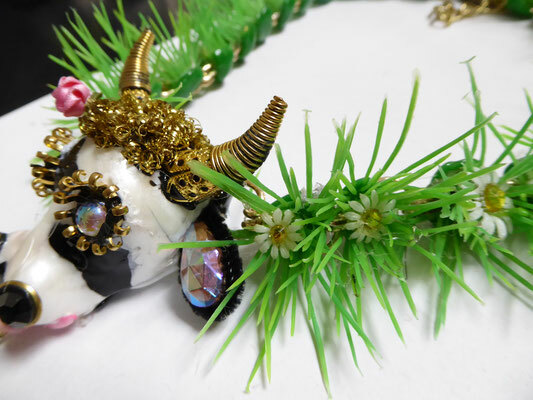 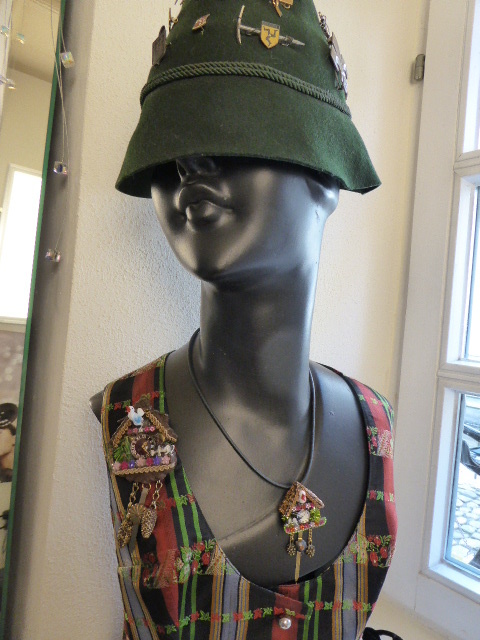 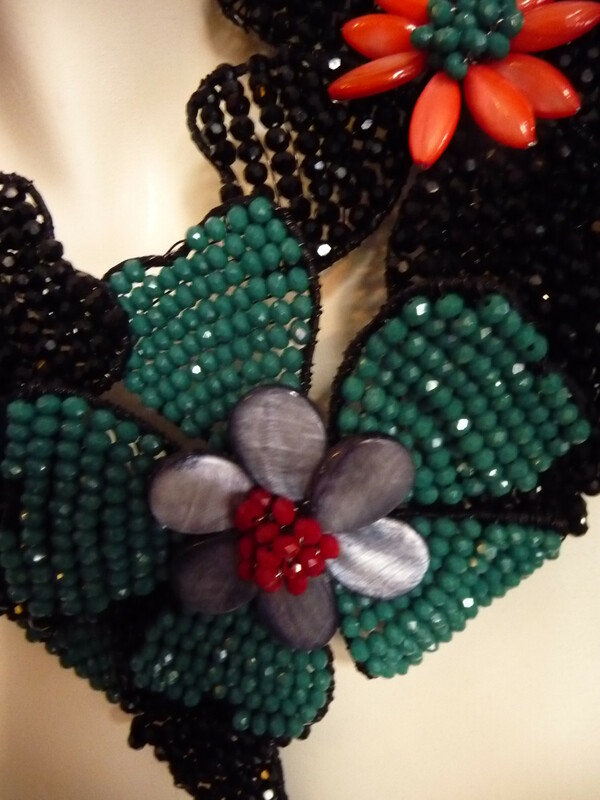 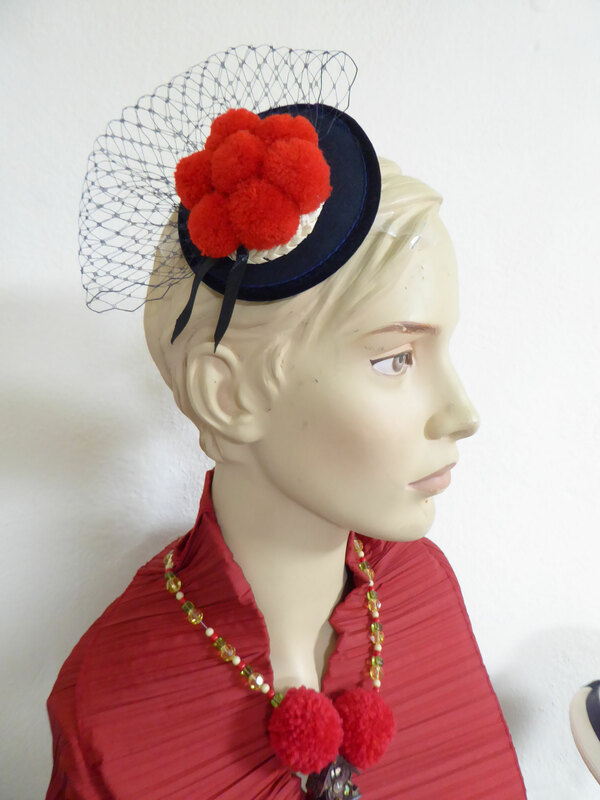 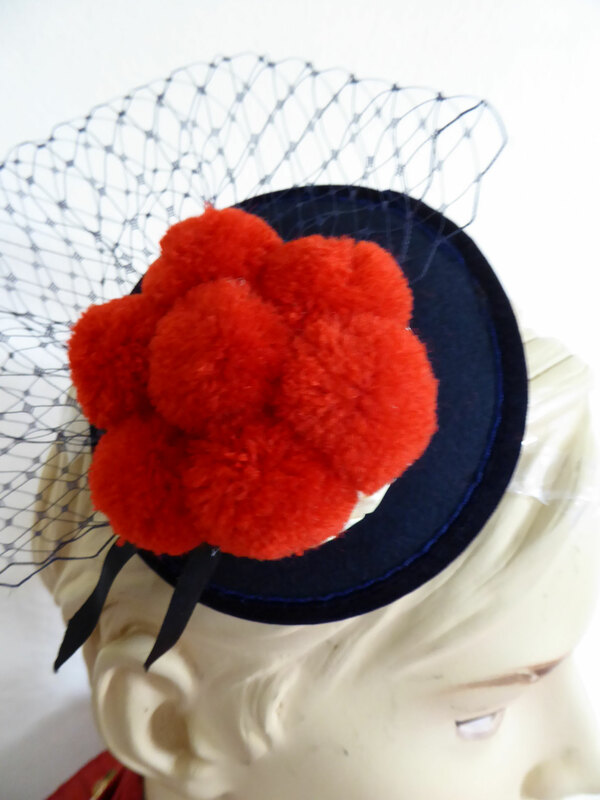 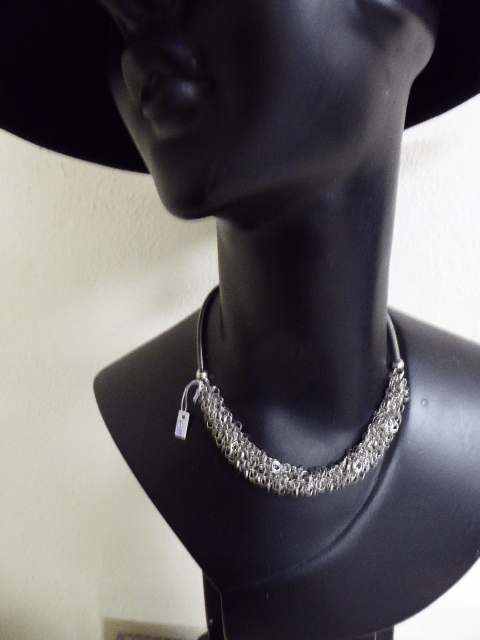 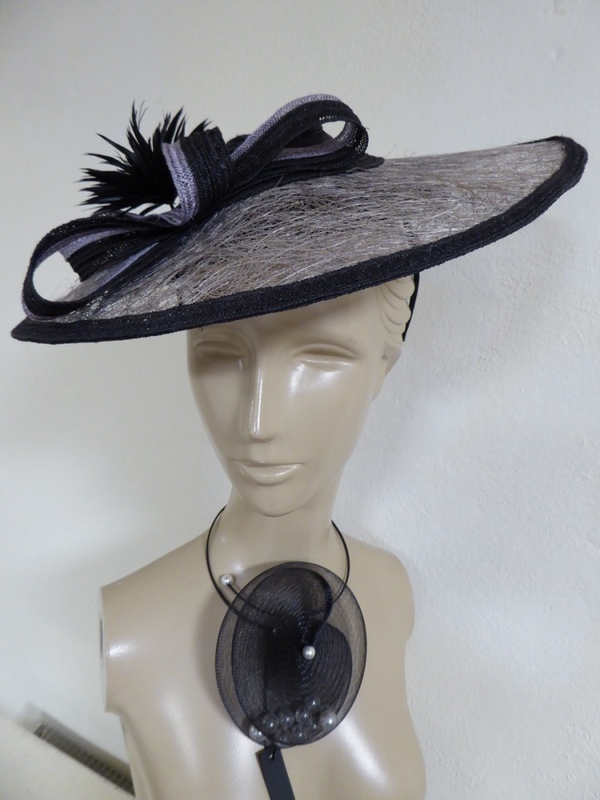 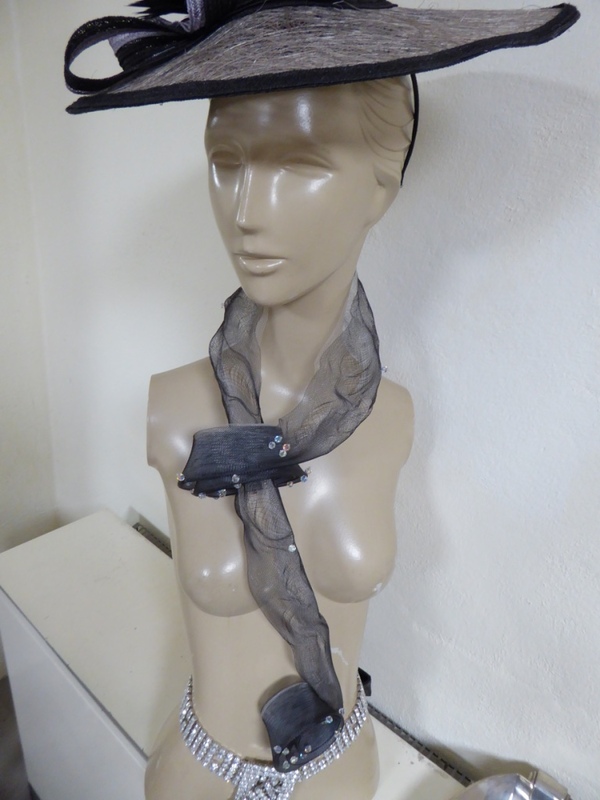 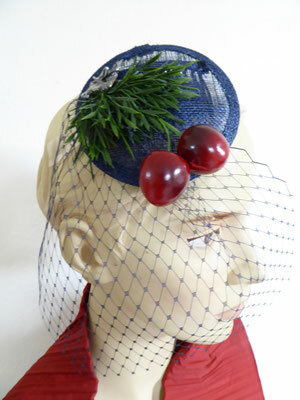 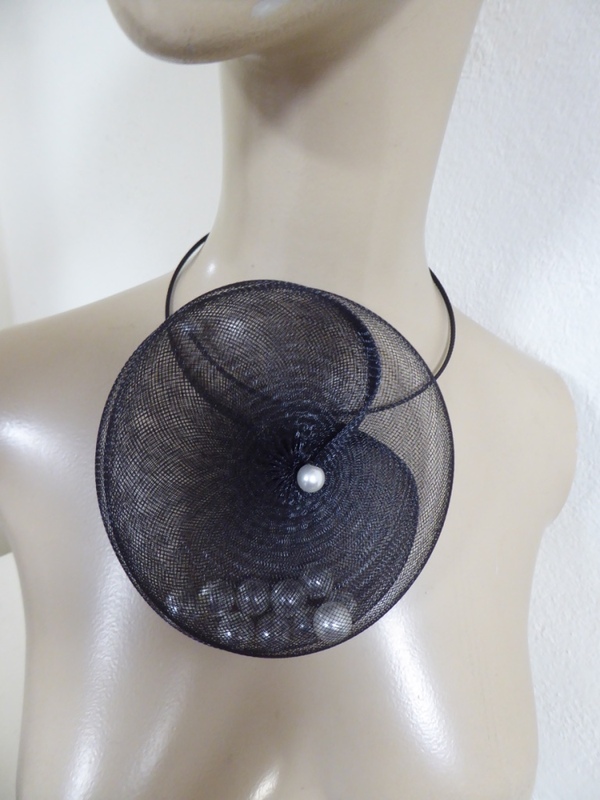 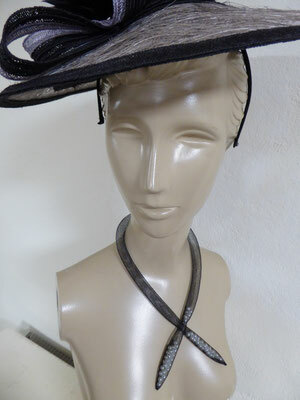 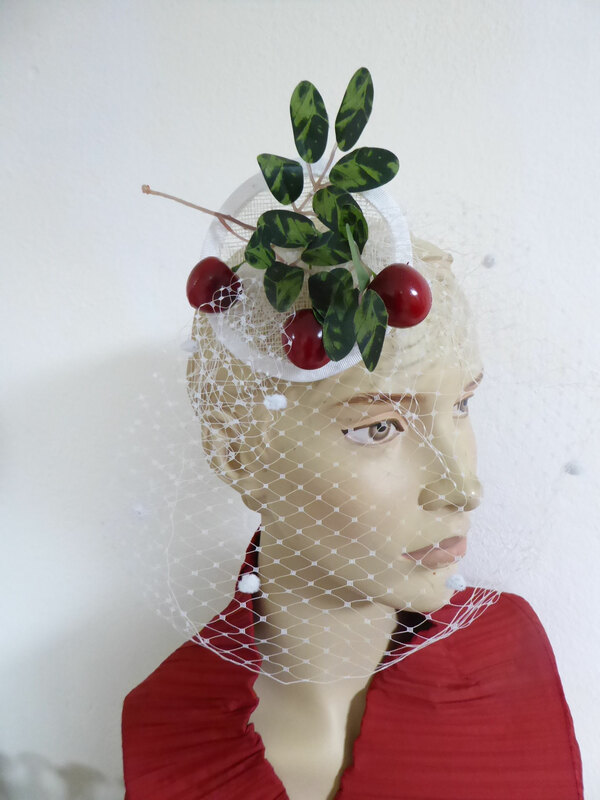 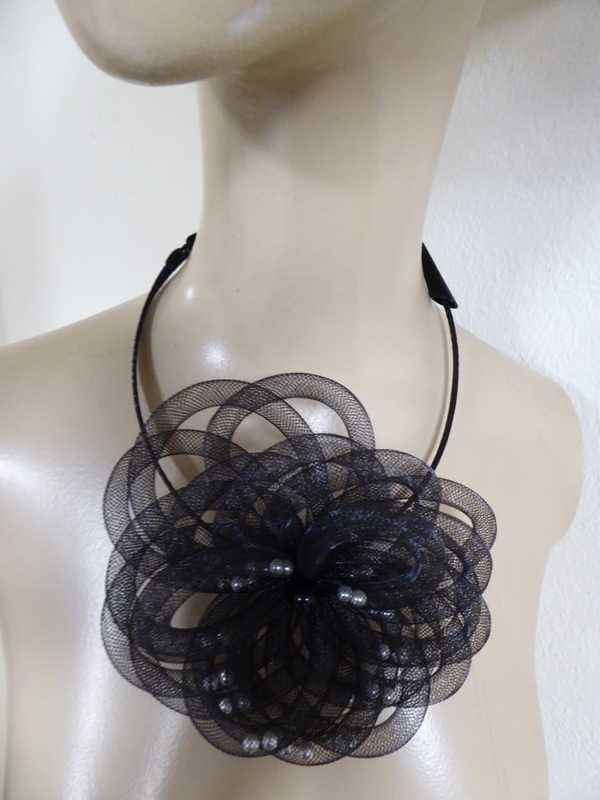 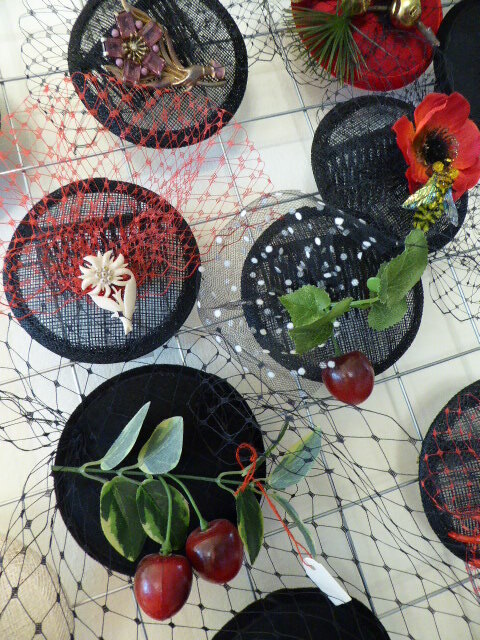 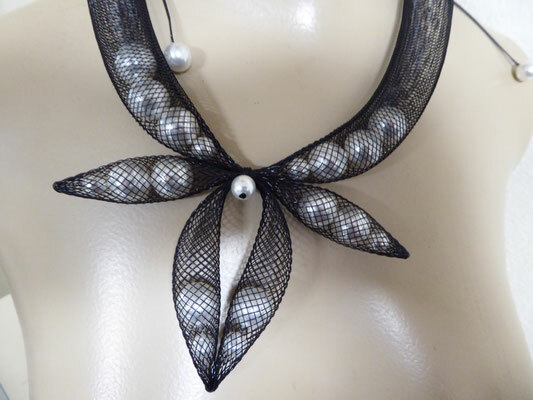 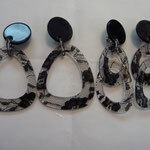 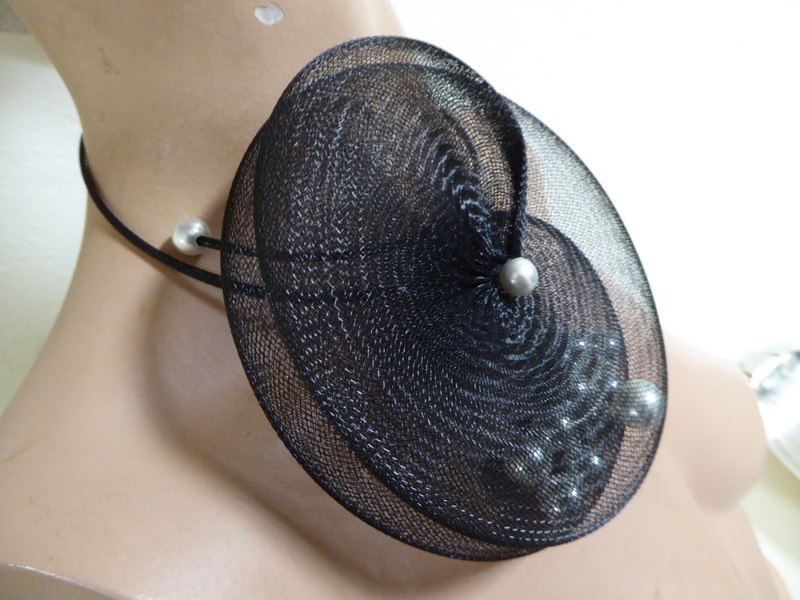 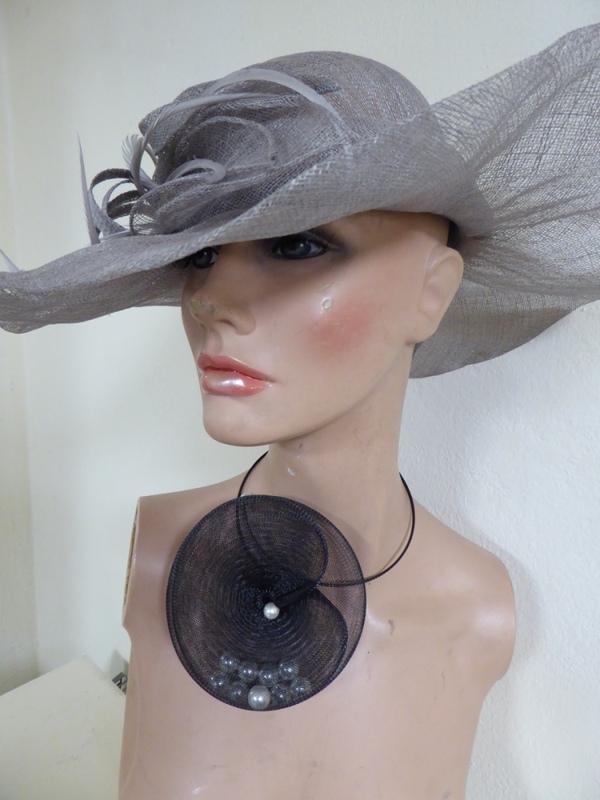 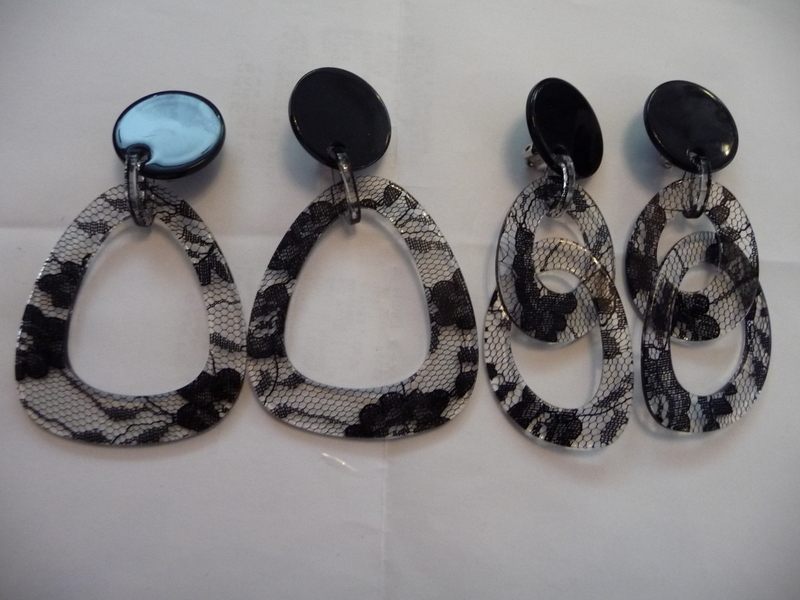 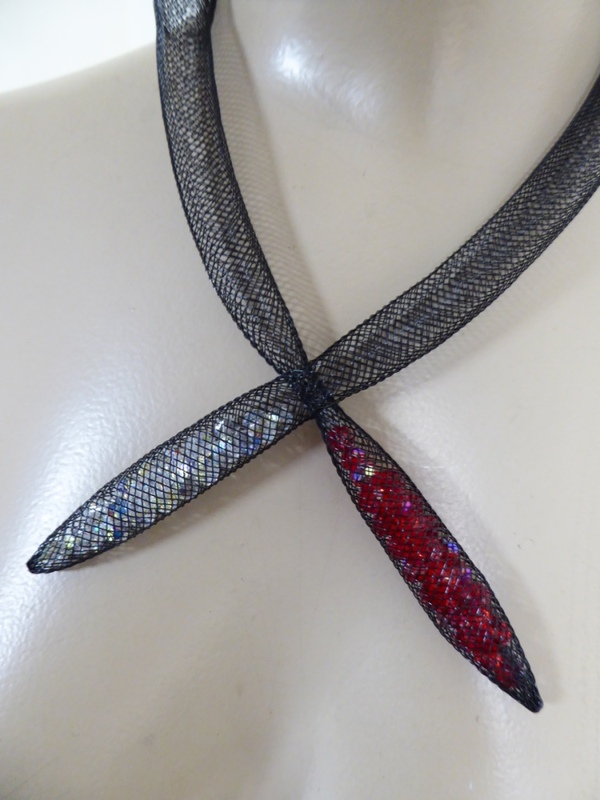 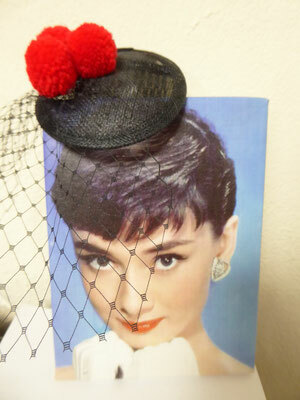 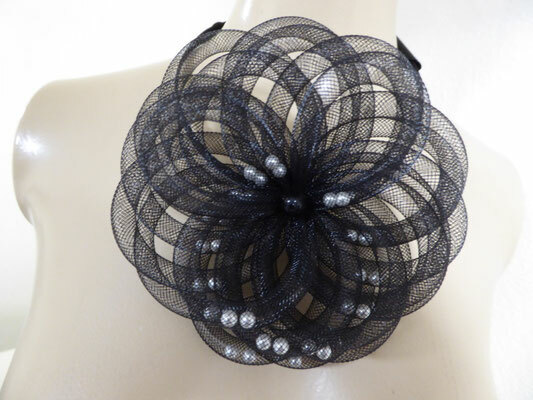 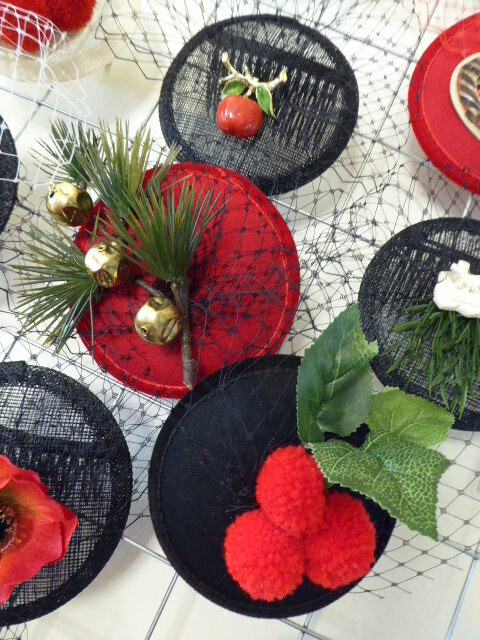 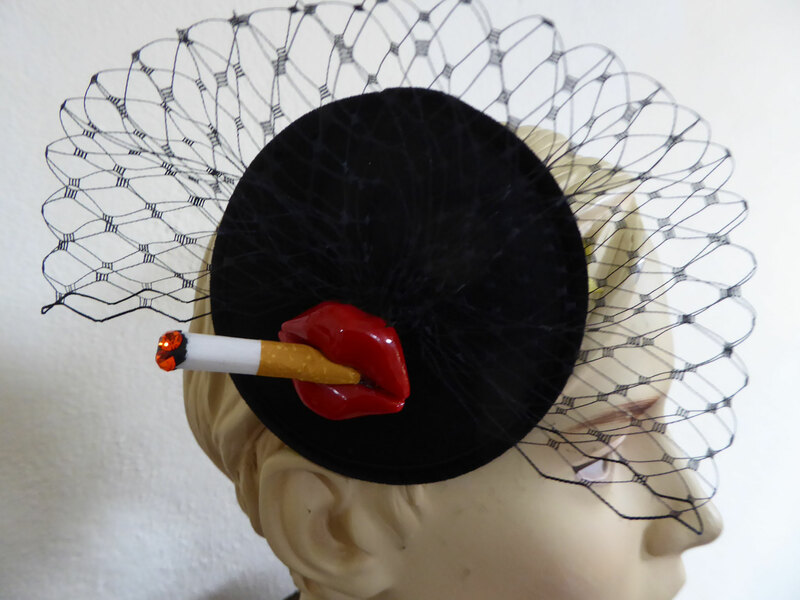 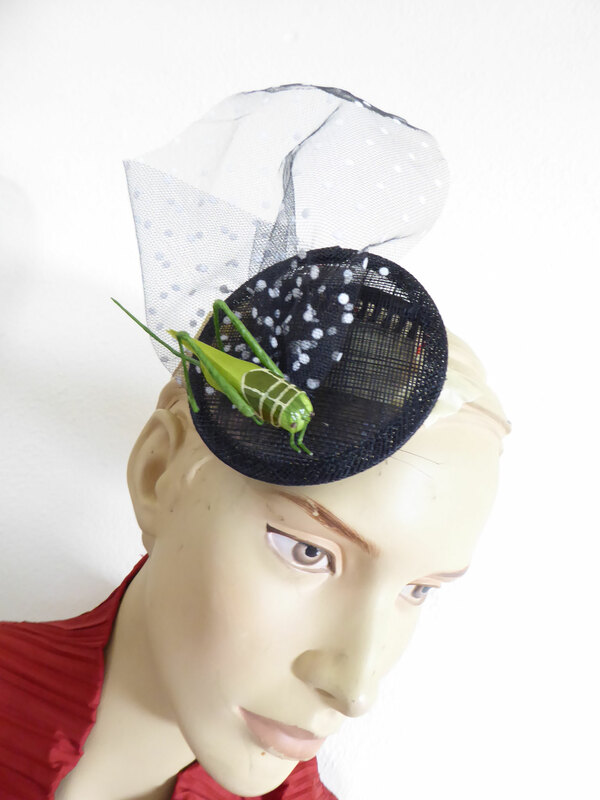 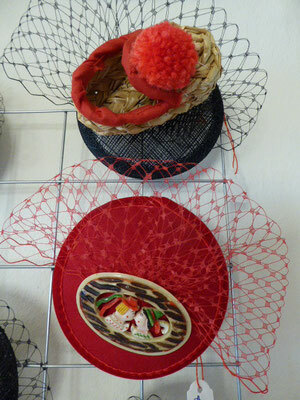 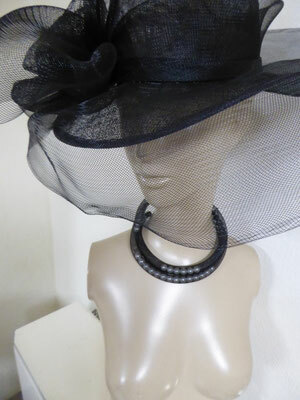 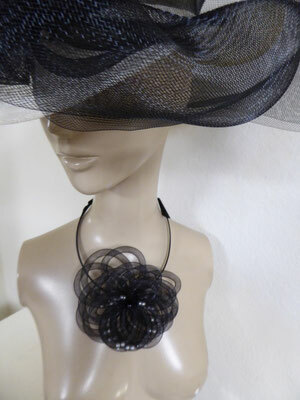 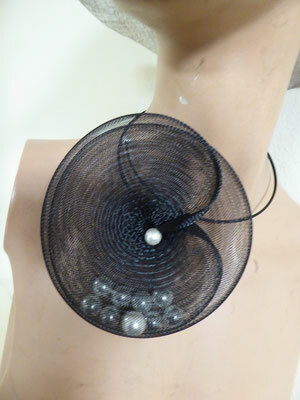 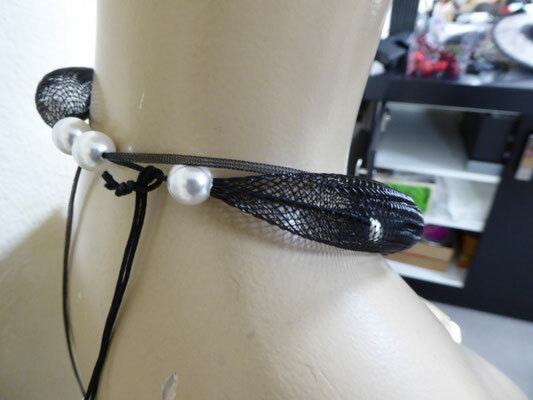 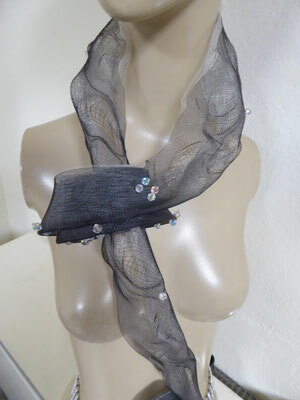 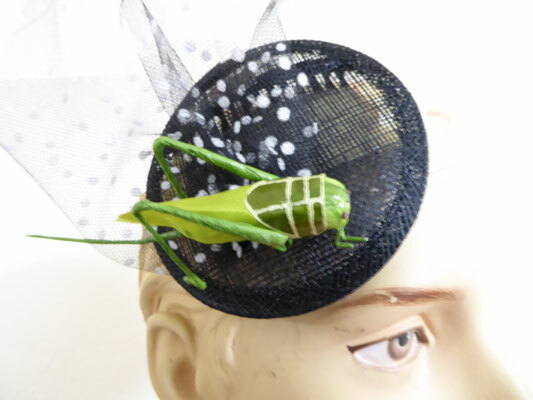 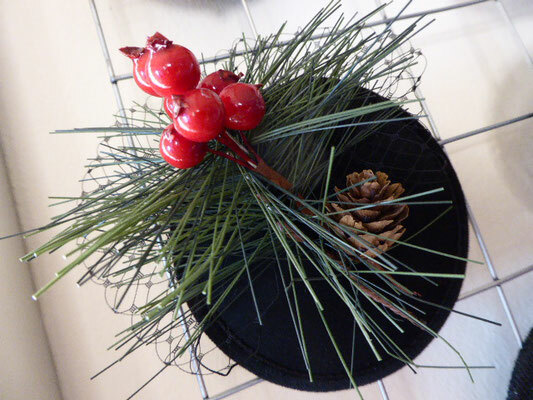 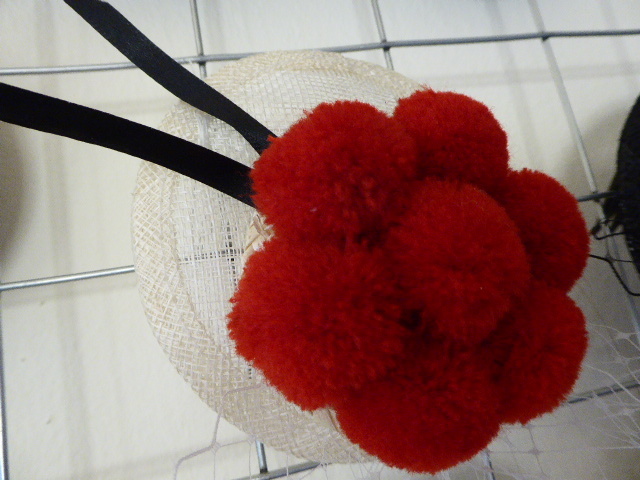 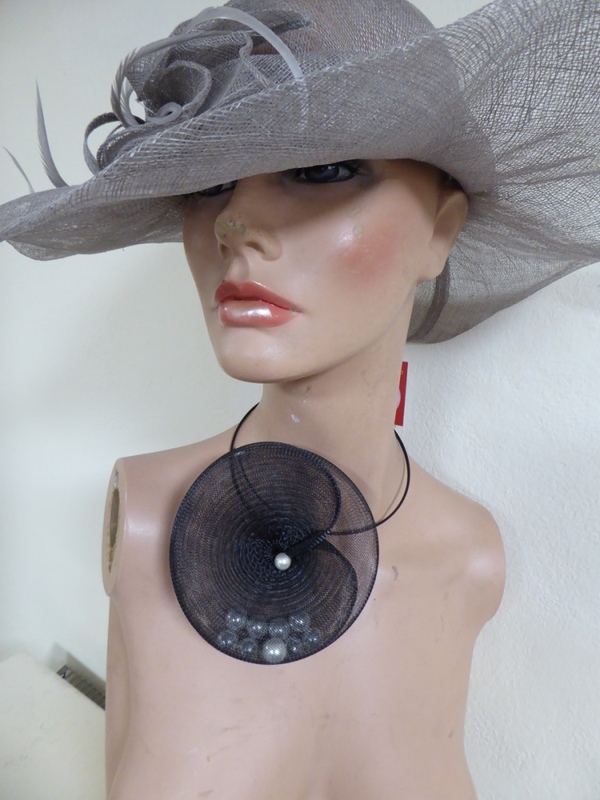 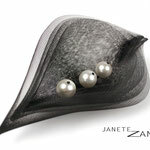 SCHMUCK & KOPFBEDECKUNG: Fascinators in allen Variationen!! Alle mit dem passendem Motif!!!! 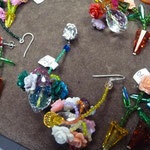 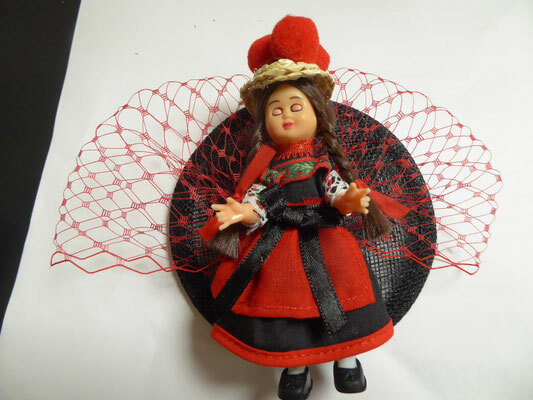 Signora Caputi has forbidden sellers to use her photos on their websites!! 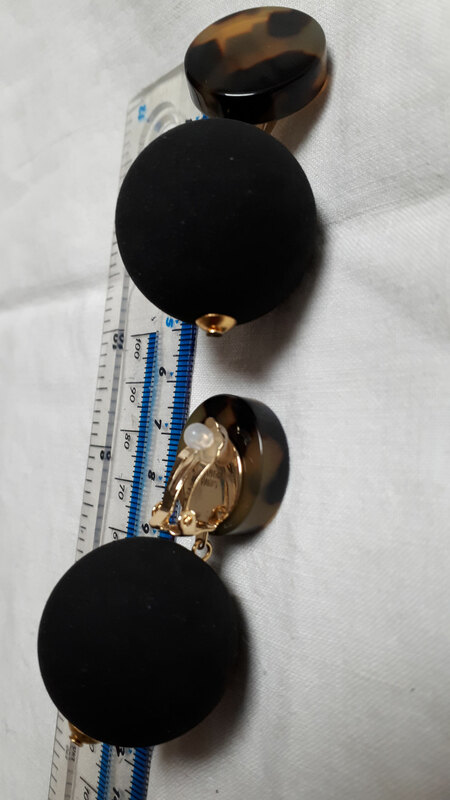 These three are the only photos she supplies for us to use. 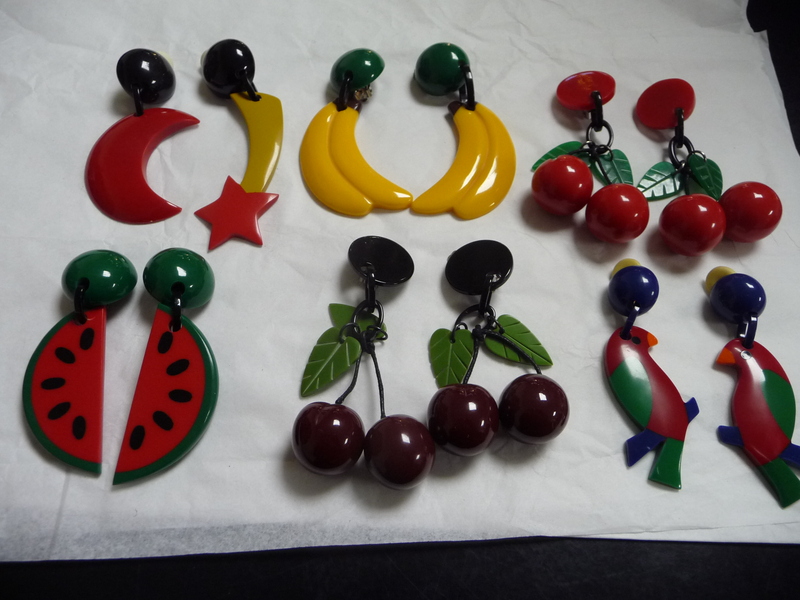 I have her collections. 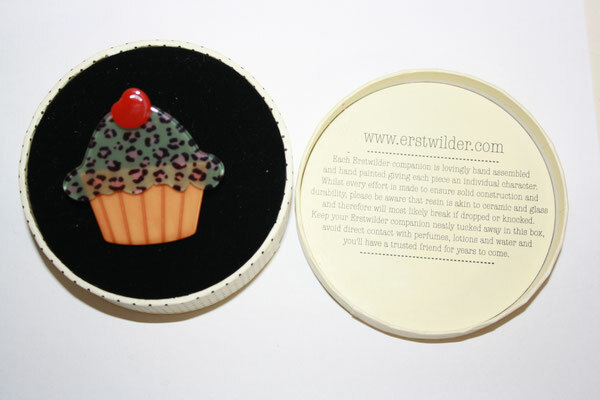 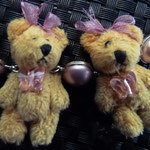 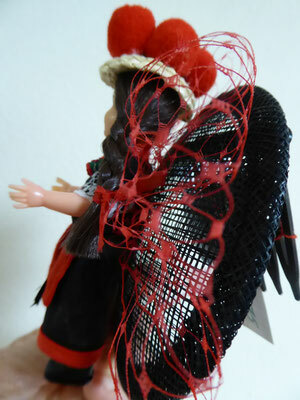 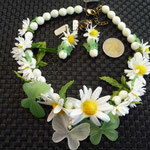 Please email me at etceterantik@gmx.de for more photos. 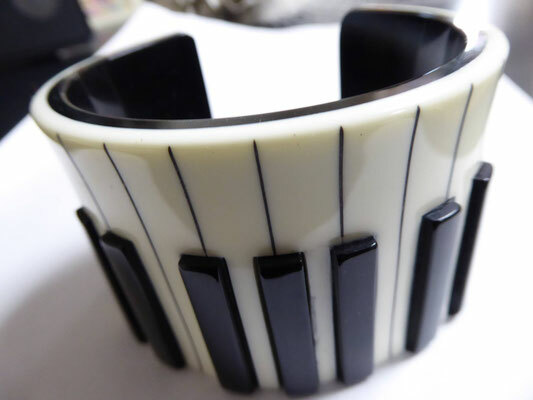 JEAN MARIE POINOT - music collection. 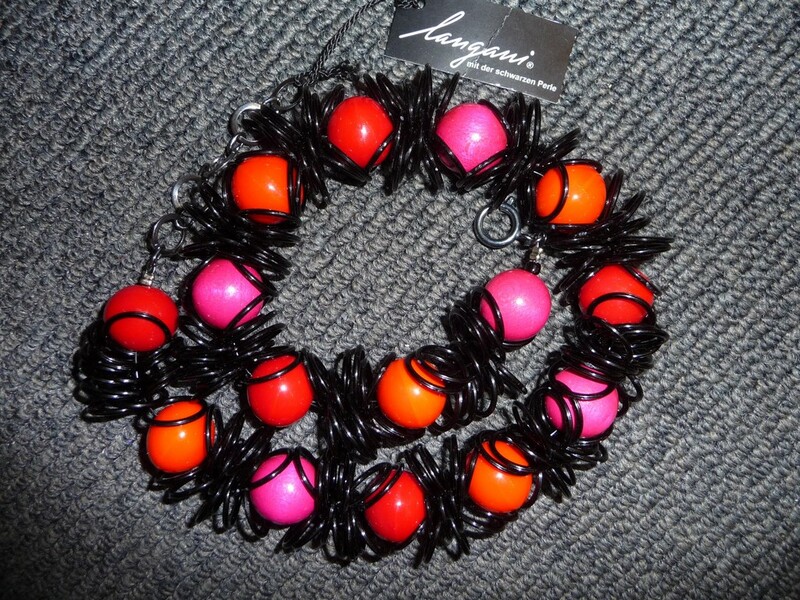 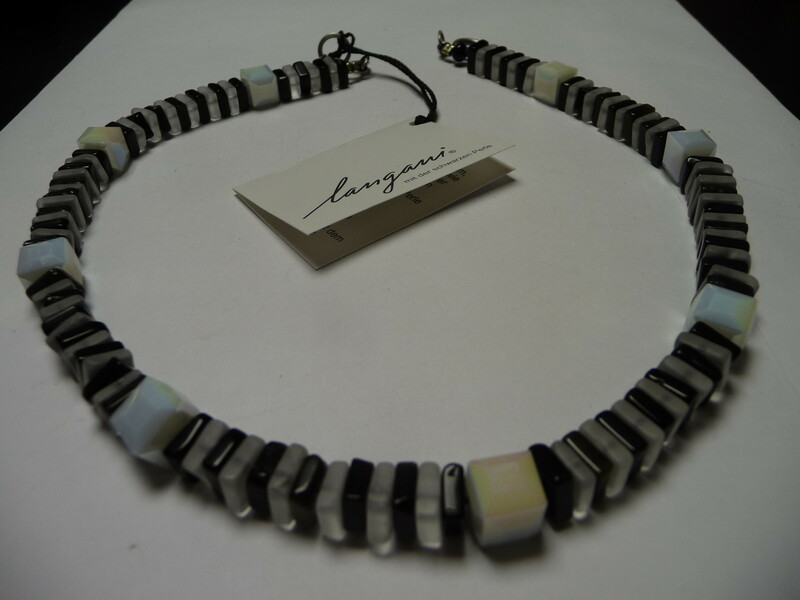 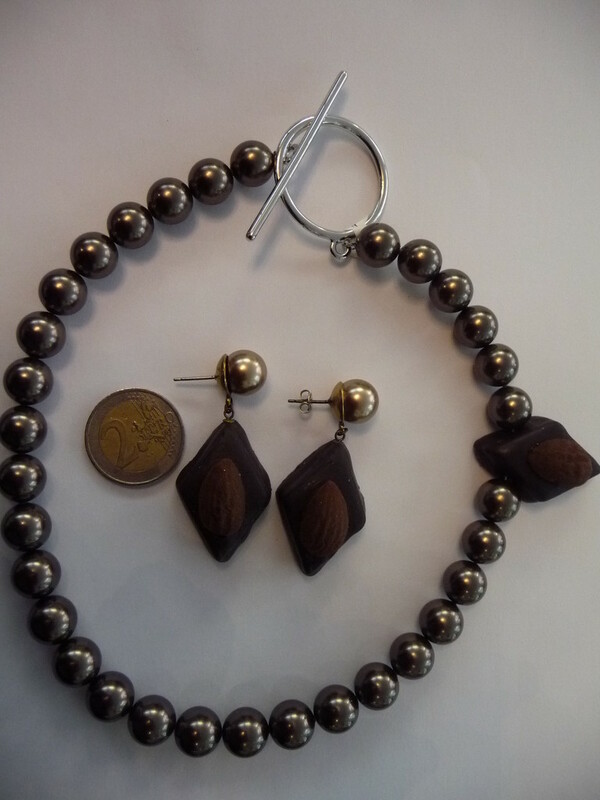 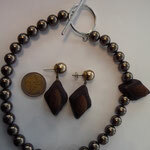 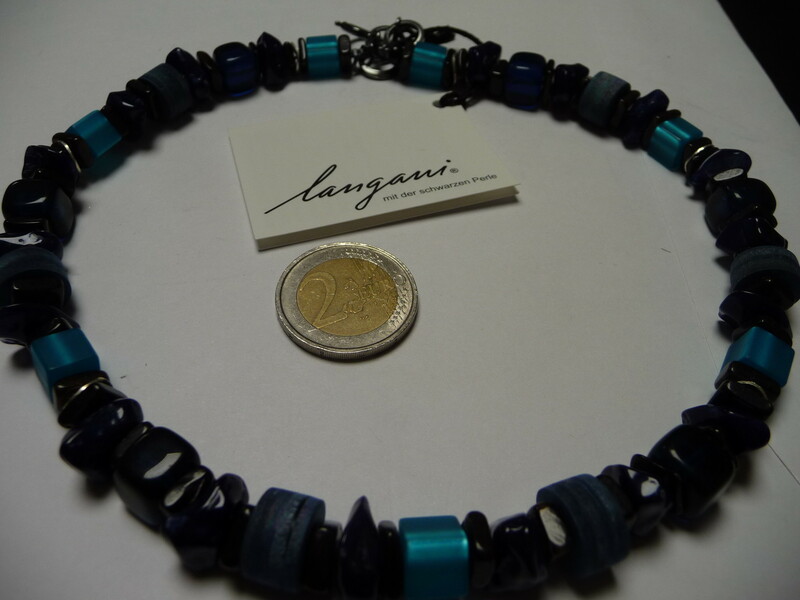 LANGANI Schmuck .... See below for a small selection. 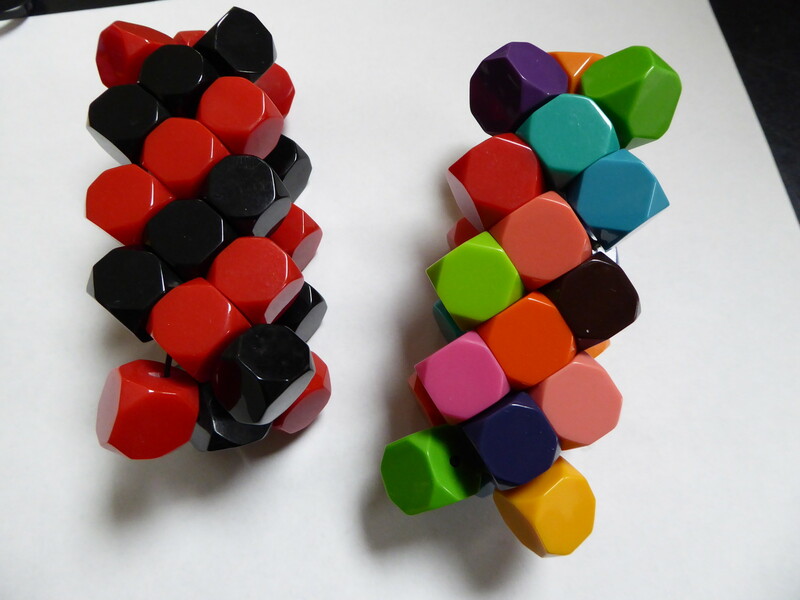 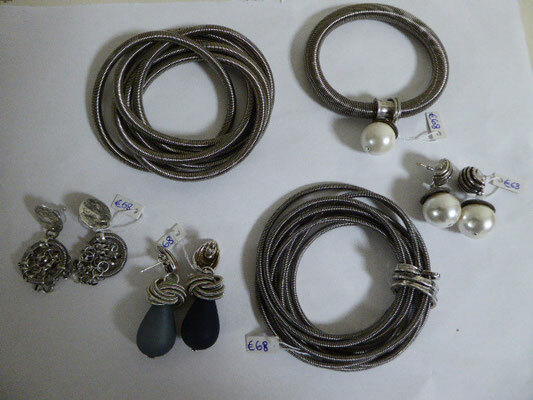 We have more in the shop. 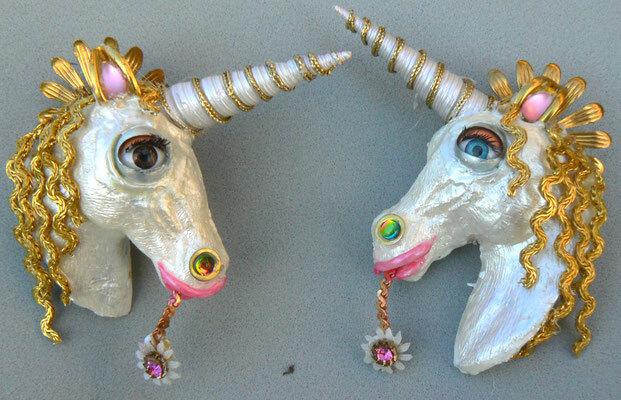 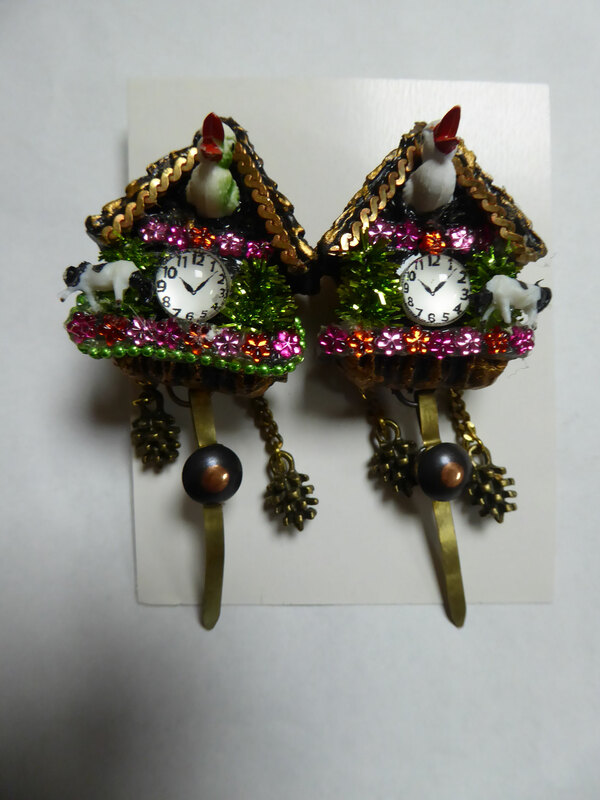 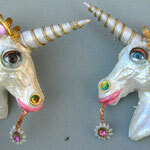 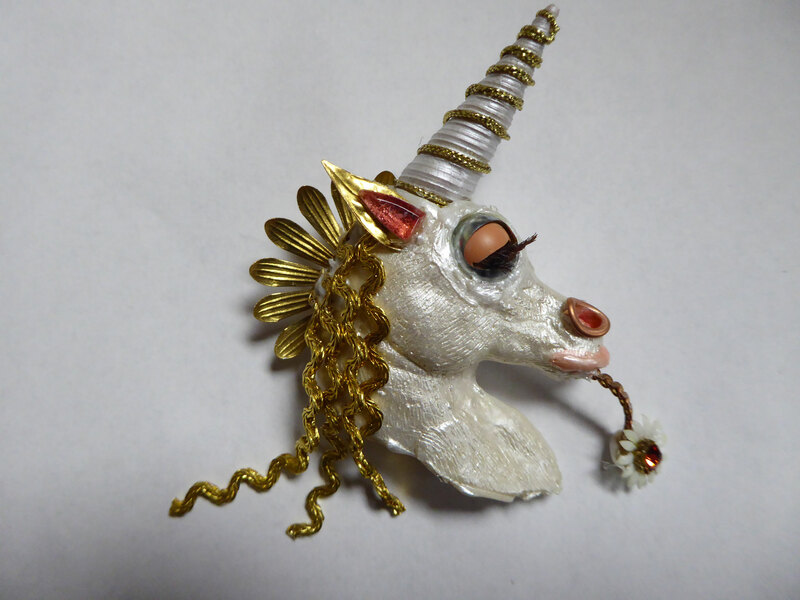 NIKI BODEN, GERMANY - these beautiful unicorn brooches are new. 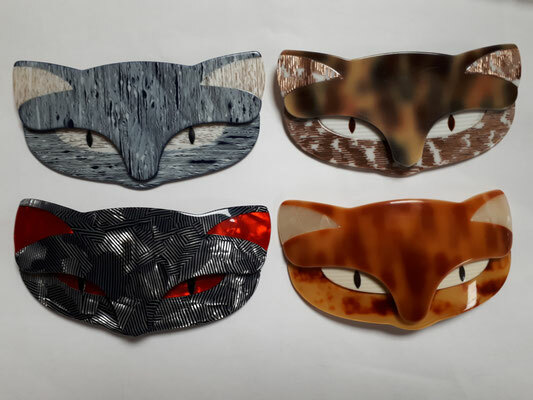 The eyes open and shut. 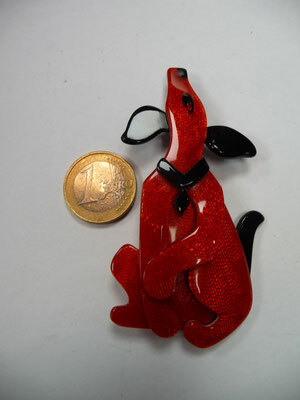 ADORABLE isn't the word. Just these two - one with a blue eye and one with a brown eye! 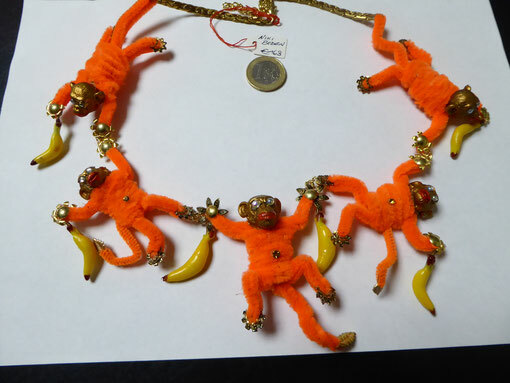 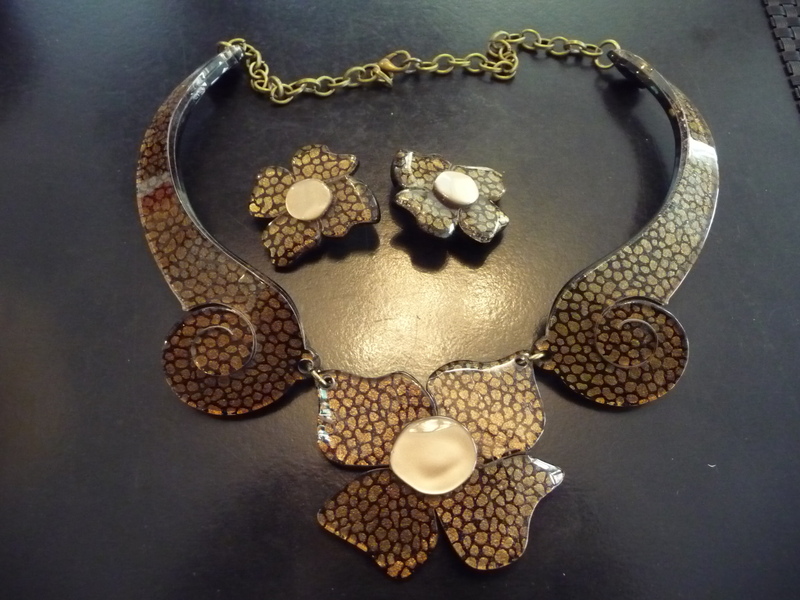 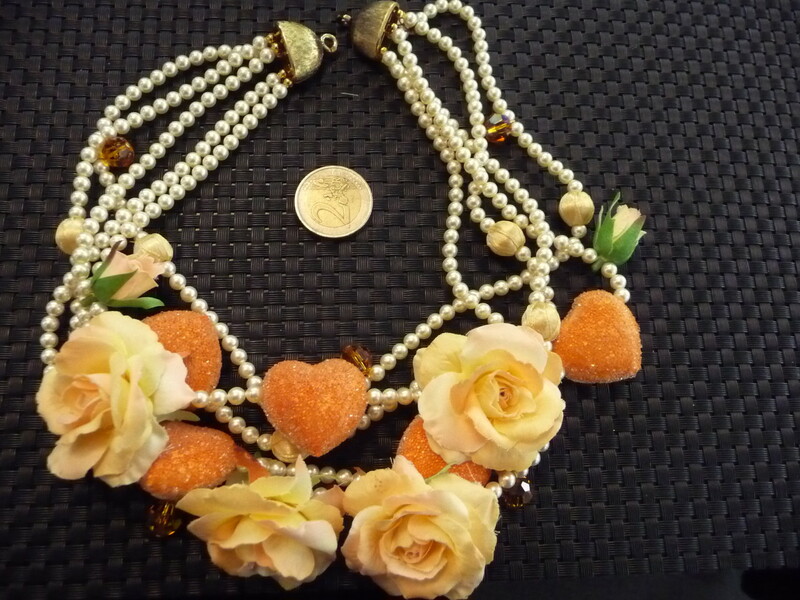 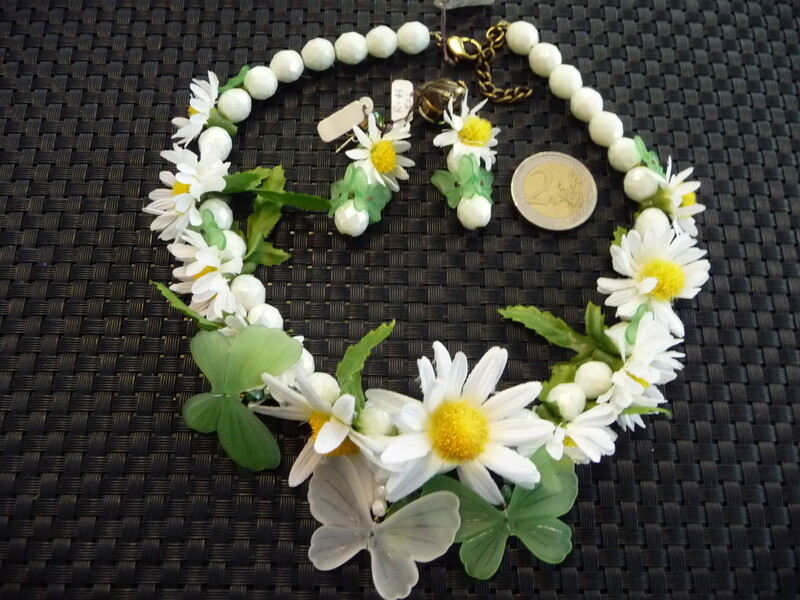 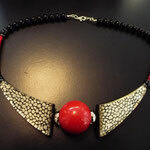 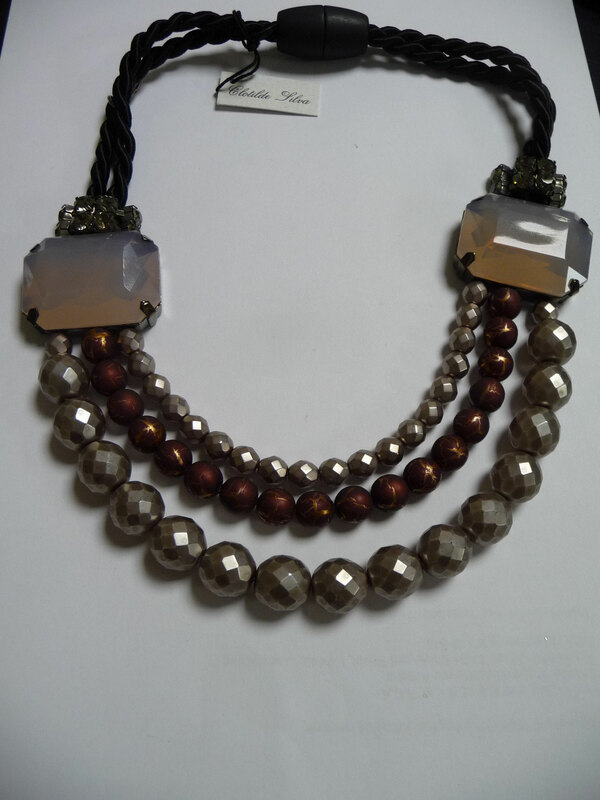 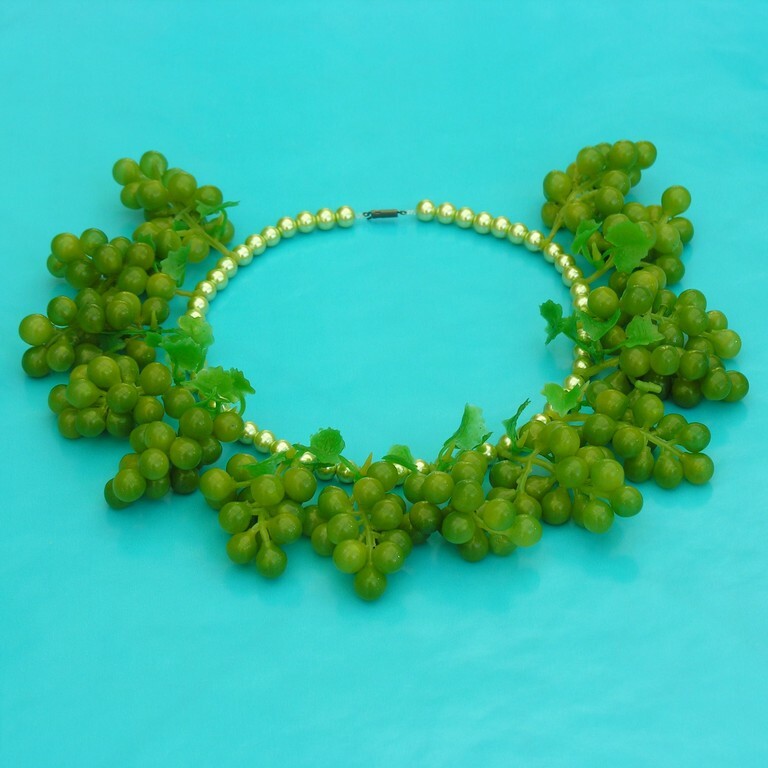 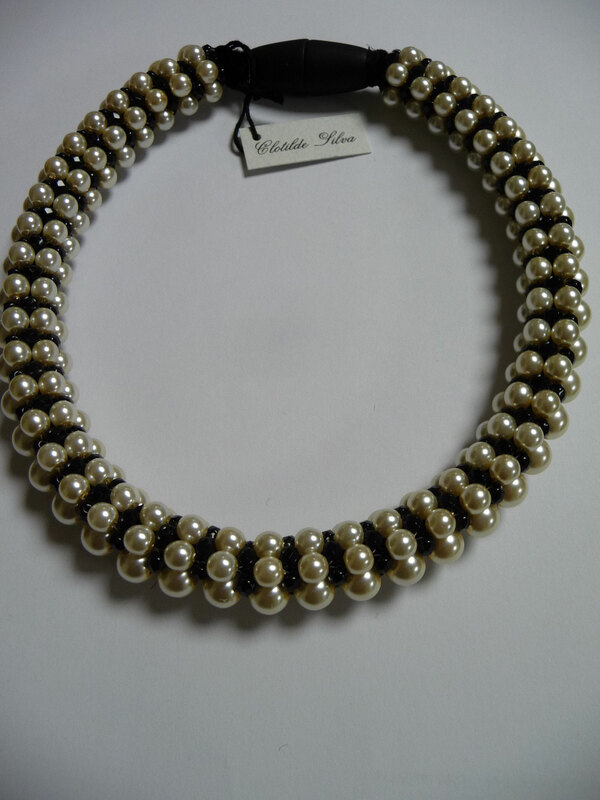 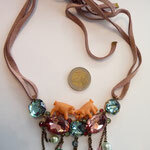 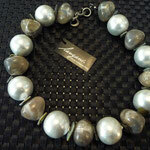 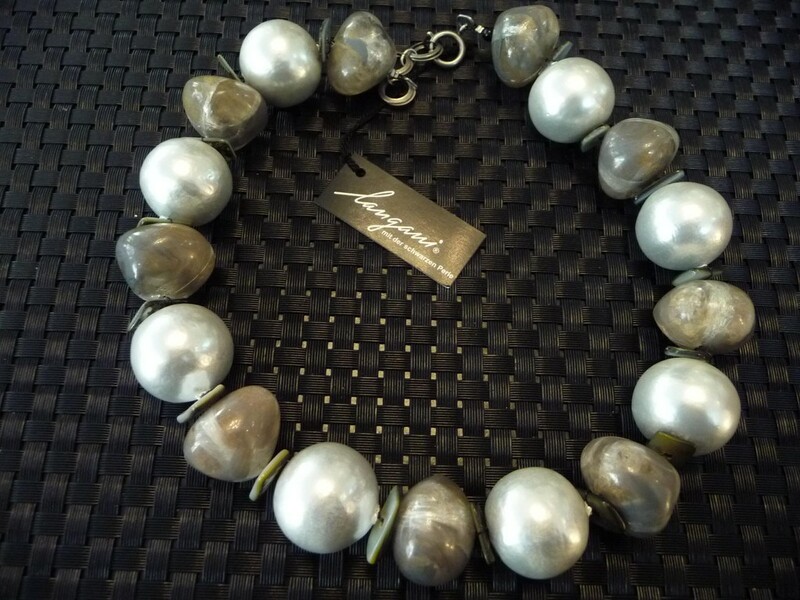 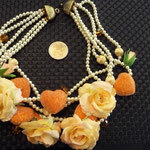 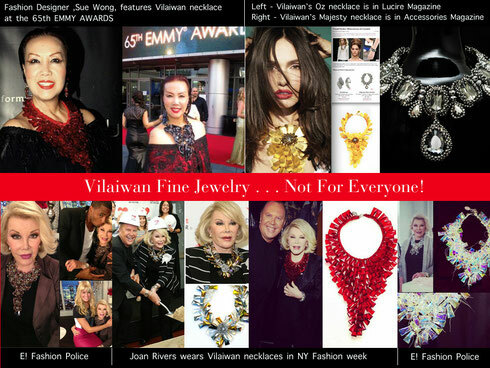 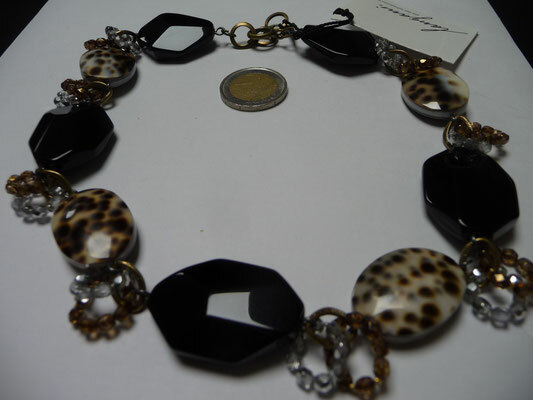 VILAIWAN JEWELRY - worn by many US celebrities, eg Joan Rivers. 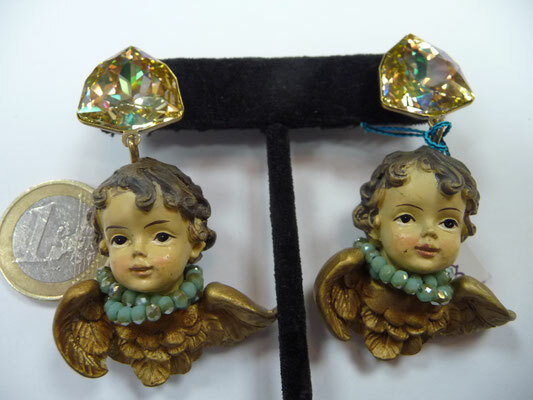 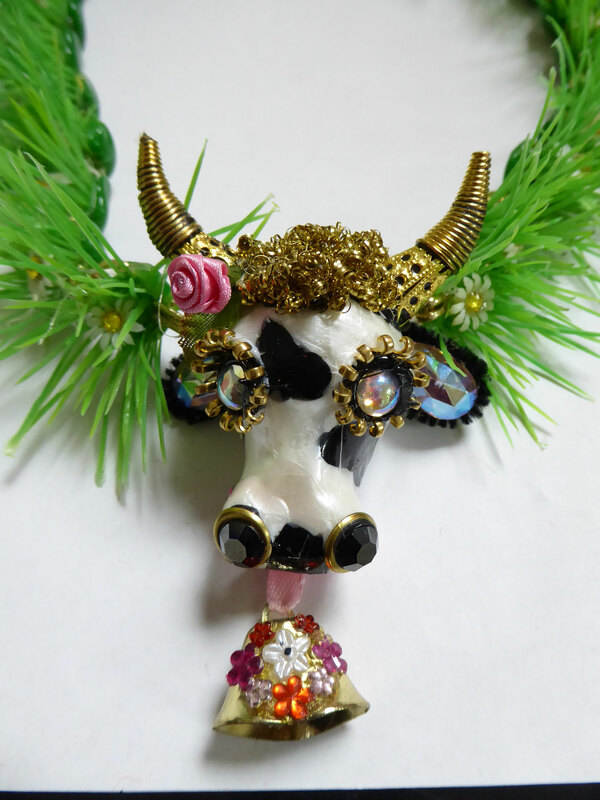 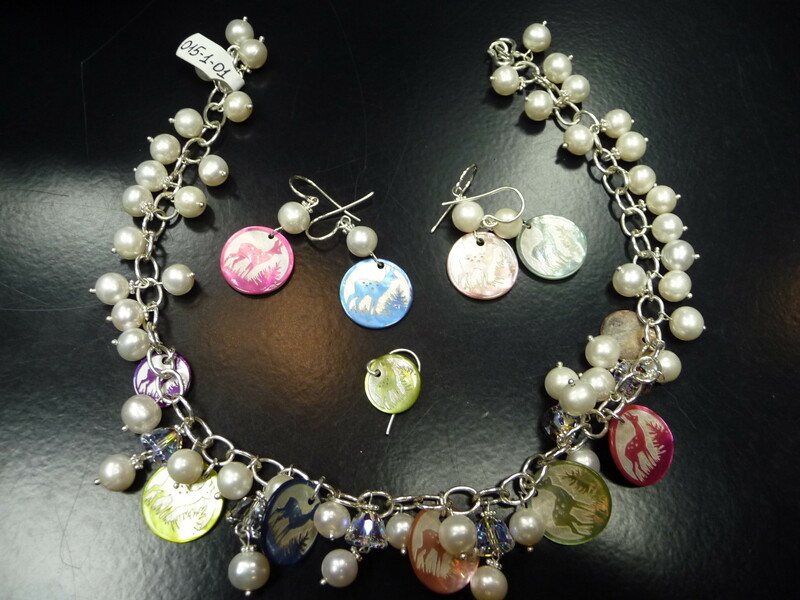 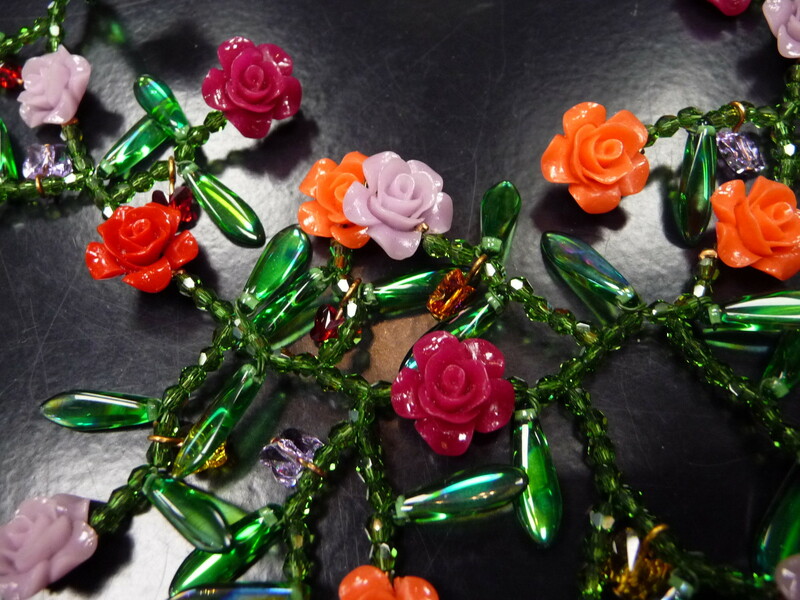 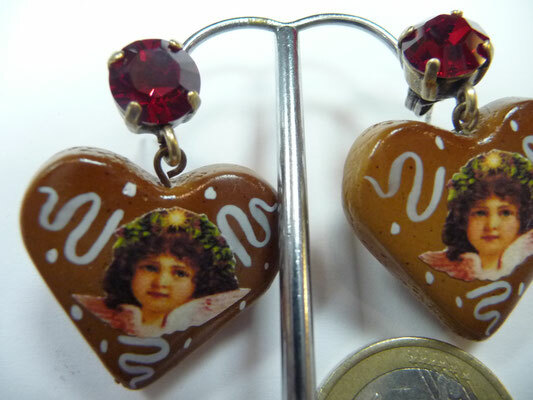 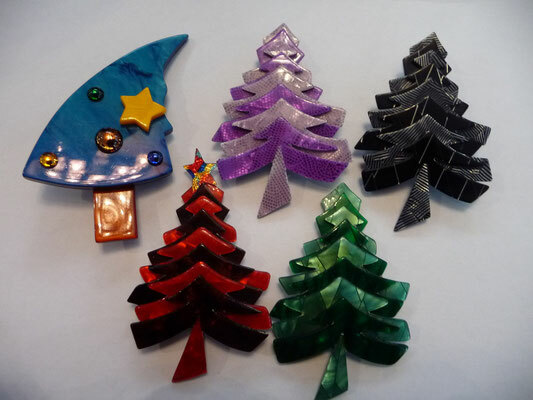 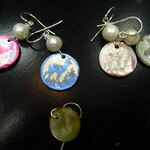 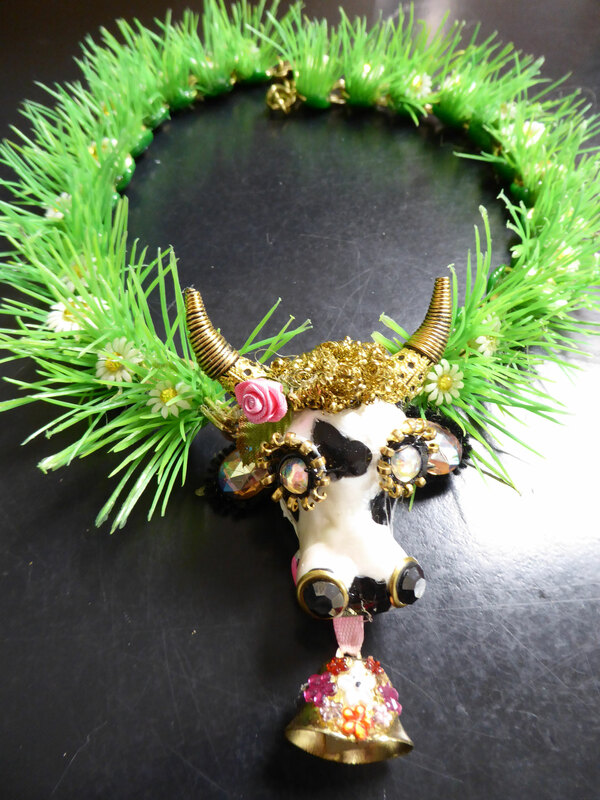 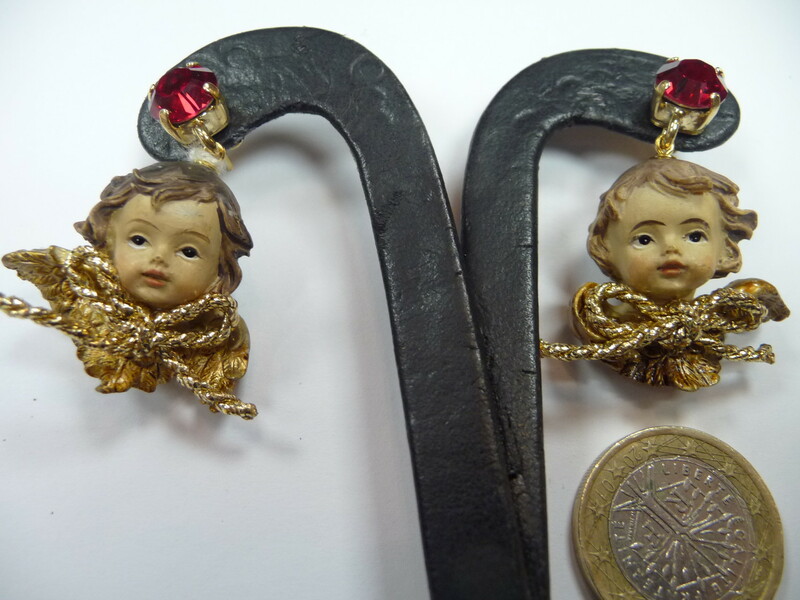 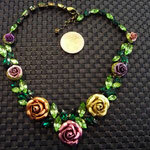 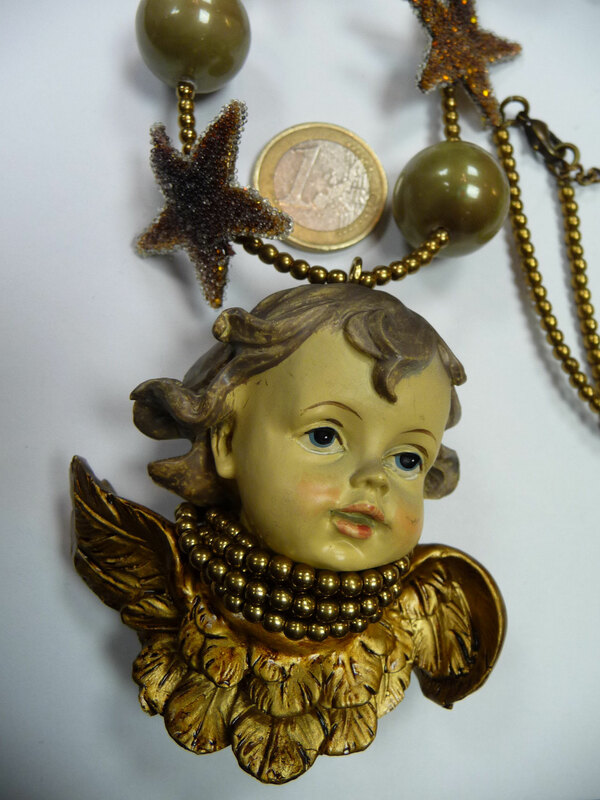 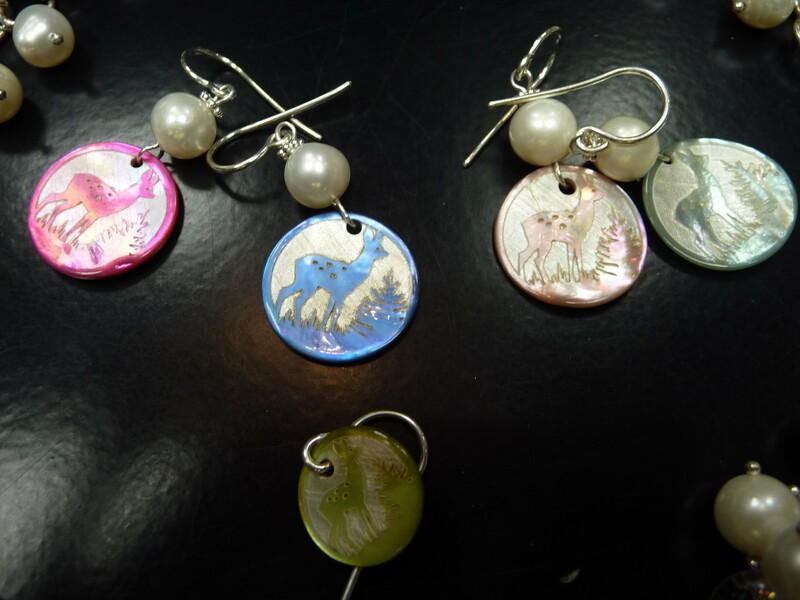 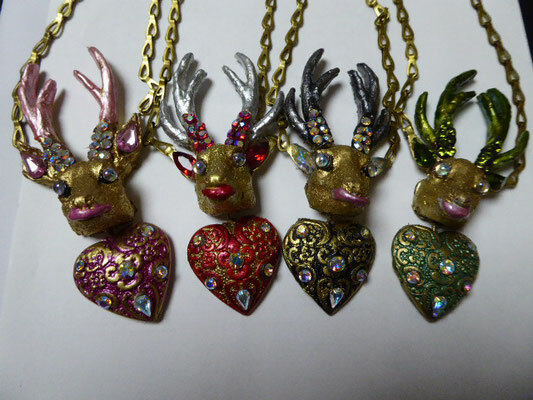 Christmas jewelry made by Rosa Templin - angels for your ears and throat. 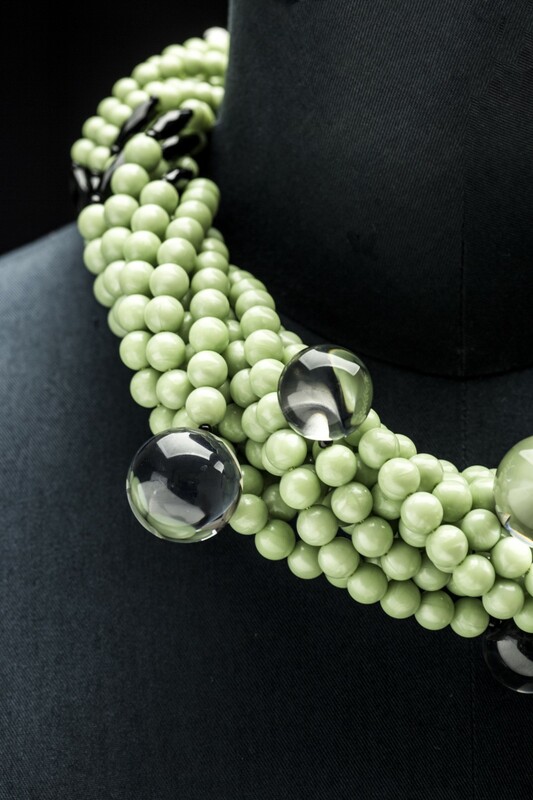 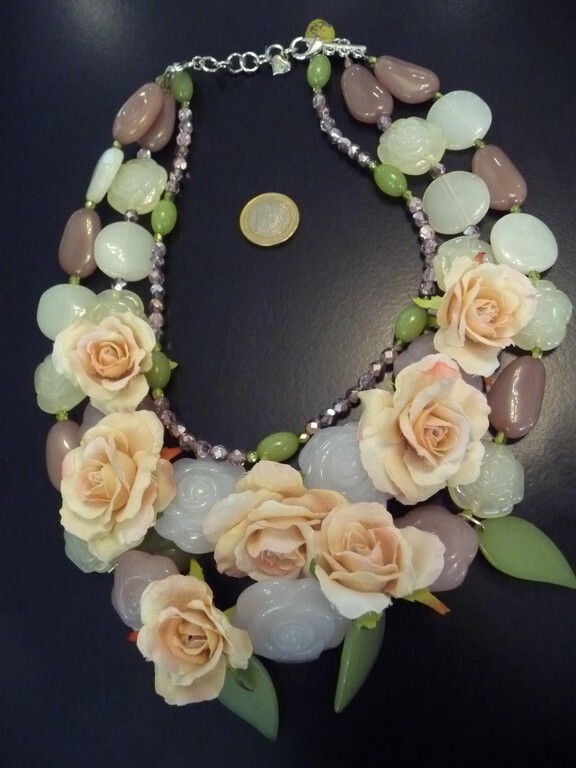 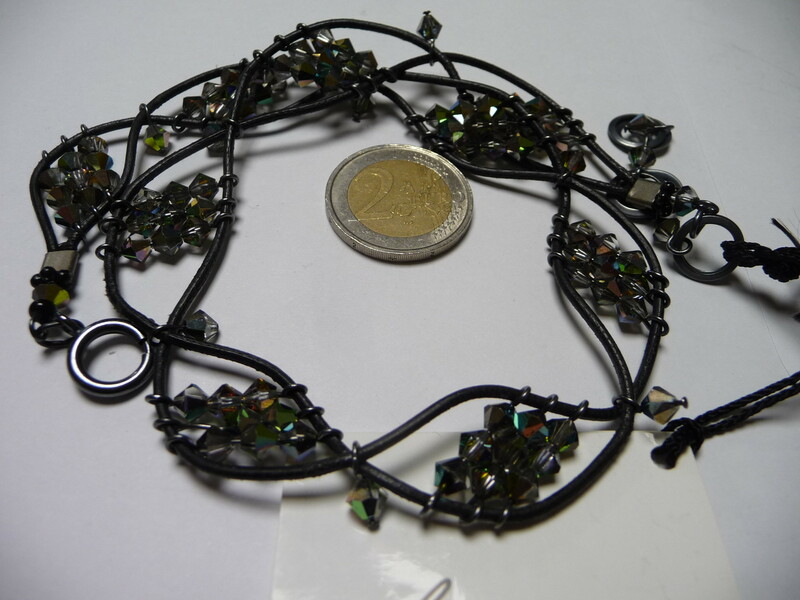 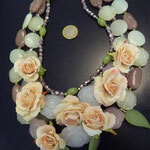 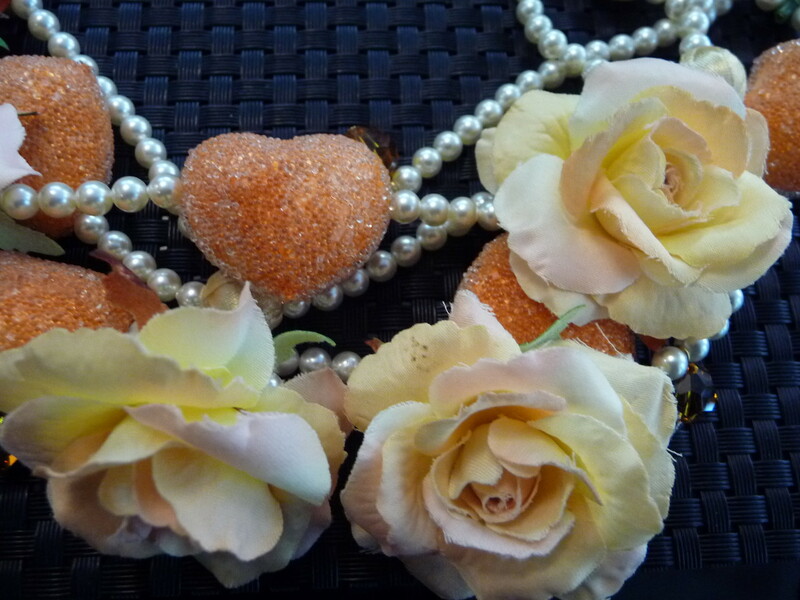 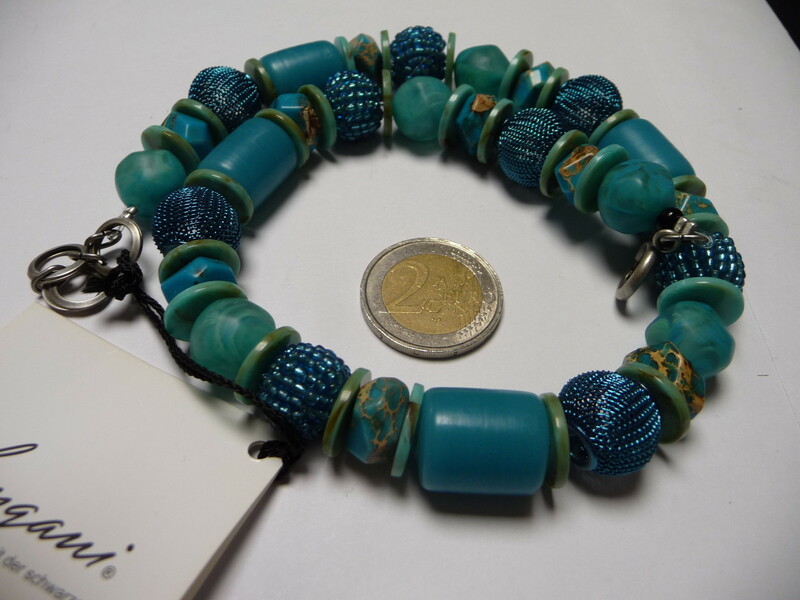 Exquisitely made by one of Germany's best-known jewelry designers. Also Christmas trees by LEA STEIN, Paris - very collectable as there are hardly any in circulation. 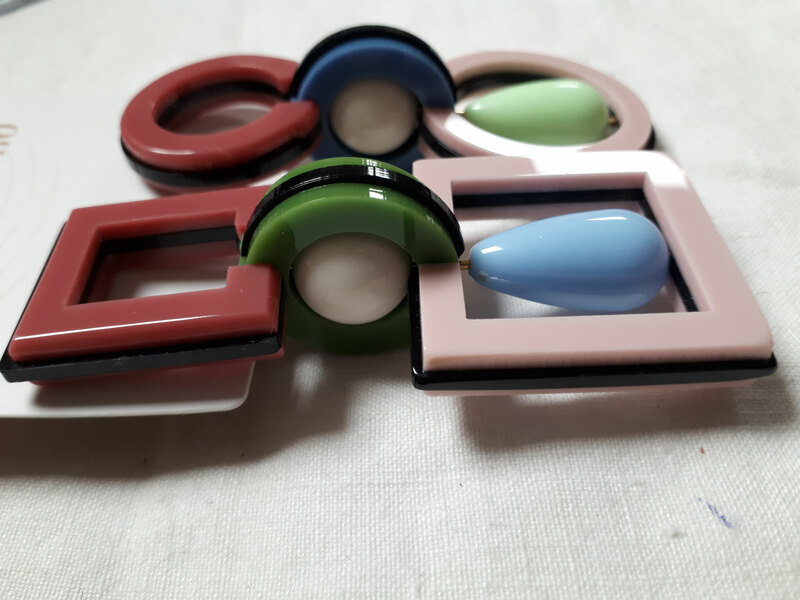 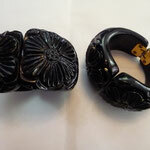 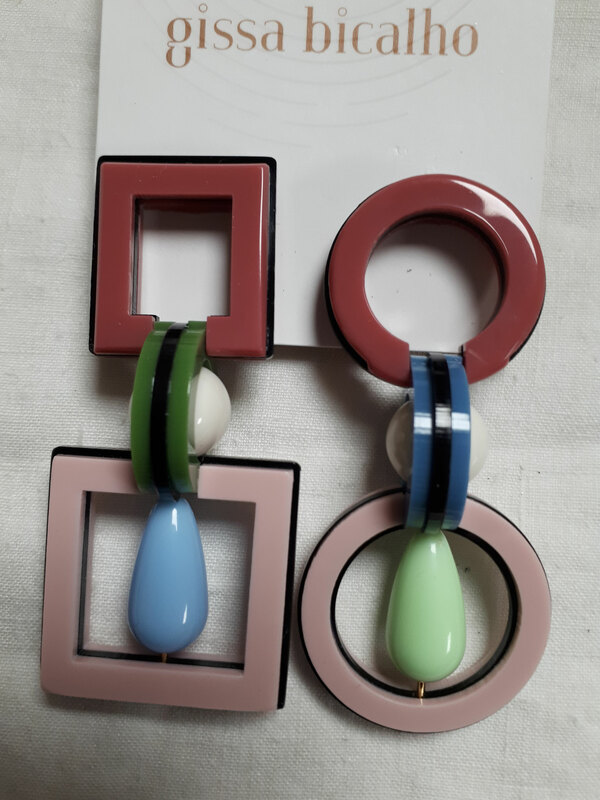 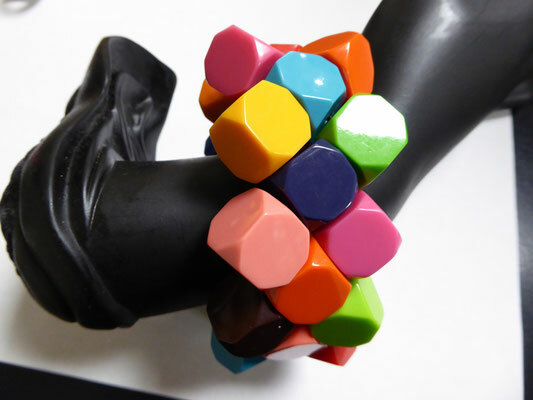 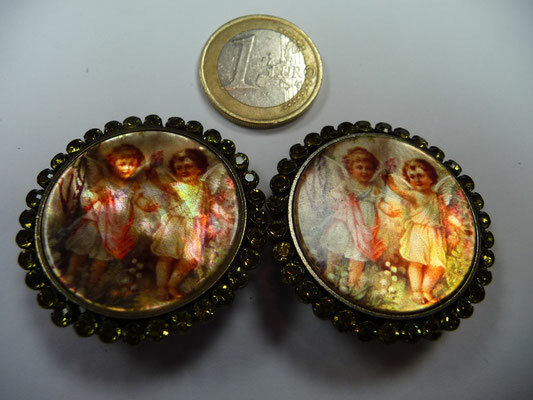 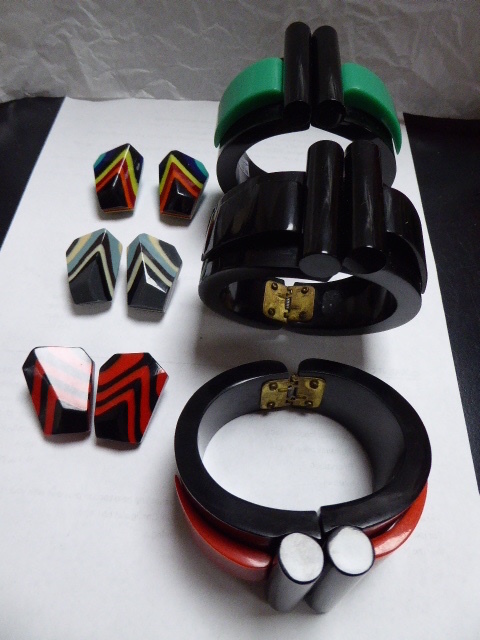 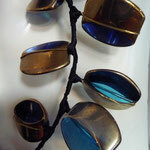 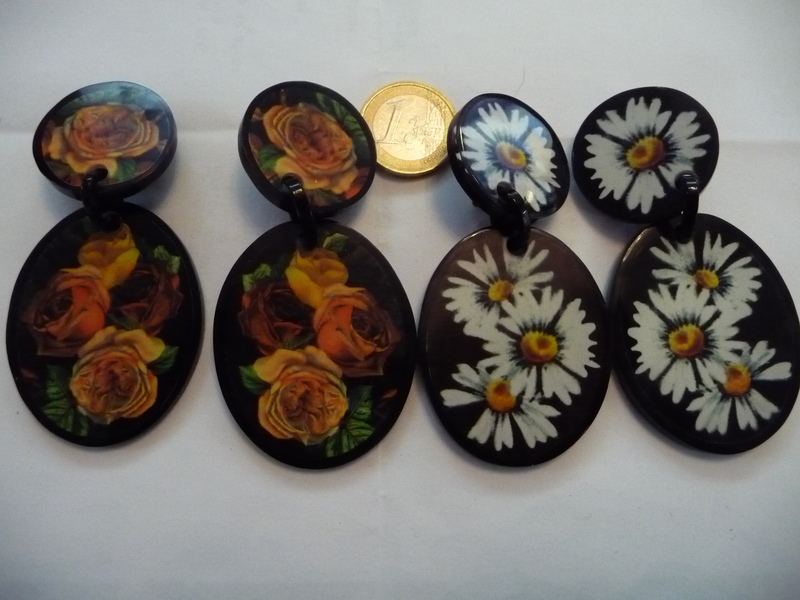 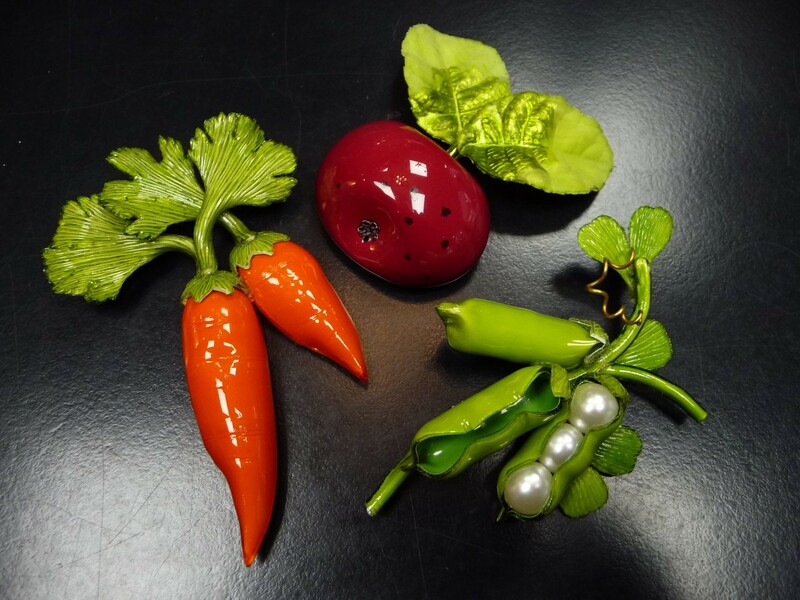 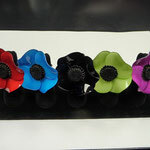 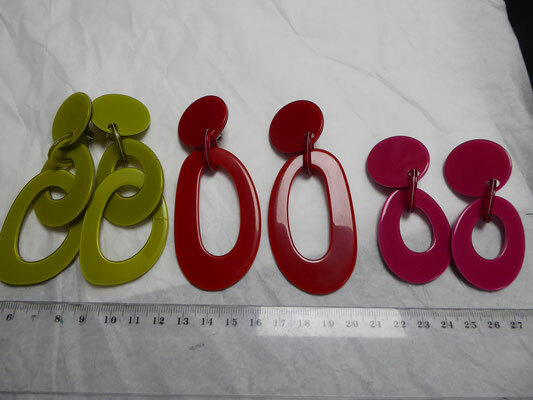 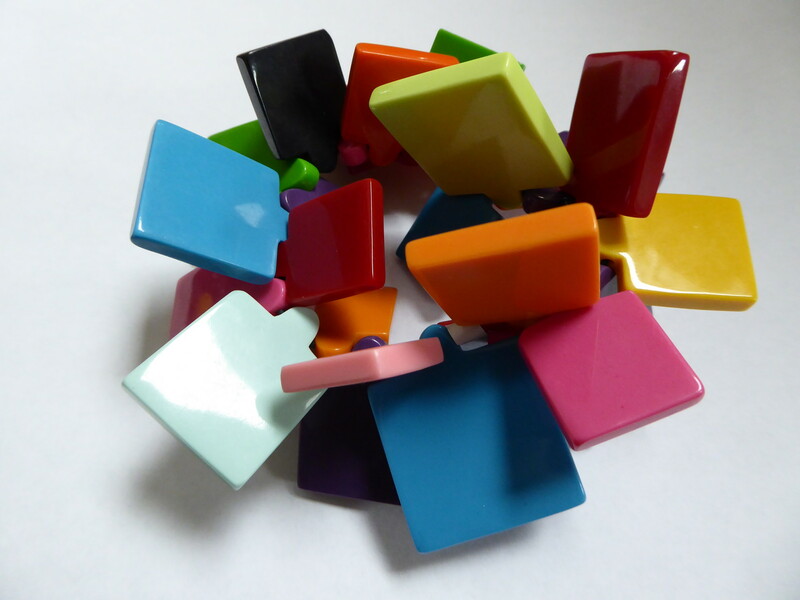 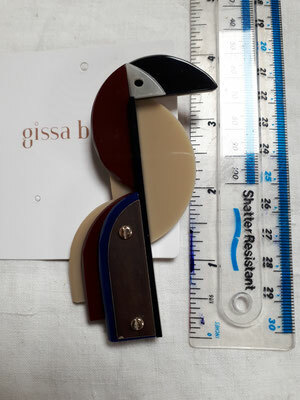 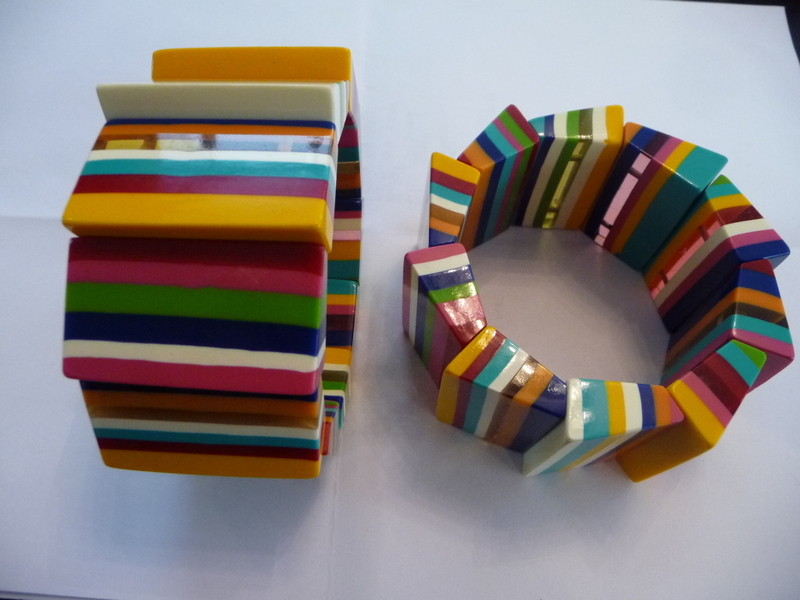 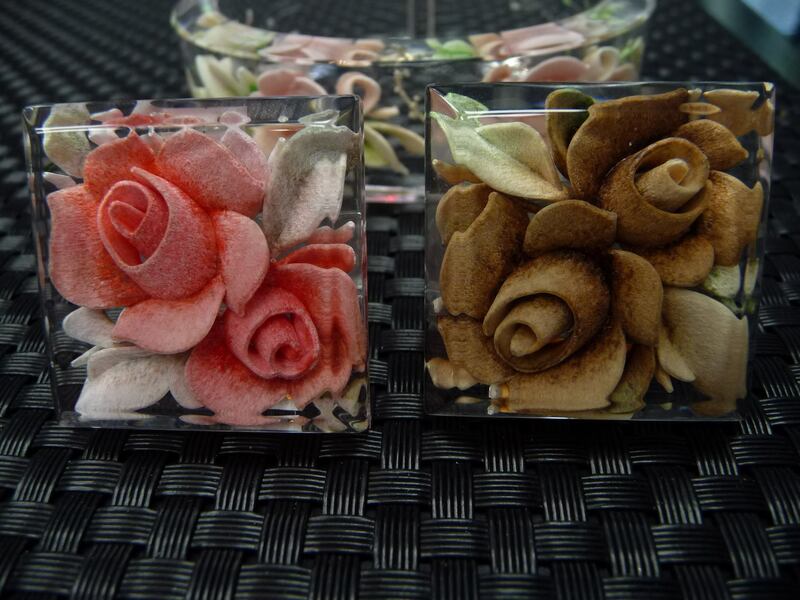 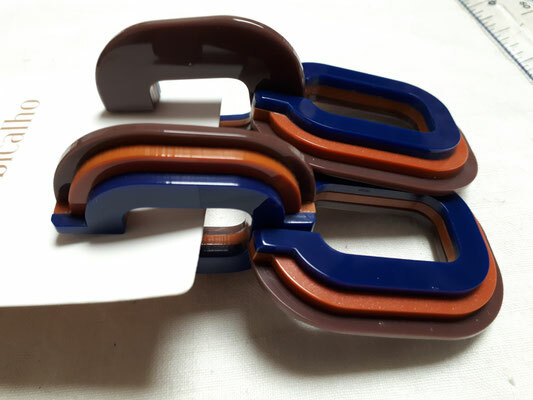 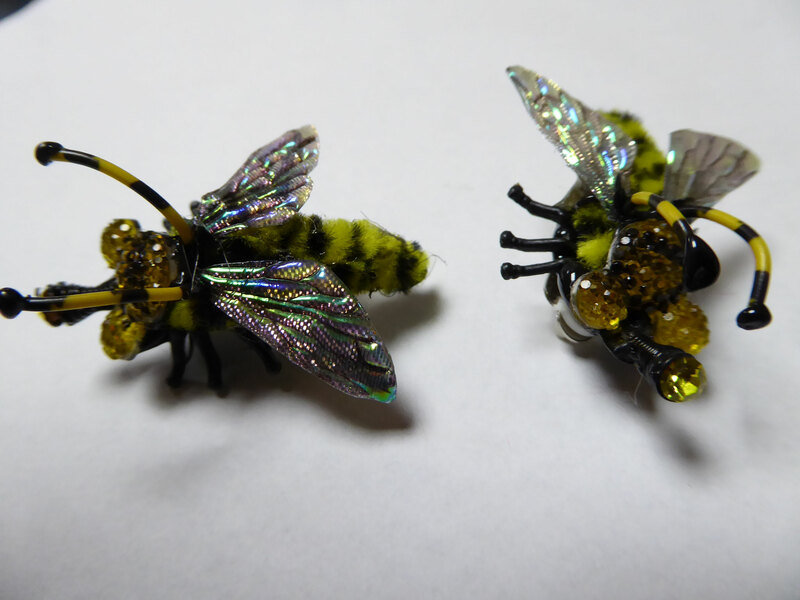 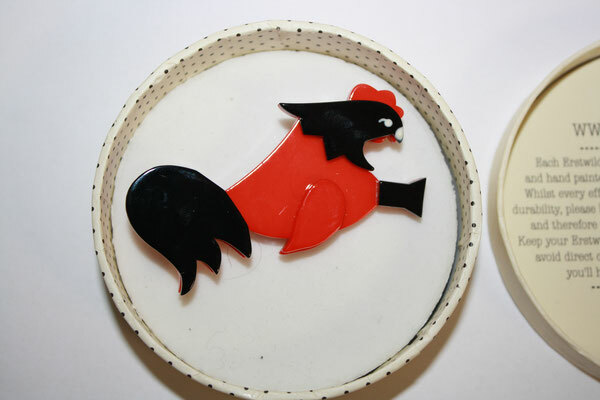 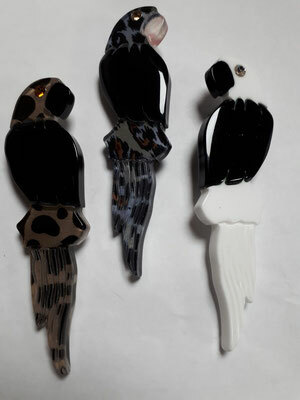 CILEA Paris - enamelled resin rings and brooches. 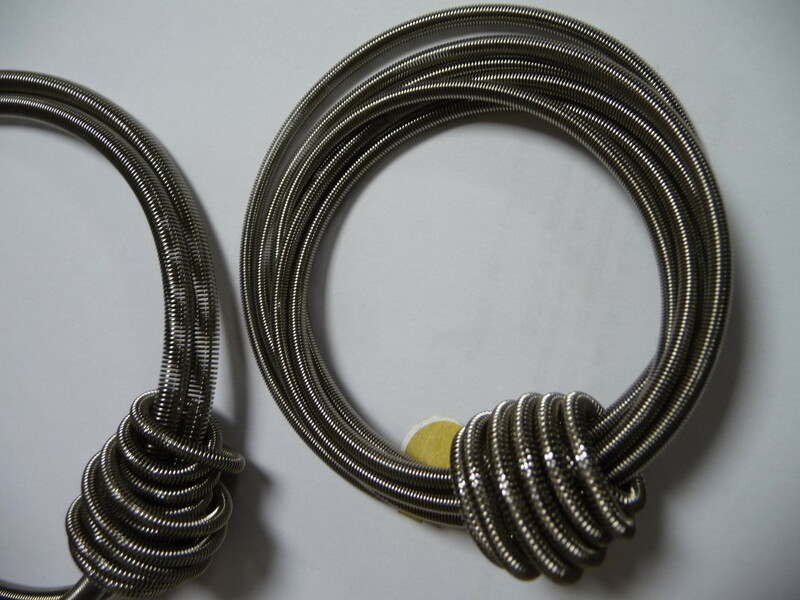 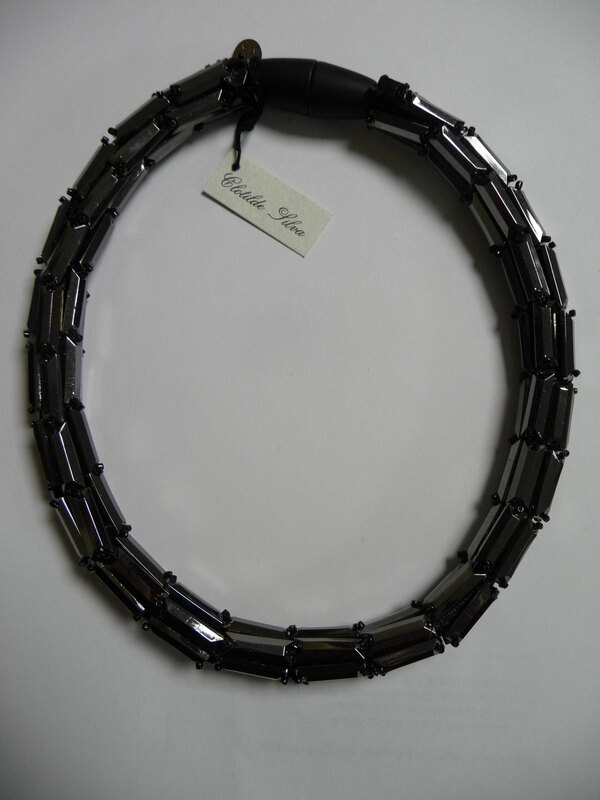 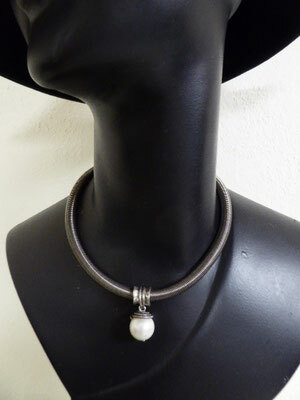 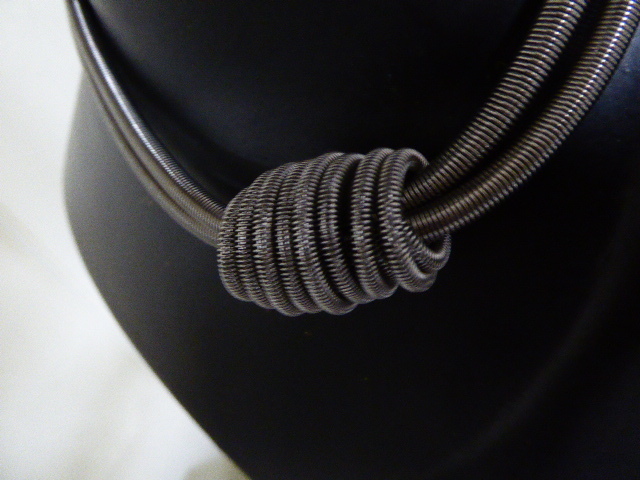 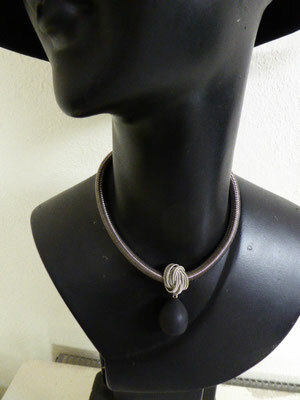 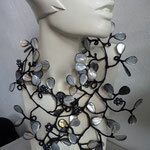 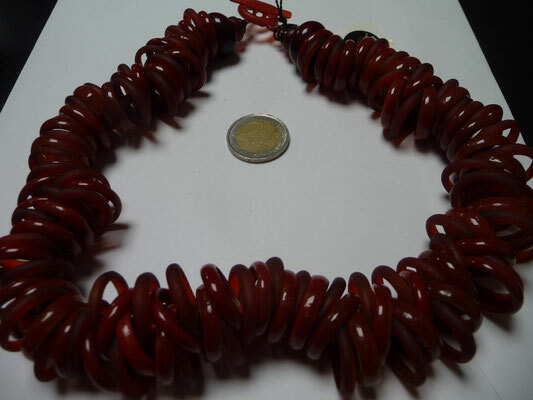 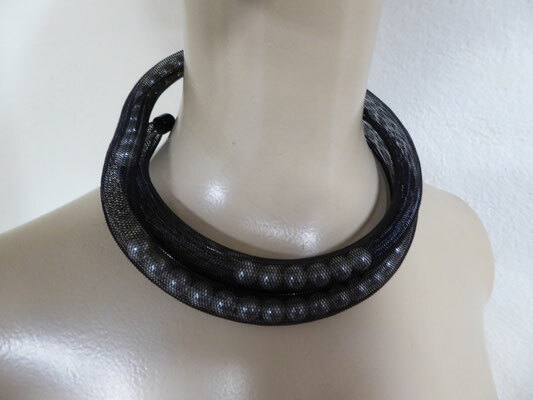 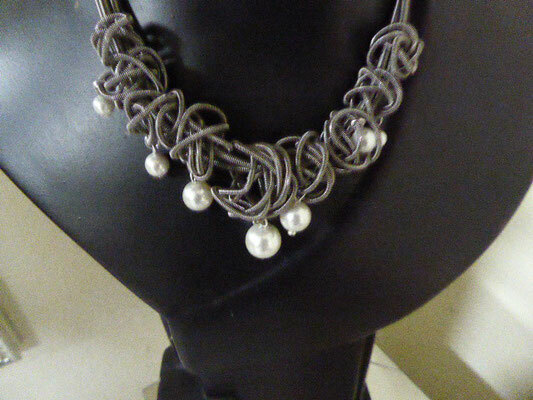 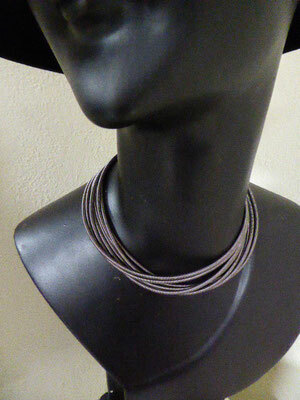 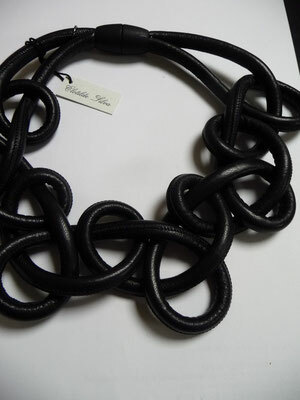 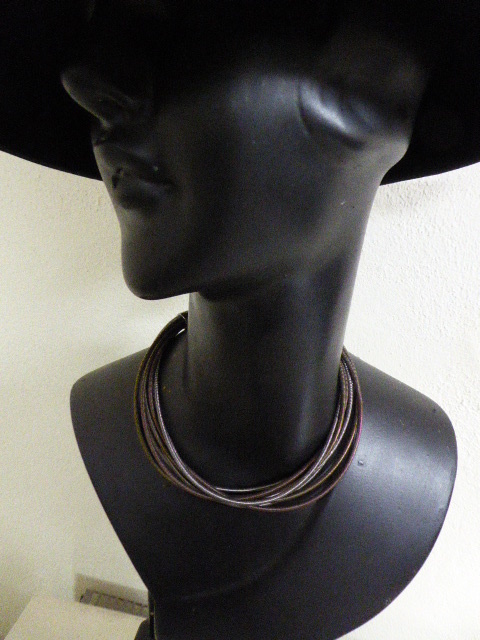 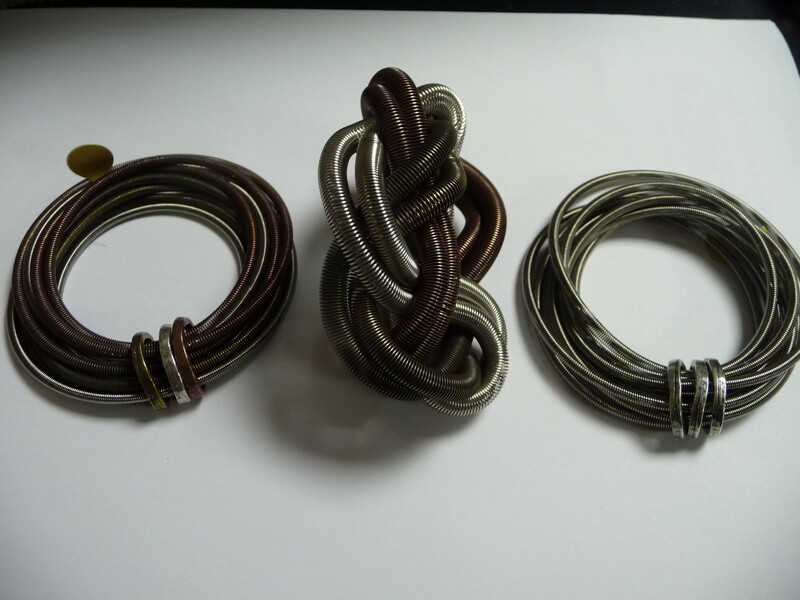 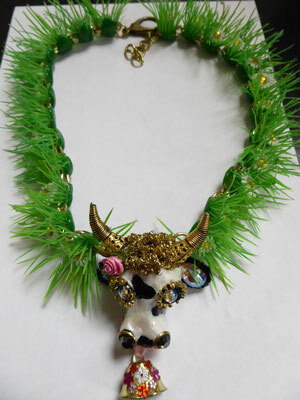 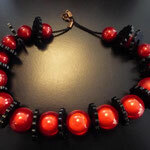 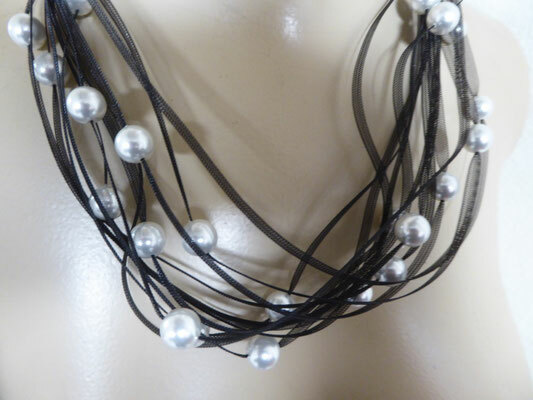 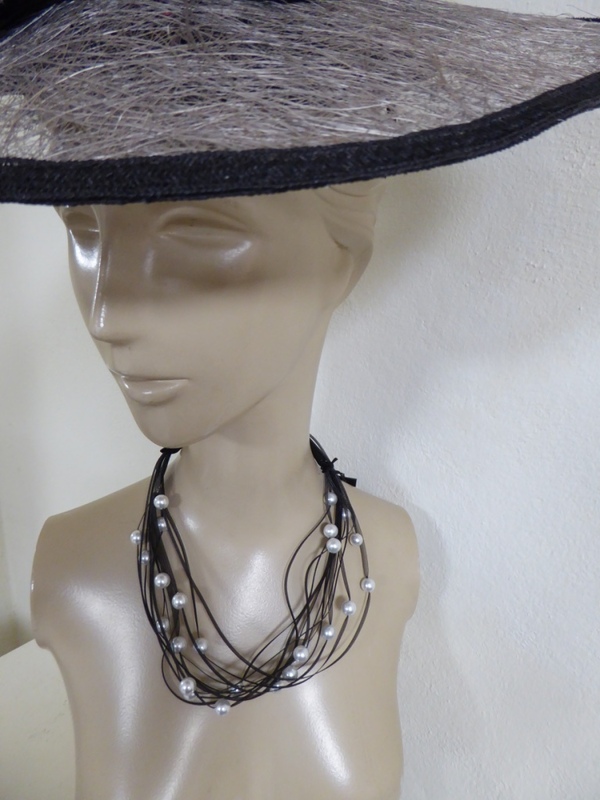 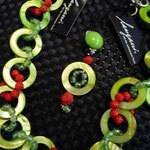 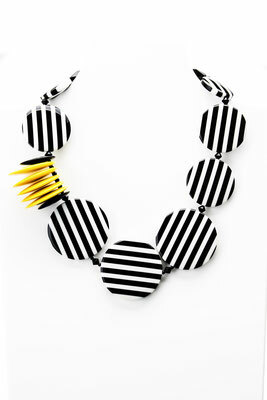 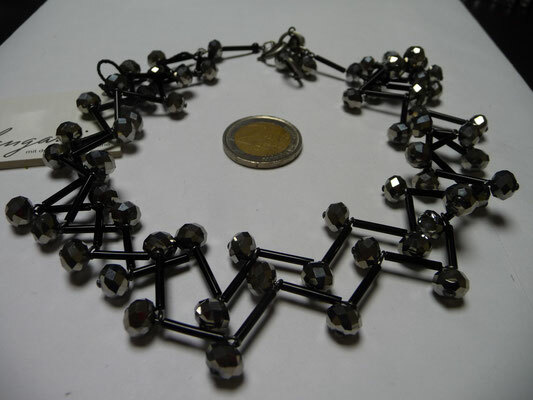 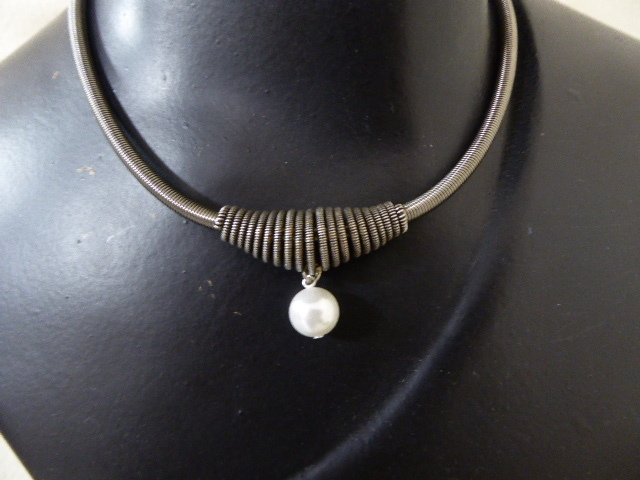 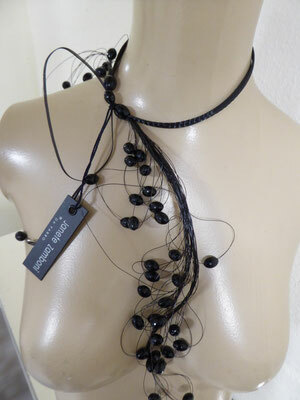 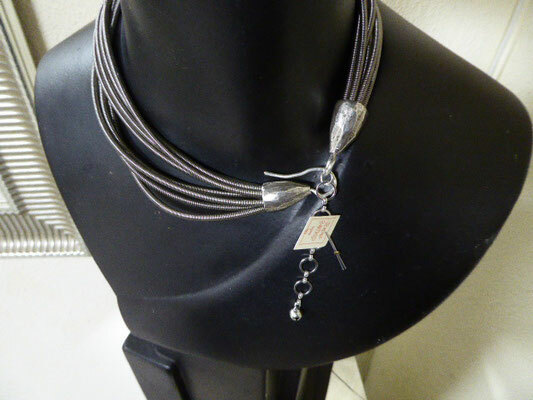 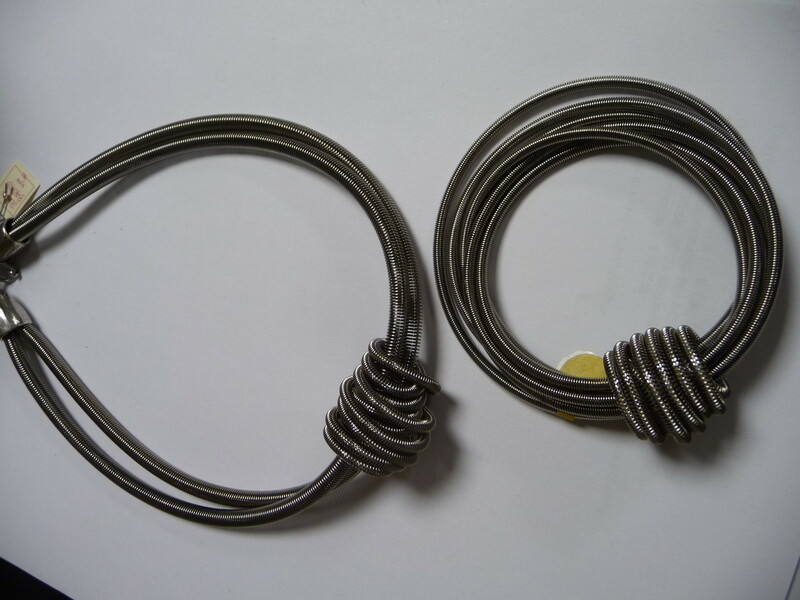 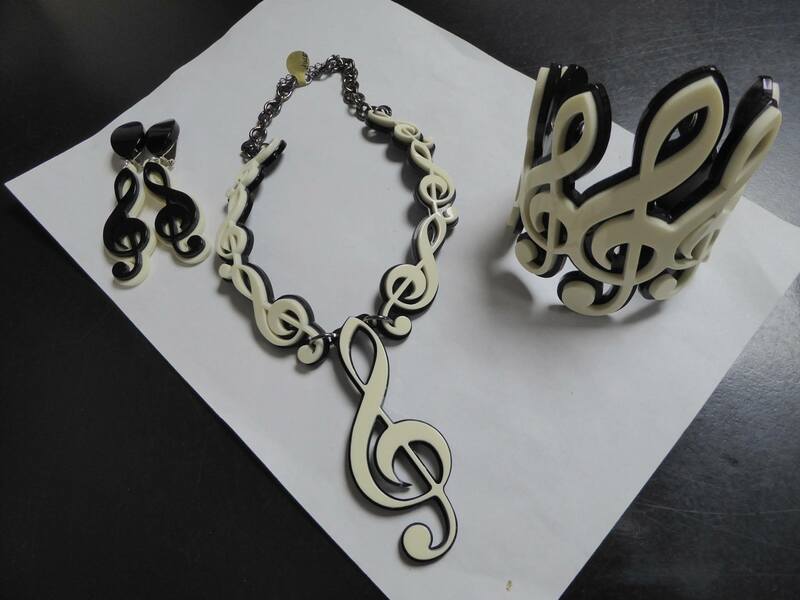 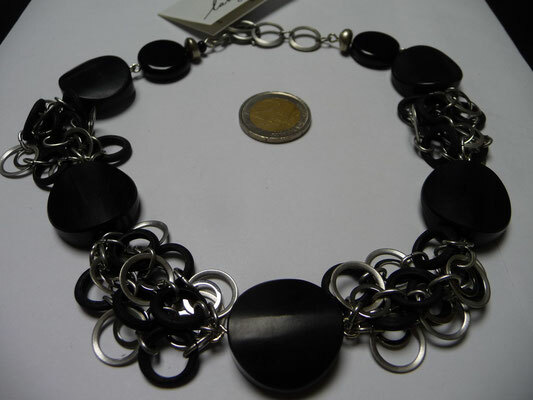 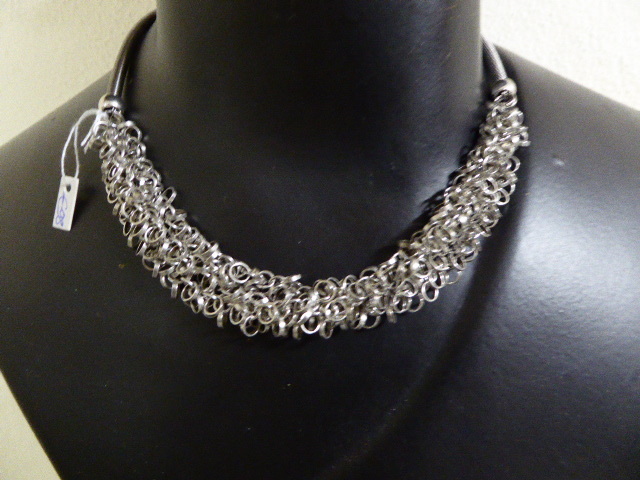 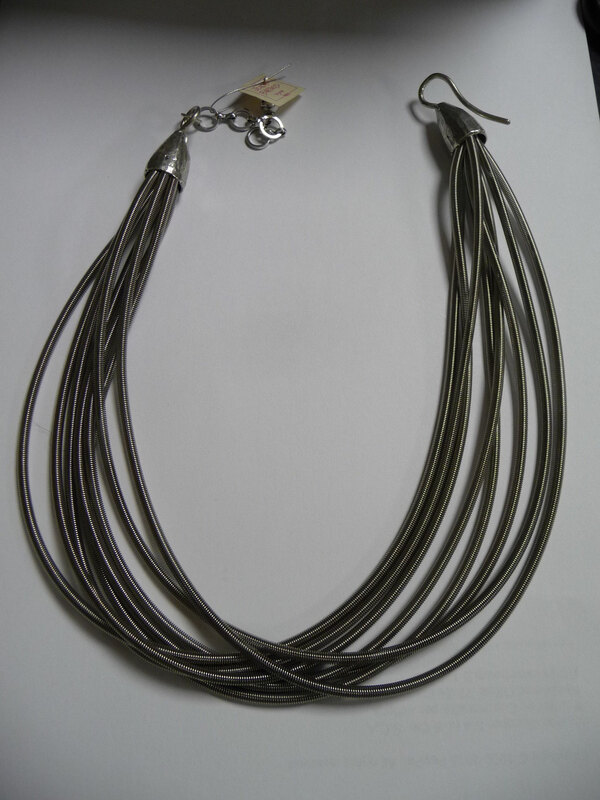 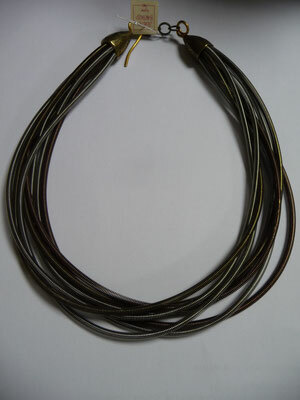 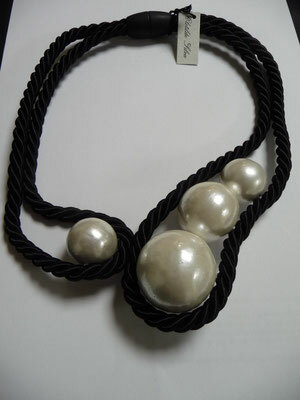 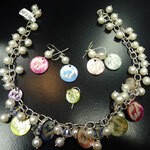 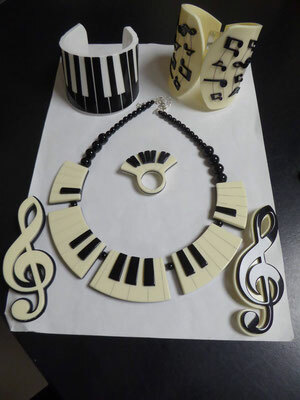 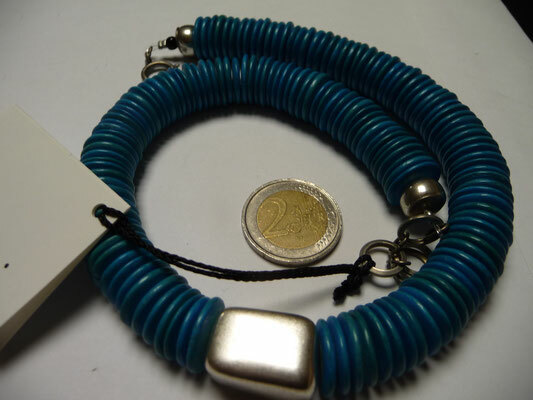 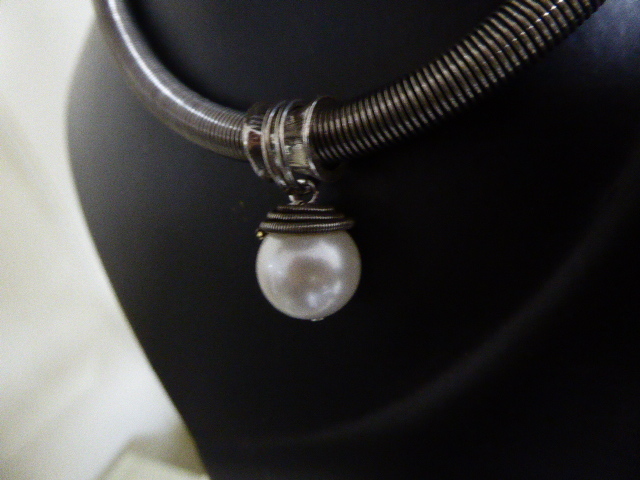 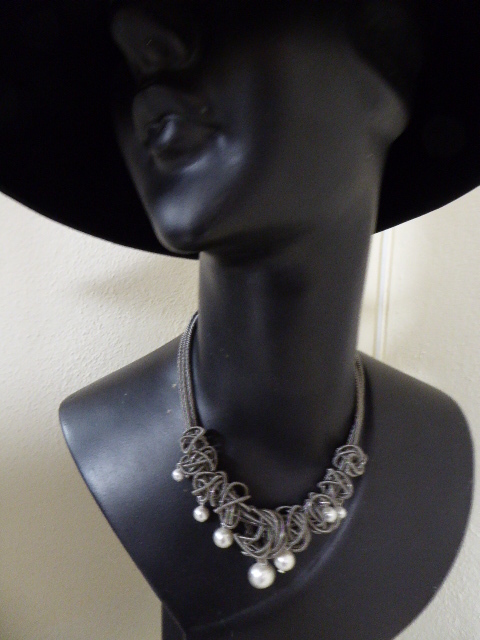 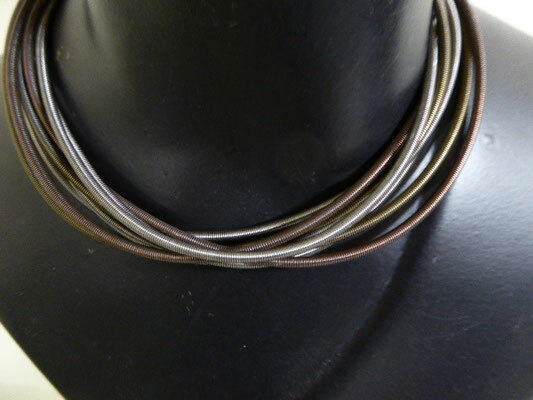 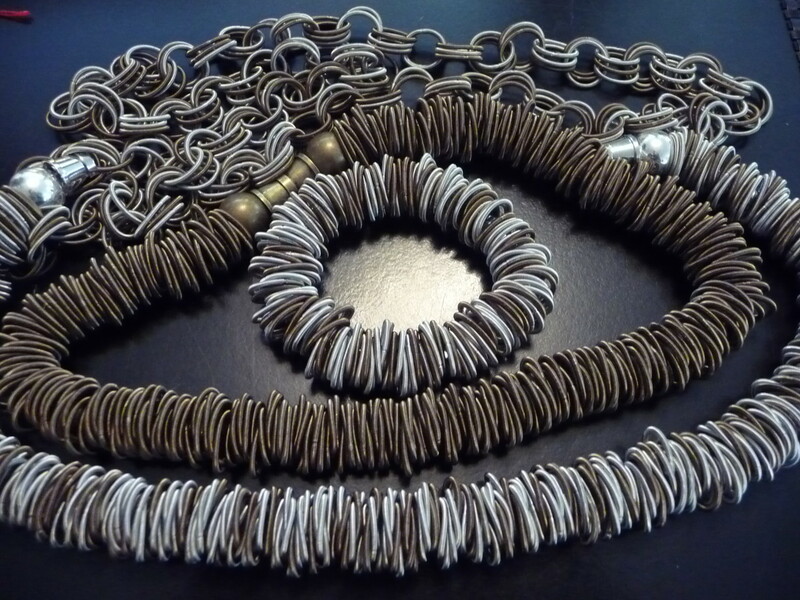 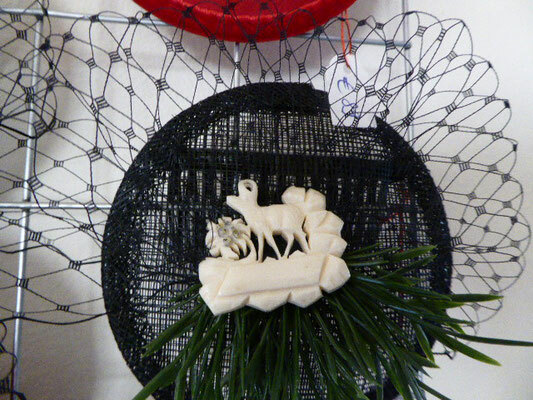 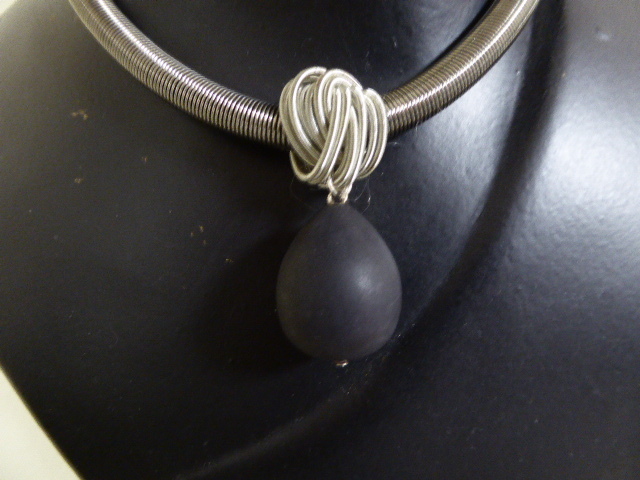 Jewelry made of piano wires......necklaces and bracelets......Fantastic!